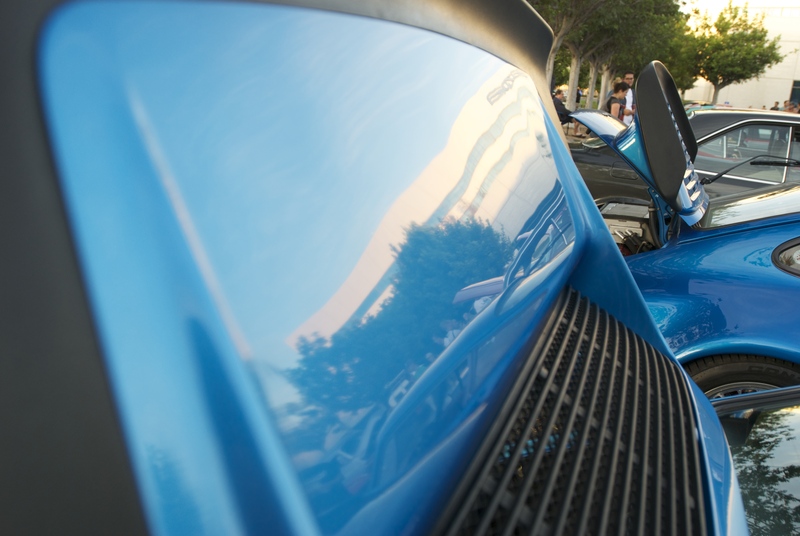 As a by-product of the unusually cold, clear mornings that Southern California has been experiencing, mother nature has produced some amazing lighting, which in turn translates to the beautiful highlights and reflections draped across a variety of vehicles present at cars&coffee/Irvine. 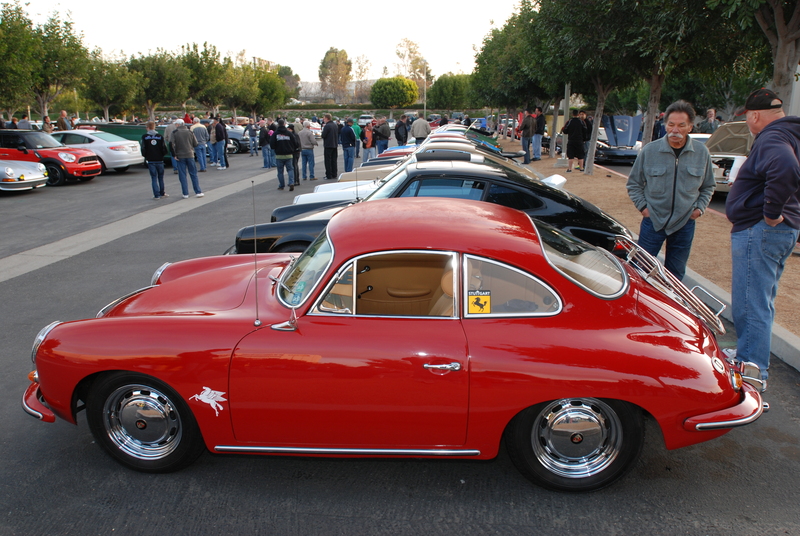 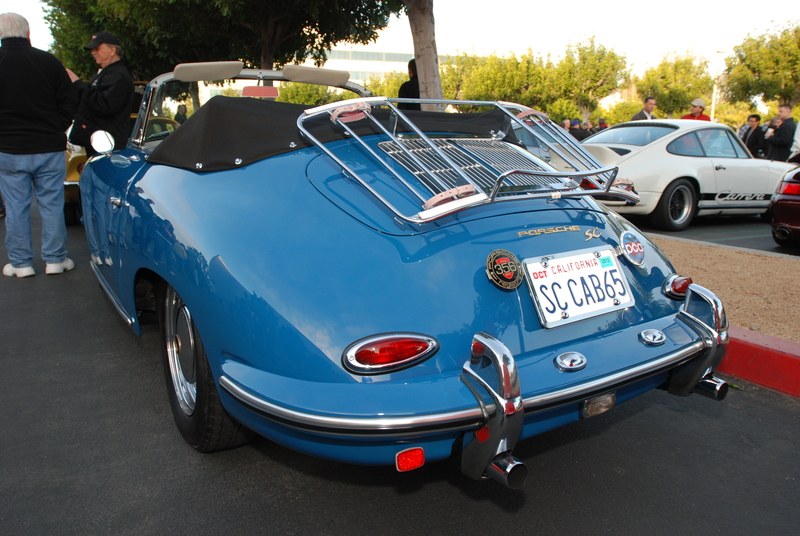 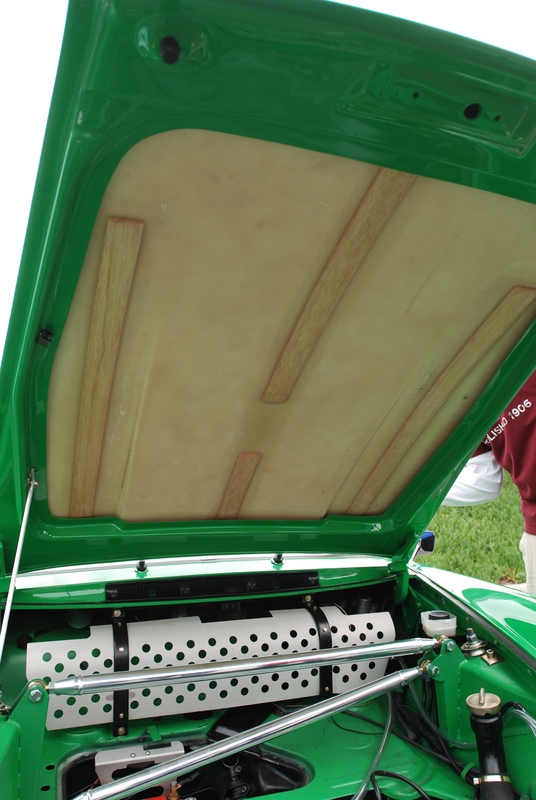 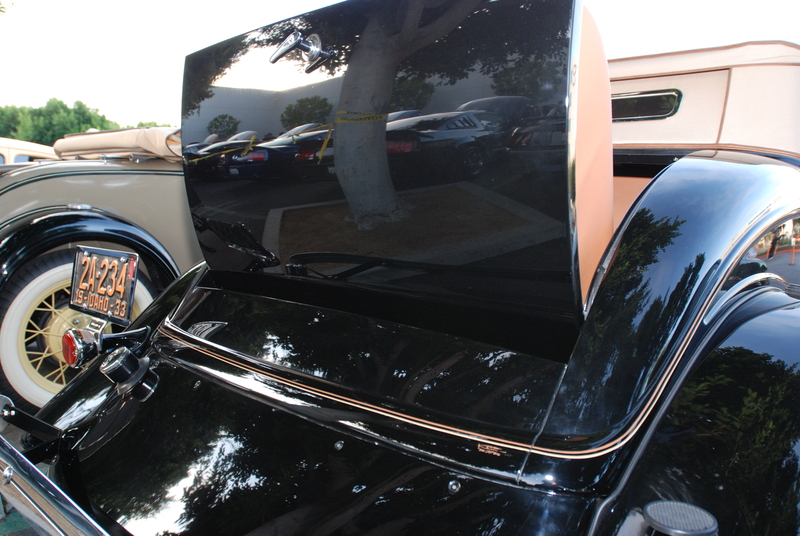 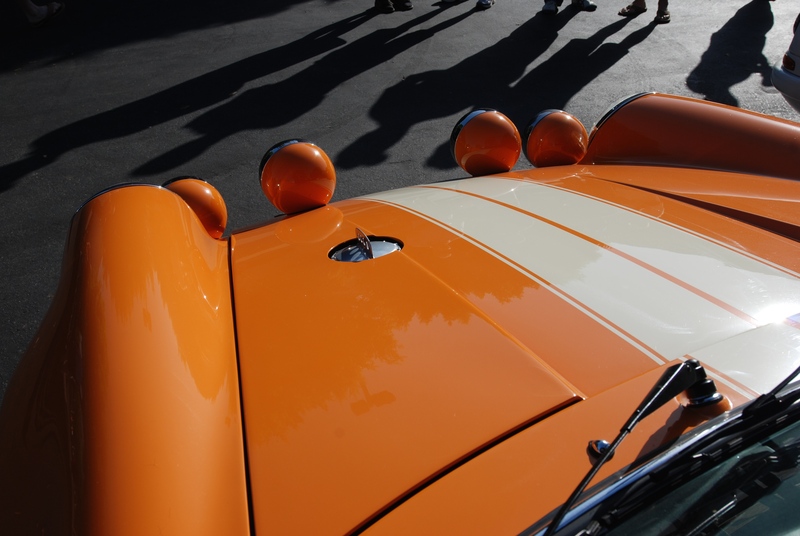 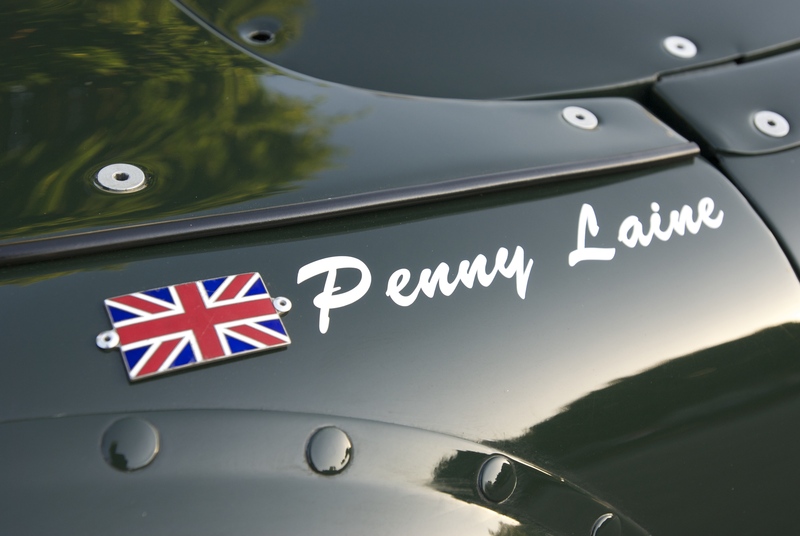 Rear deck lid with punched in louvers in classic “356 Outlaw” style. 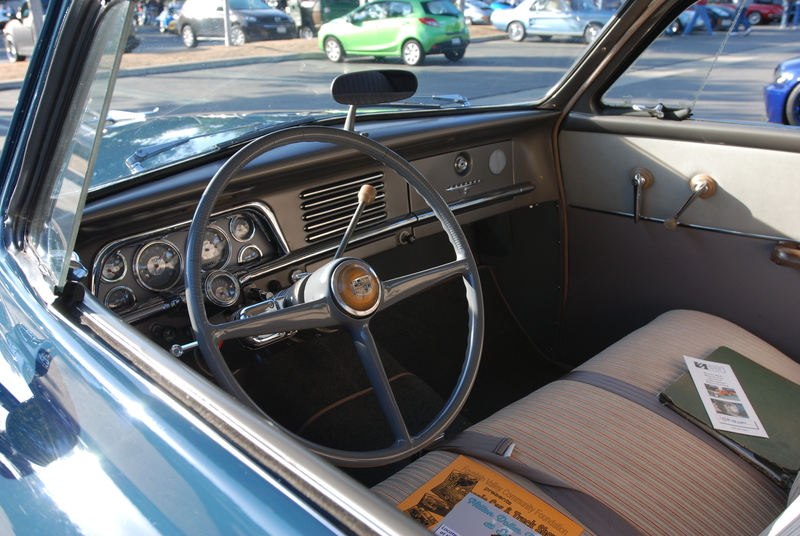 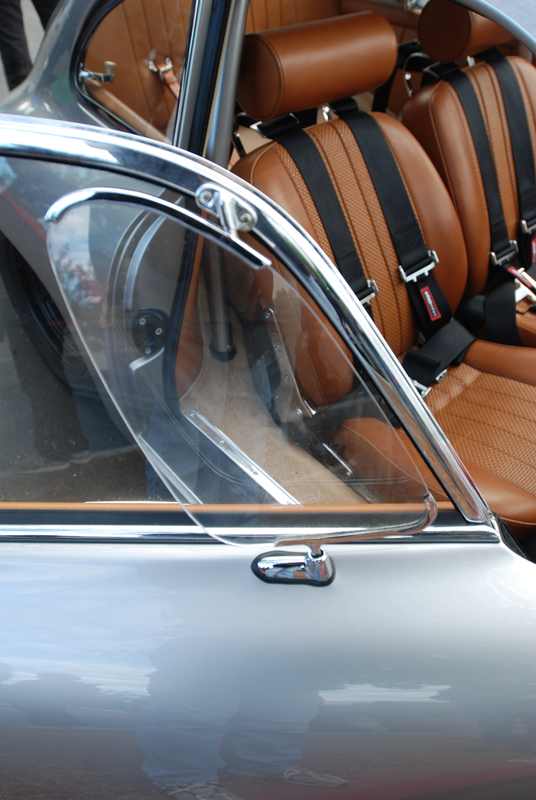 An incredible interior produced in saddle colored leather (as seen above). 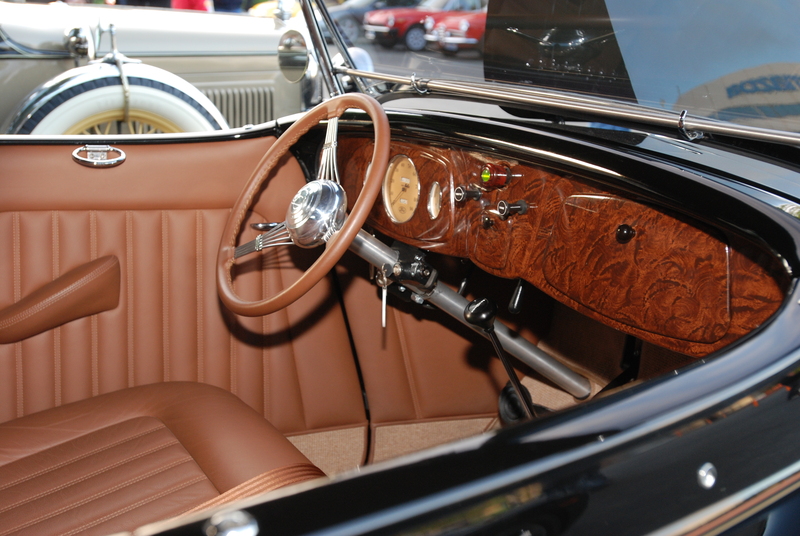 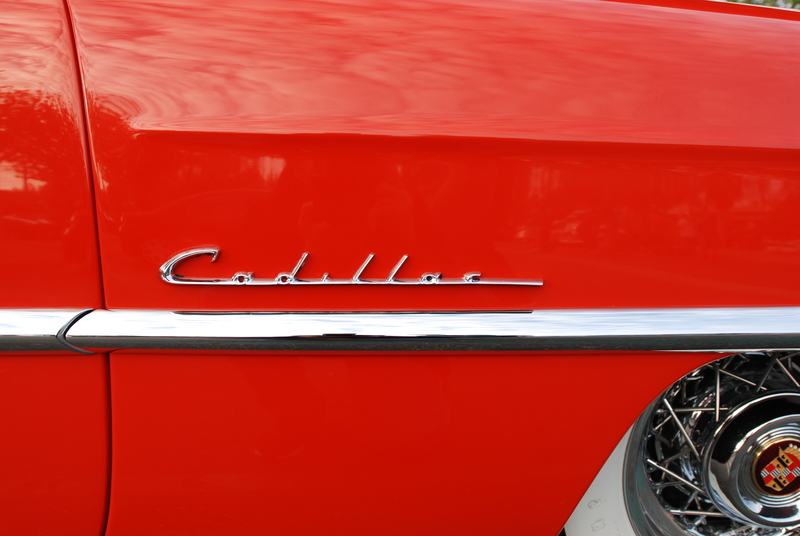 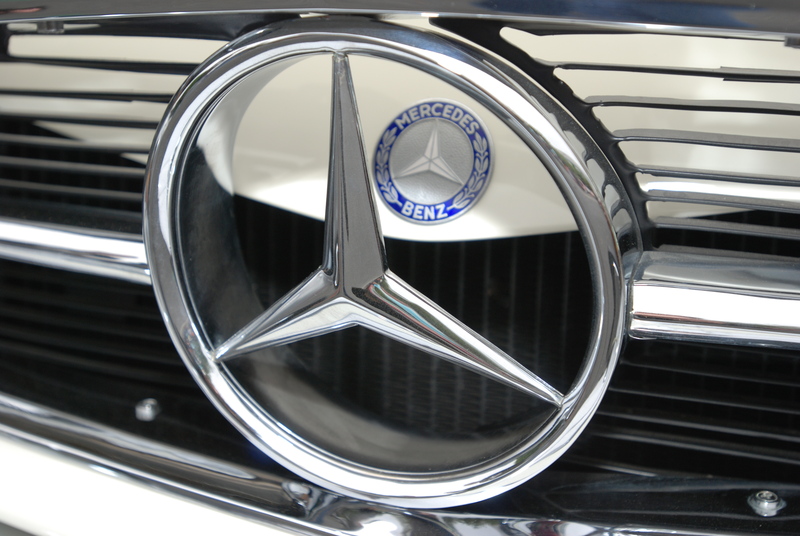 The scent of the leather instantly reminded me of sitting in my grandfather’s 1950’s vintage Mercedes-Benz cabriolet as a little kid, surrounded by its aromatic, red leather interior. 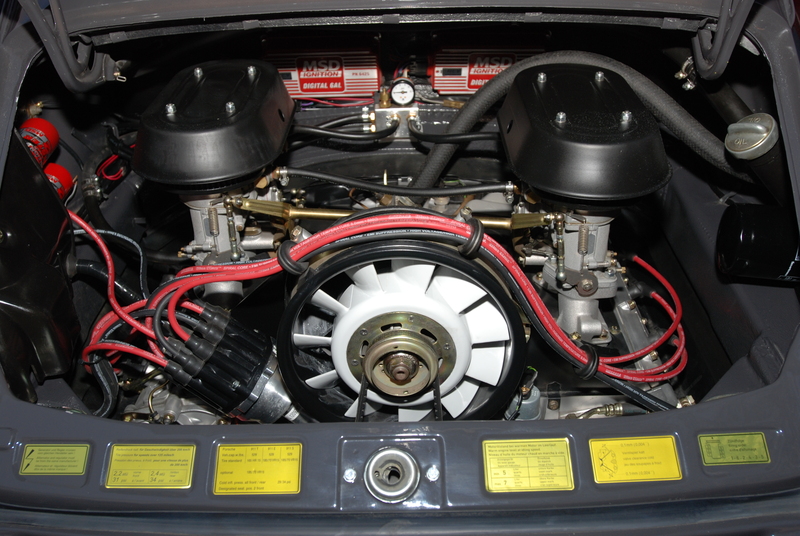 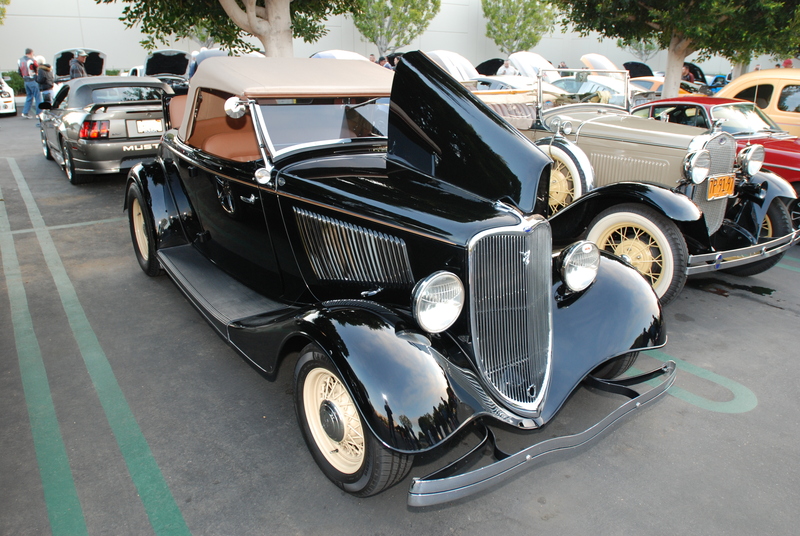 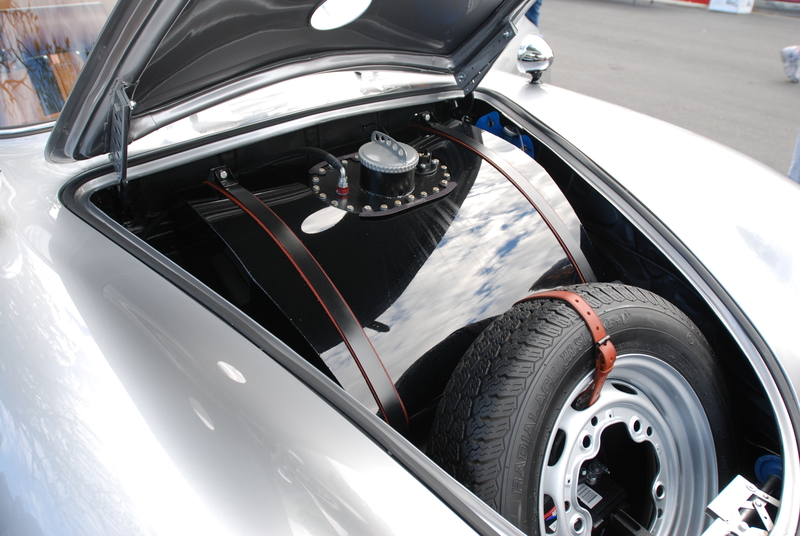 Even the fuel tank located in the front trunk ( below) was finished to the same level of detail as the silver exterior. 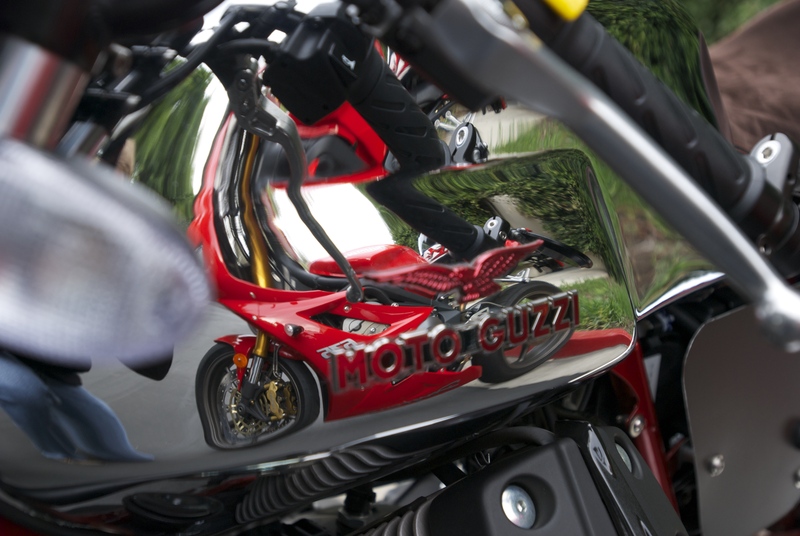 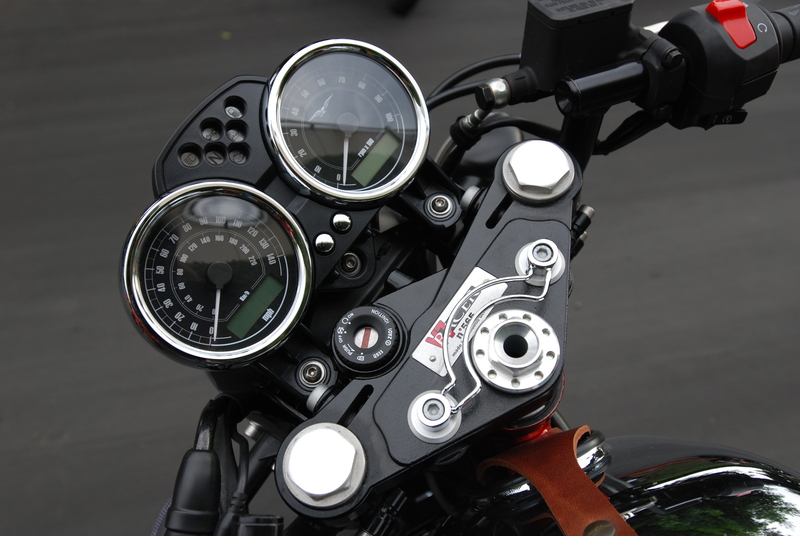 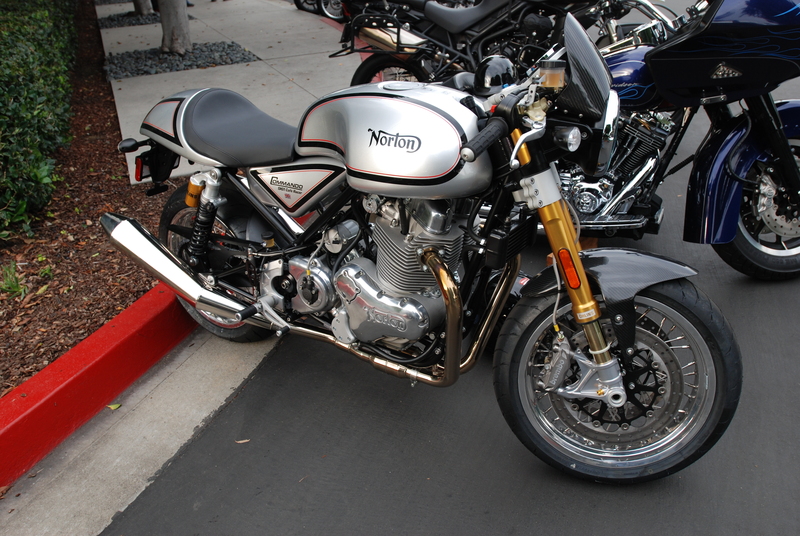 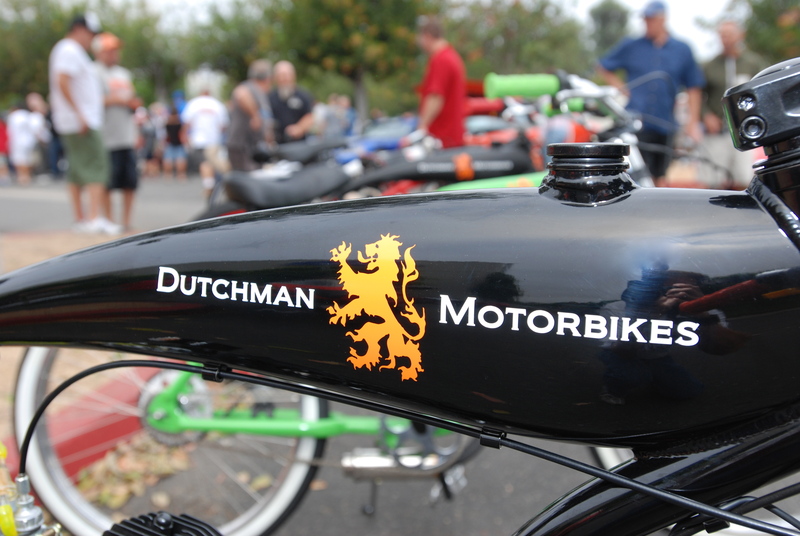 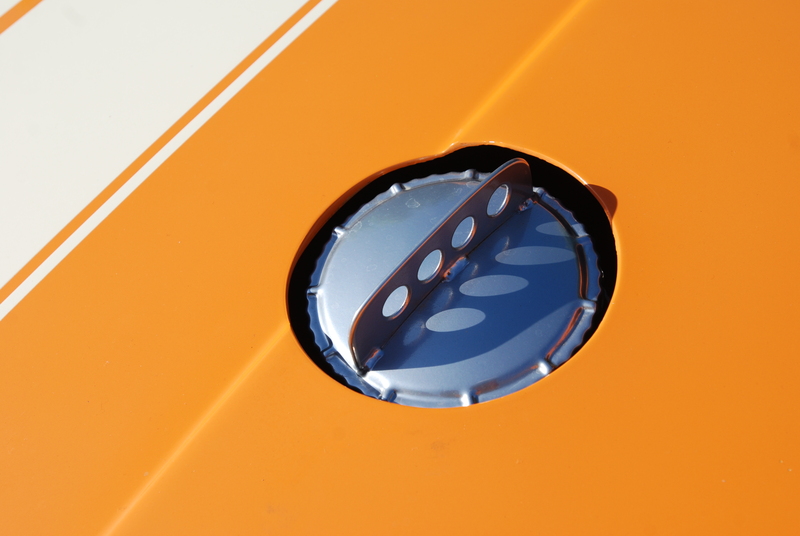 The finish on the fuel tank shone like a mirror, recreating the images of the sky and cloud cover floating overhead. 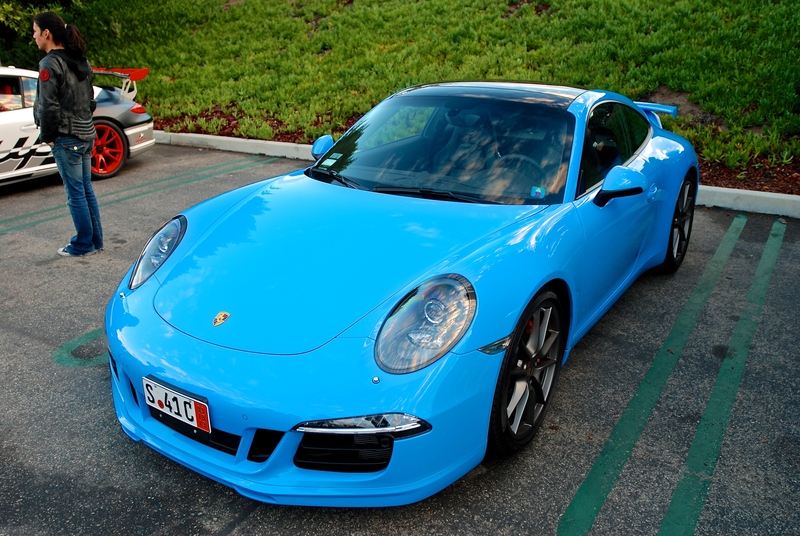 A brand new 2014 Porsche 991 coupe, resplendent in Riviera Blue. 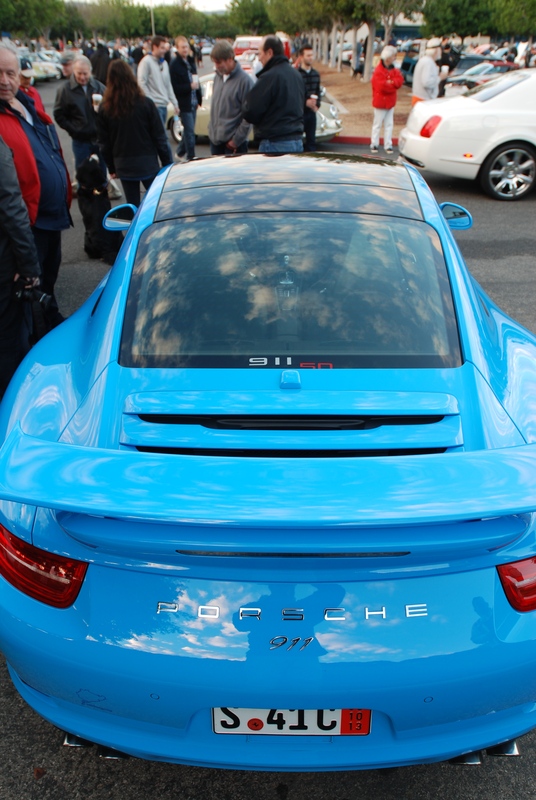 According to the owner (who arranged for european delivery of this special order Type 991), and upon receipt of his car in Stuttgart, was told by Porsche that this is the only 991 that has been painted Riviera Blue… how cool is that! 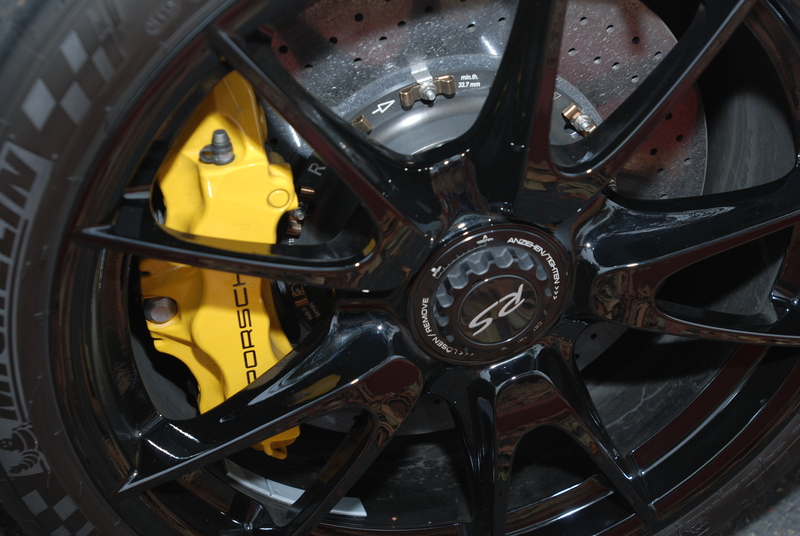 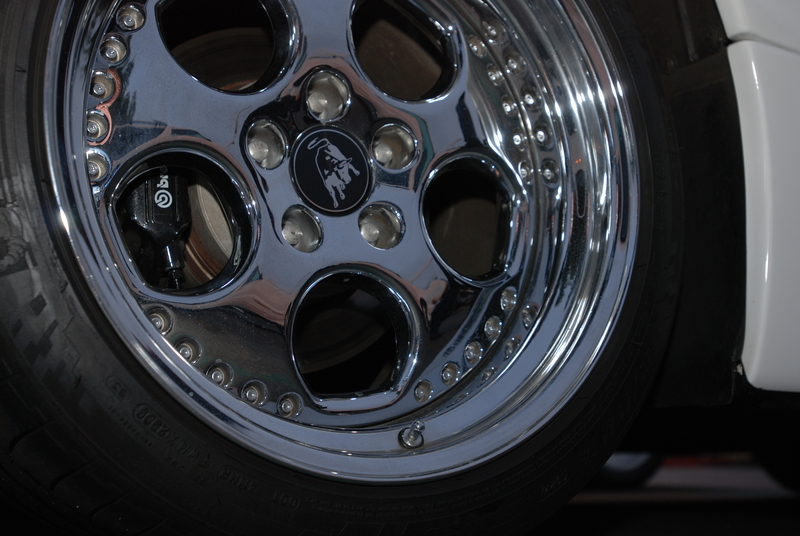 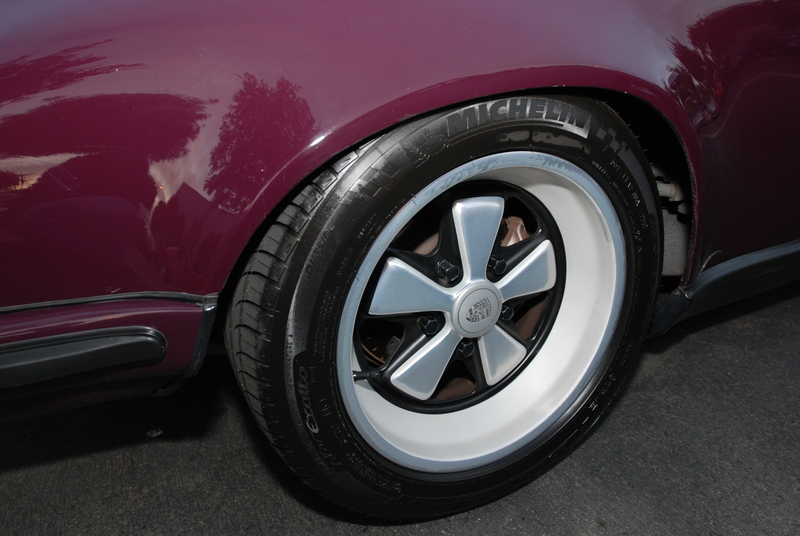 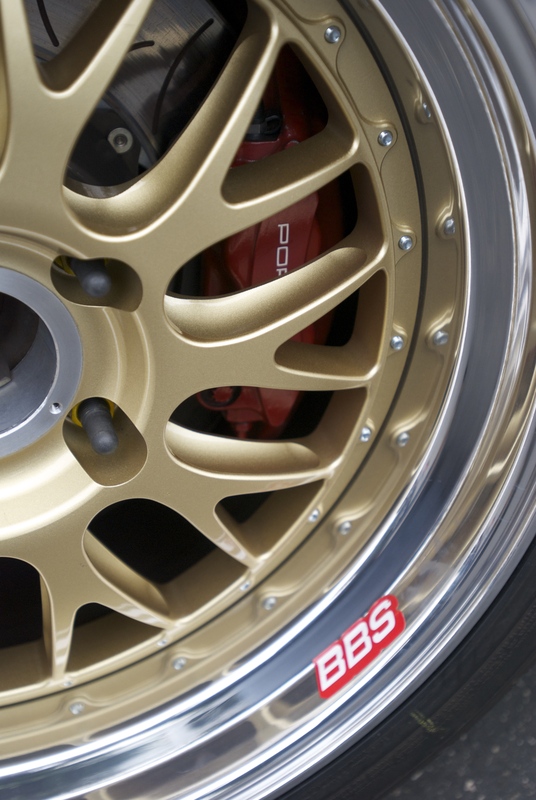 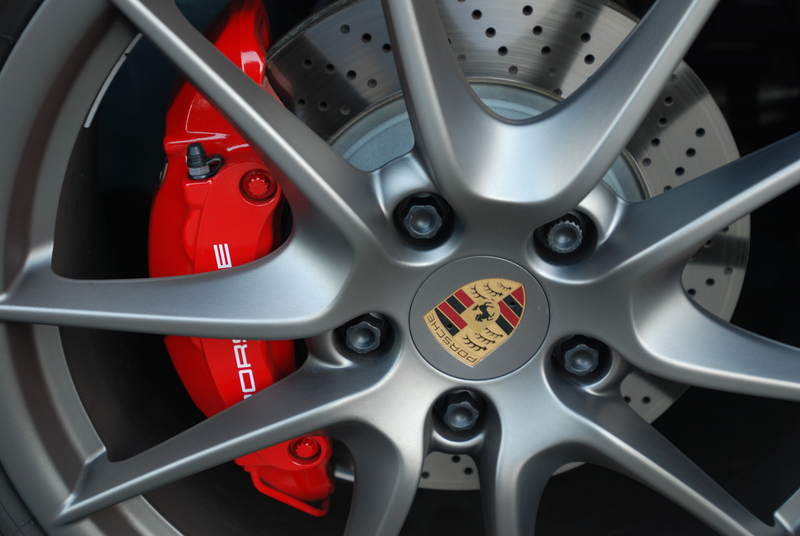 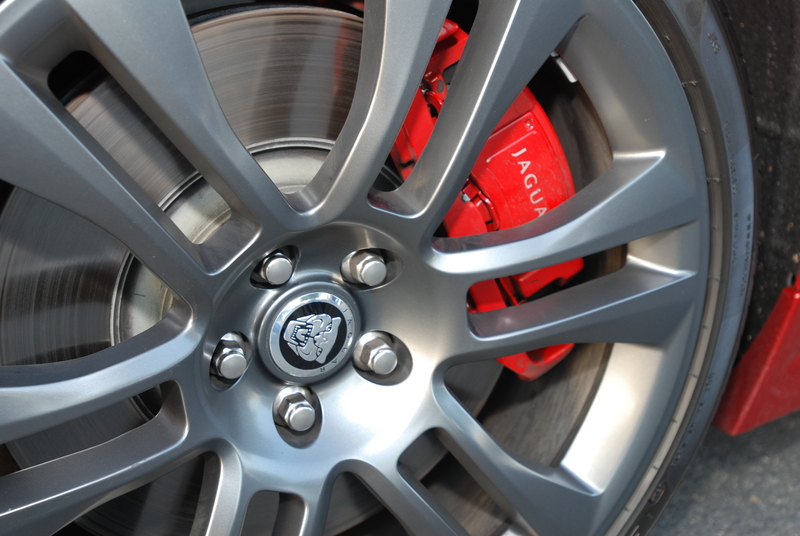 A close-up view of the 2014 Porsche big red calipers and massive cross drilled rotors, wrapped by a 20 inch Carrera S wheel, complete in its painted (optional) Platinum Satin finish. 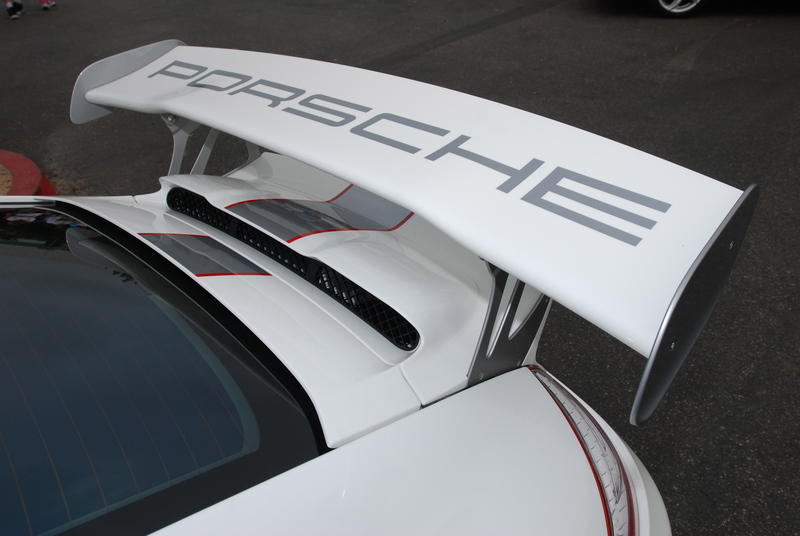 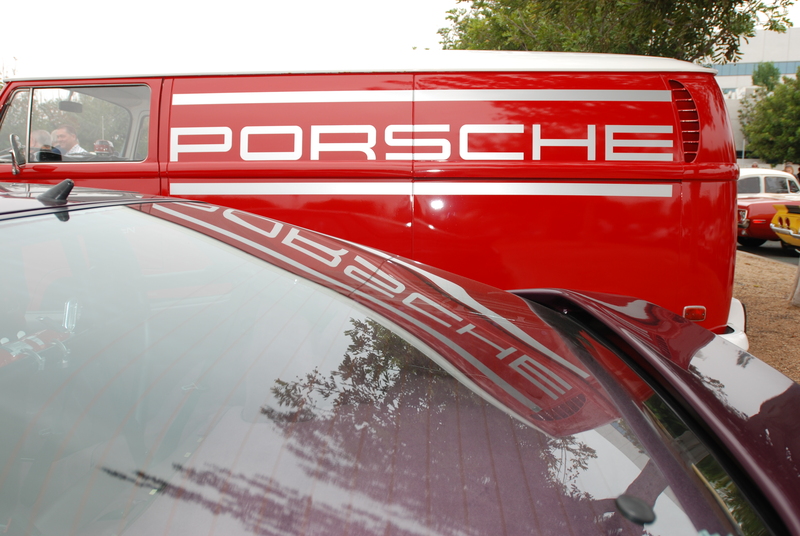 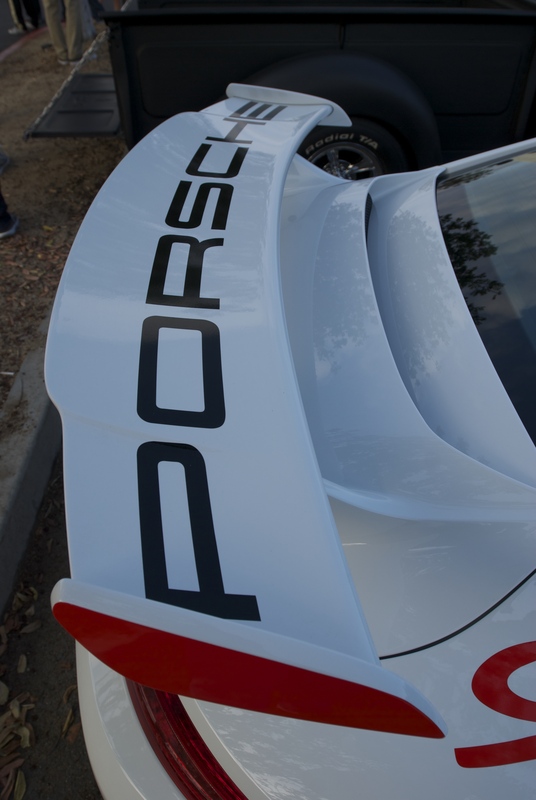 A view of the optional Aerokit Cup package rear wing, and selected (optional) “Porsche 911” rear badging. 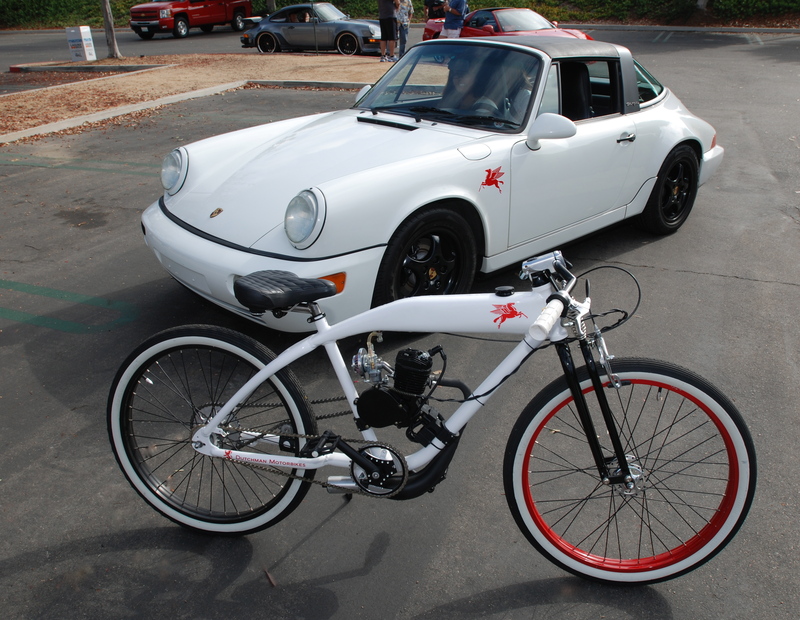 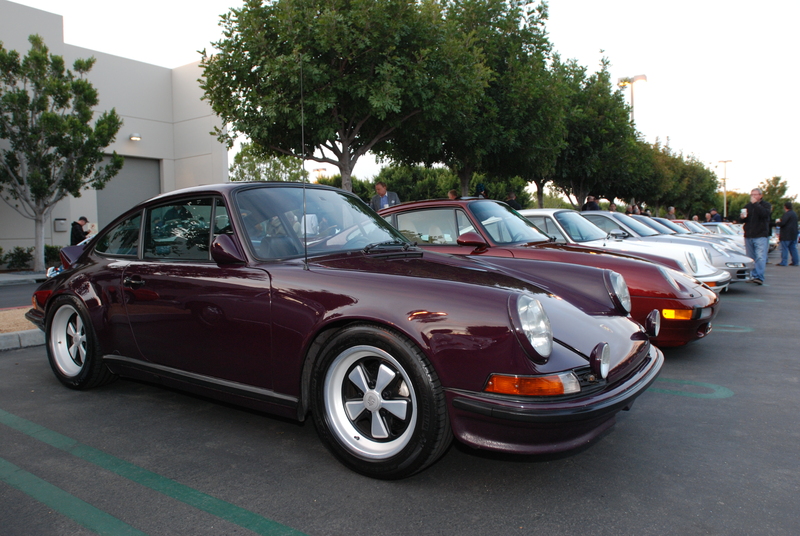 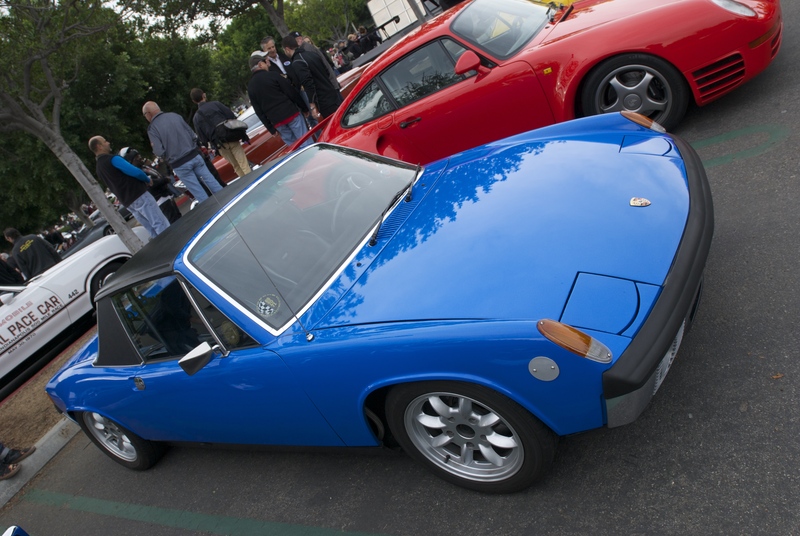 Parked among the group along Porsche row were multiple examples of 1970s vintage 914 models. 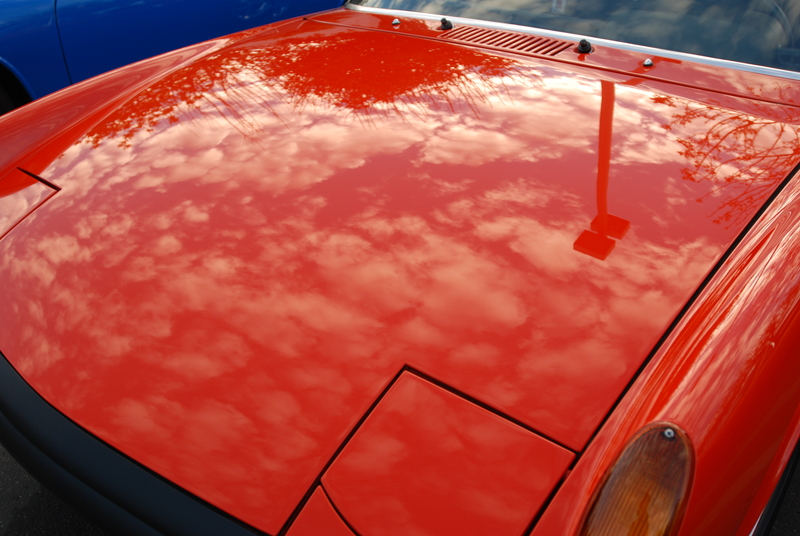 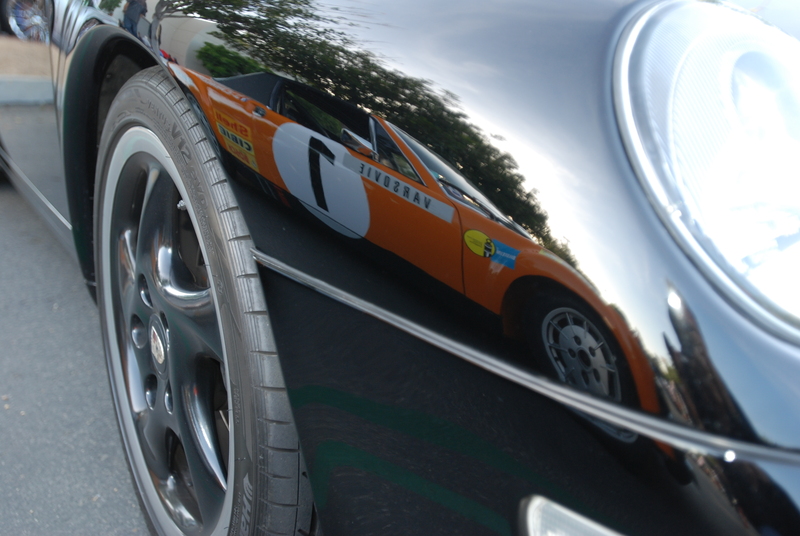 In this case, the front hood of a restored tangerine colored Porsche 914-6, bathed in reflections. 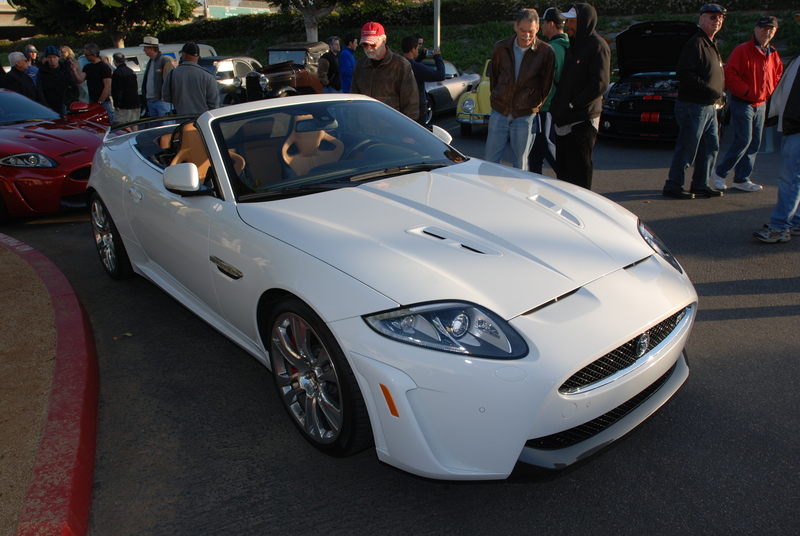 My next stop would be at the Featured lot, where on this morning I encountered the stunning Jaguar XK-150 roadster seen below, parked amidst a row of Corvettes, and reflecting on its surroundings. 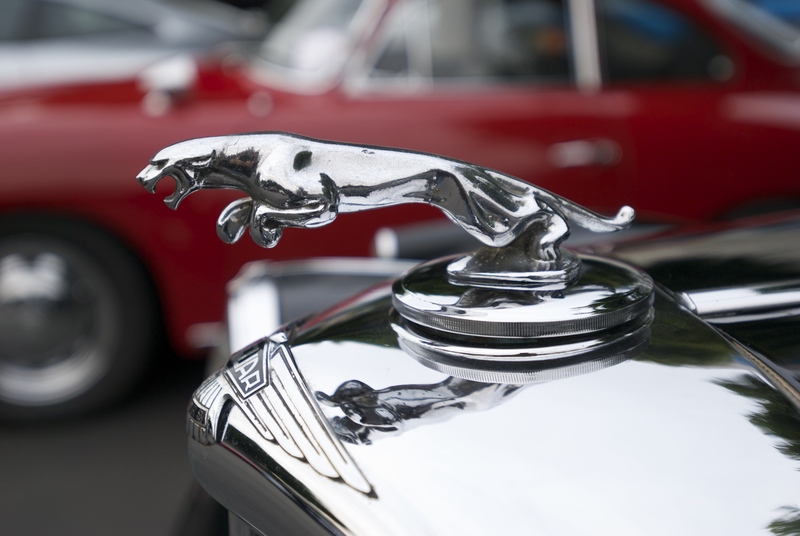 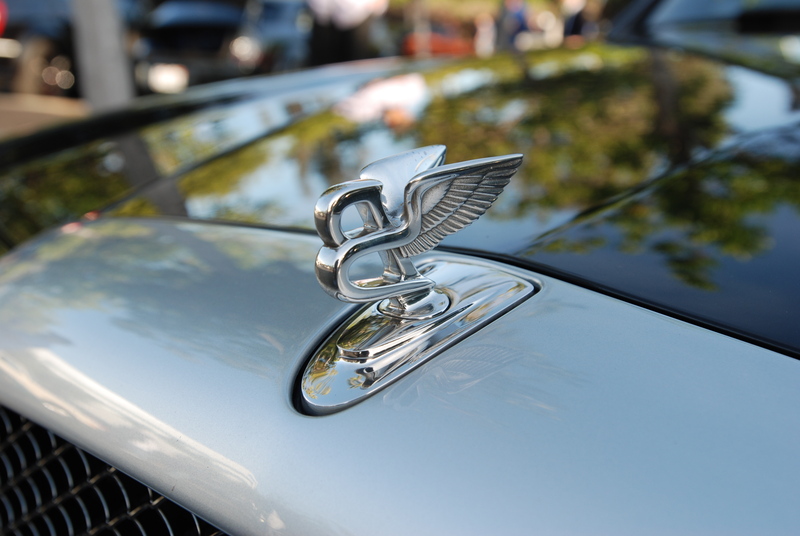 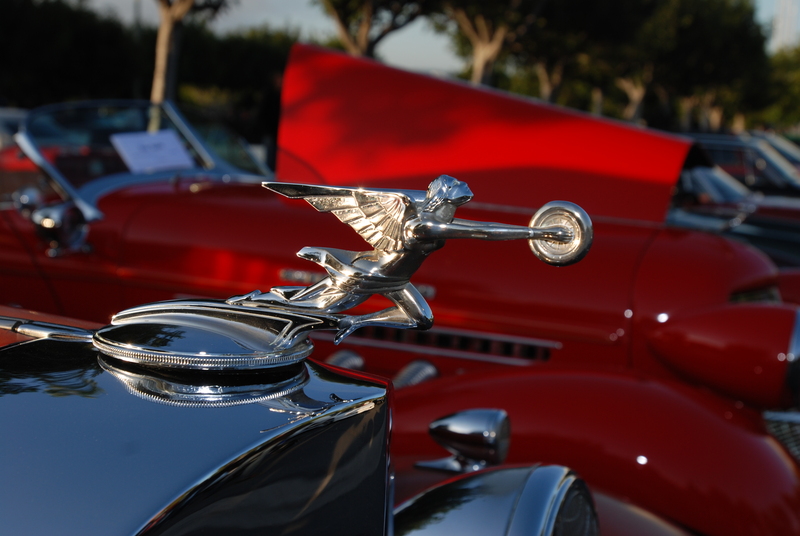 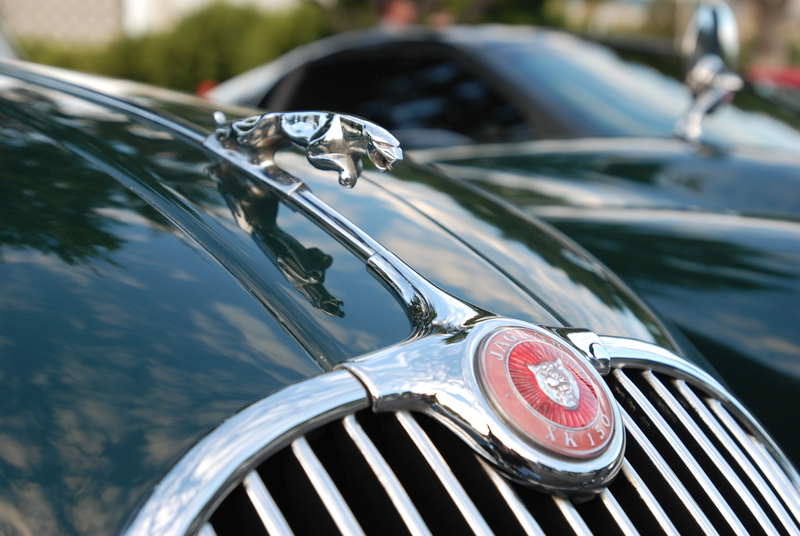 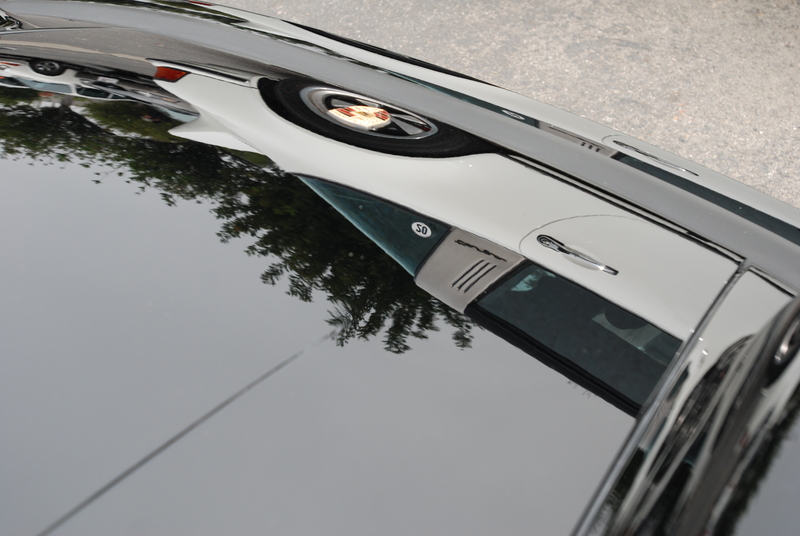 A close up of the XK-150s hood ornament and front grill badging. 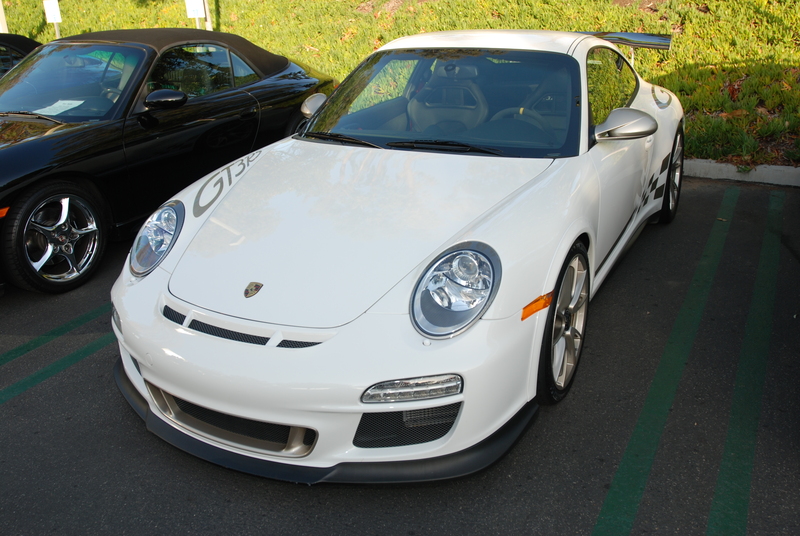 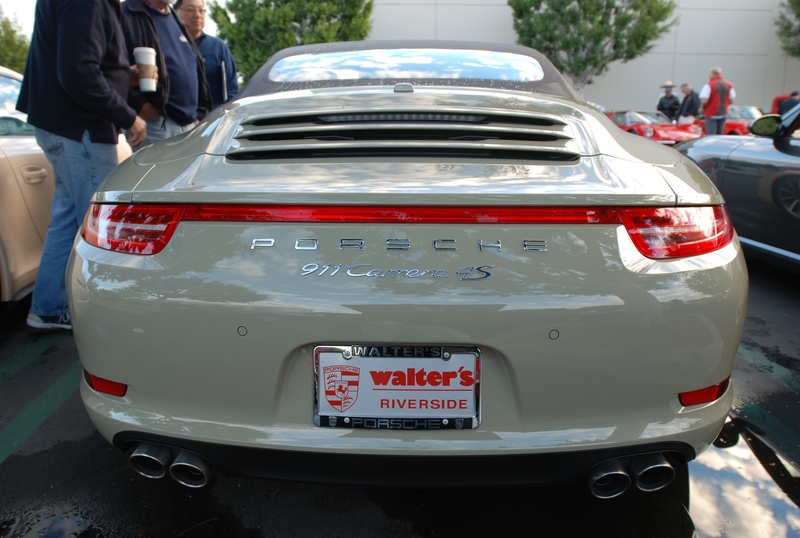 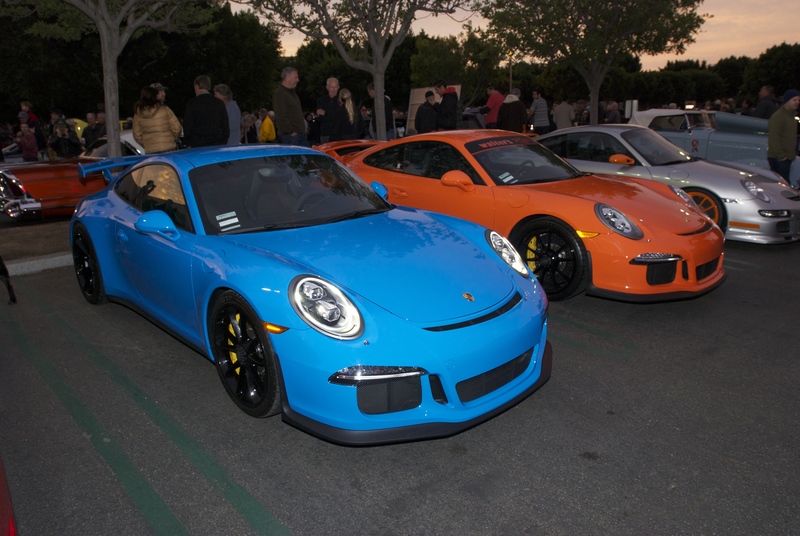 On the other side of the Featured lot were these two, brand new 2014 Porsche 991s courtesy of Walter’s Porsche from Riverside. 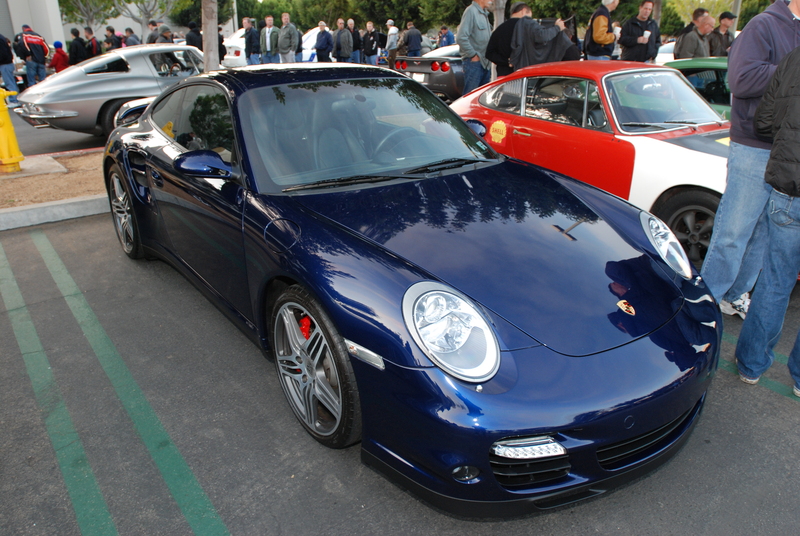 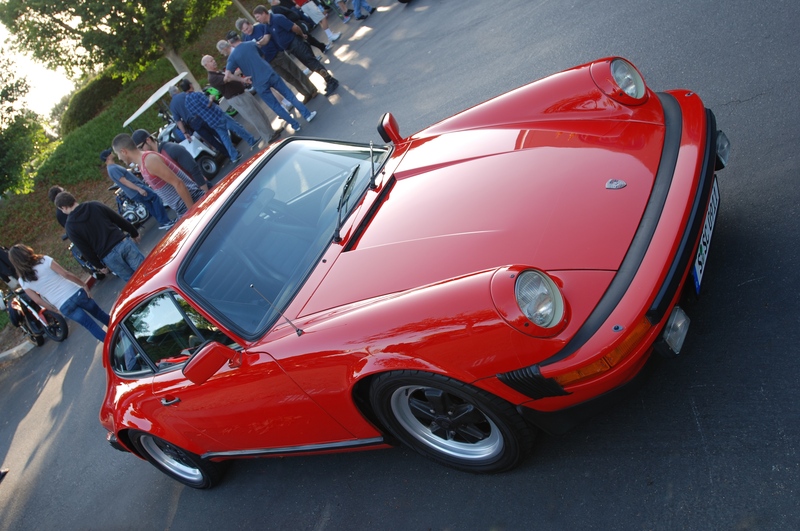 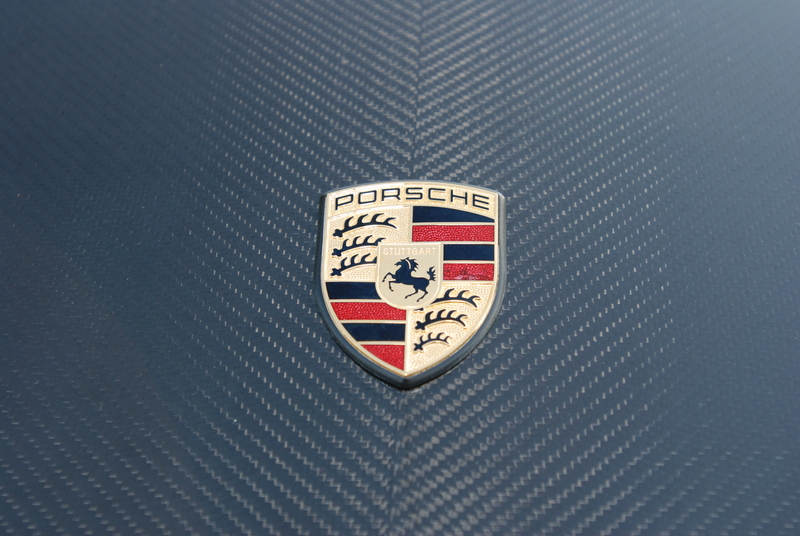 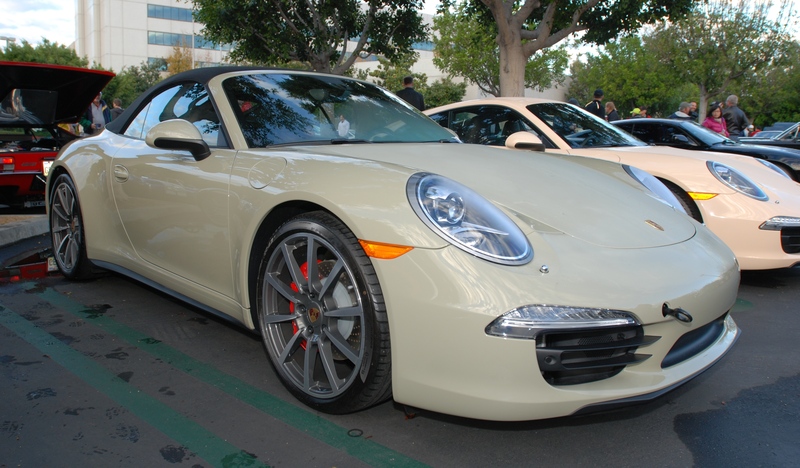 The 911 Carrera 4S cabriolet as seen below, turned out to have been painted a very unique, and special order color. 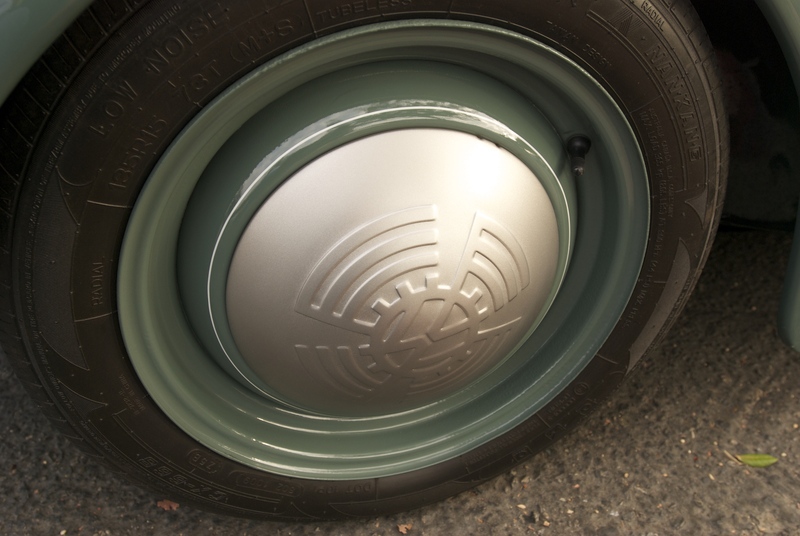 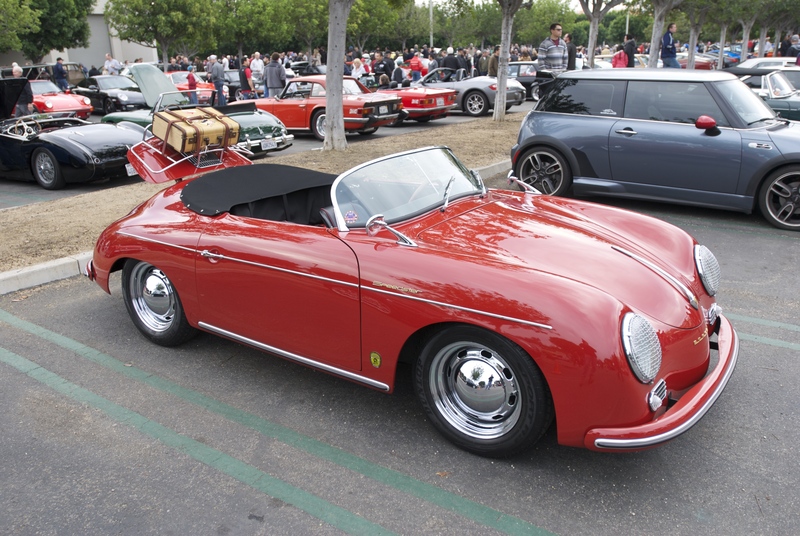 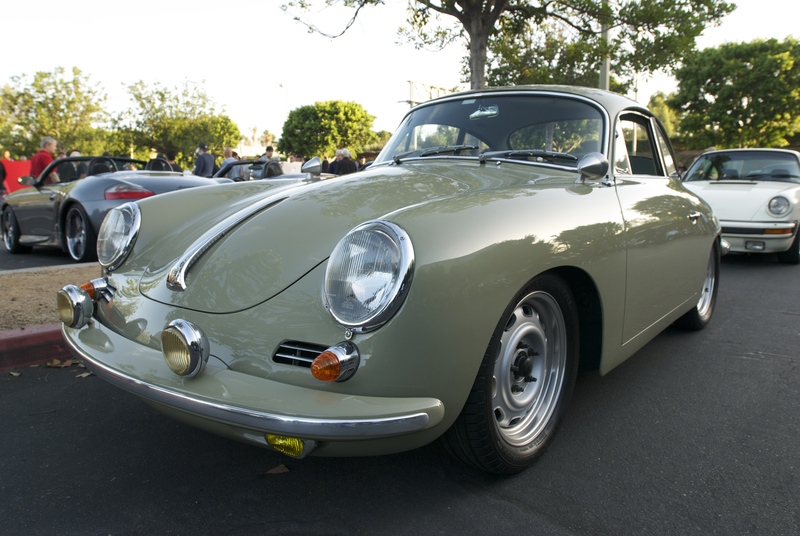 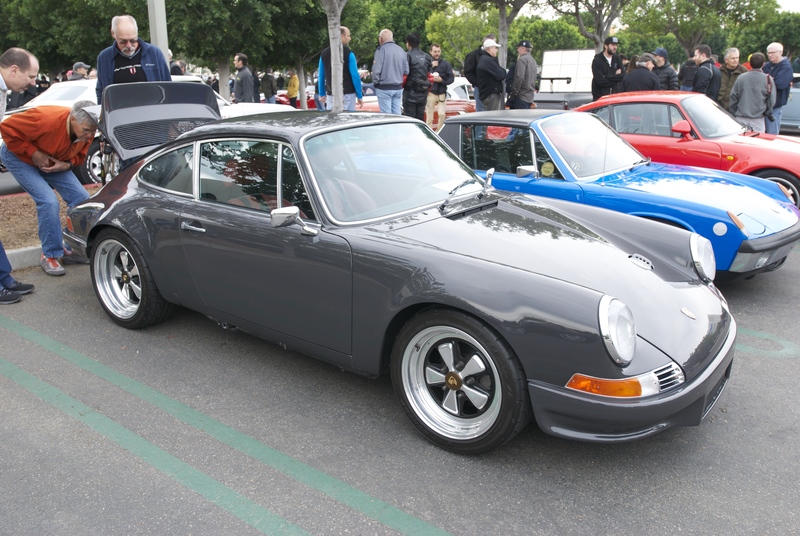 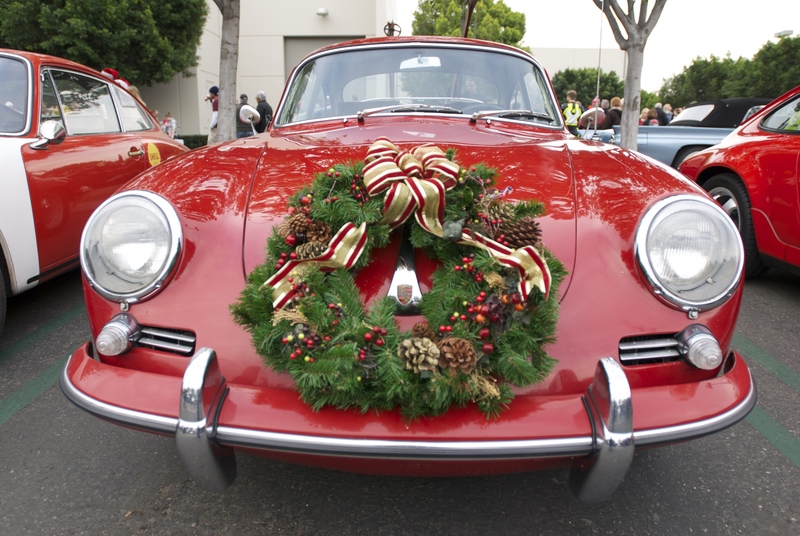 The color in question turned out to be Stone Gray, which was originally offered as a “special order color”, during the 1957 through 1959 Porsche 356 model years. 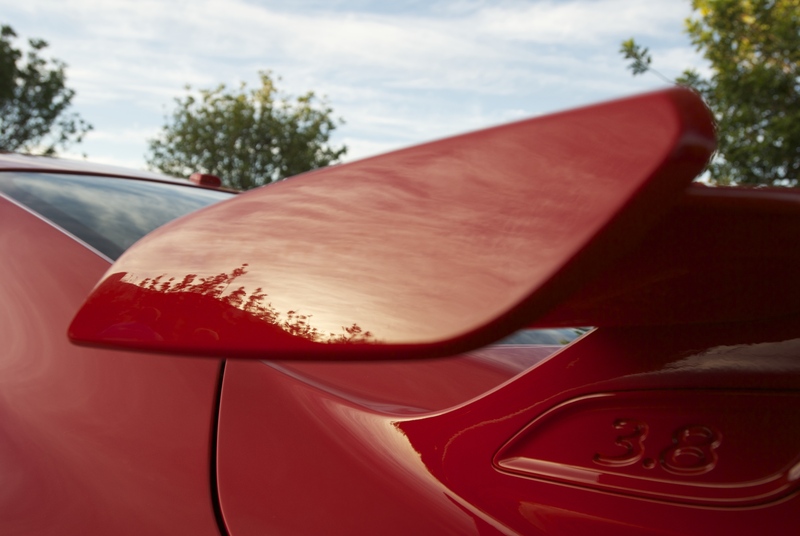 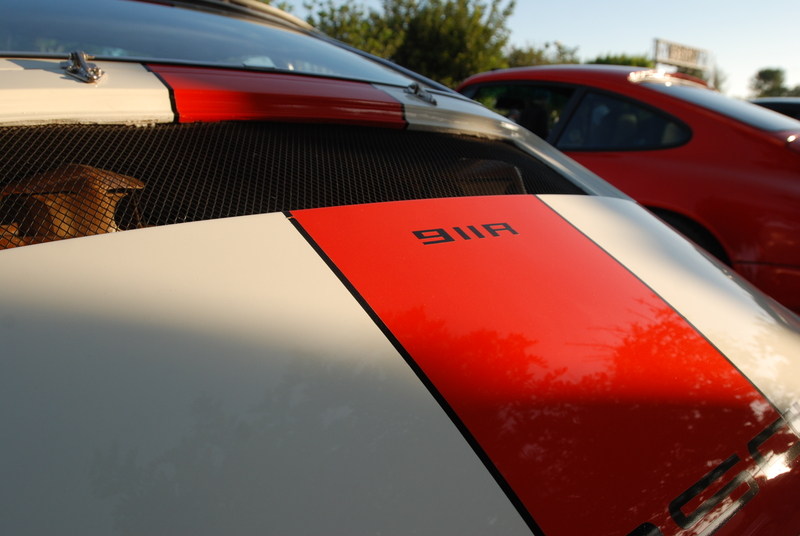 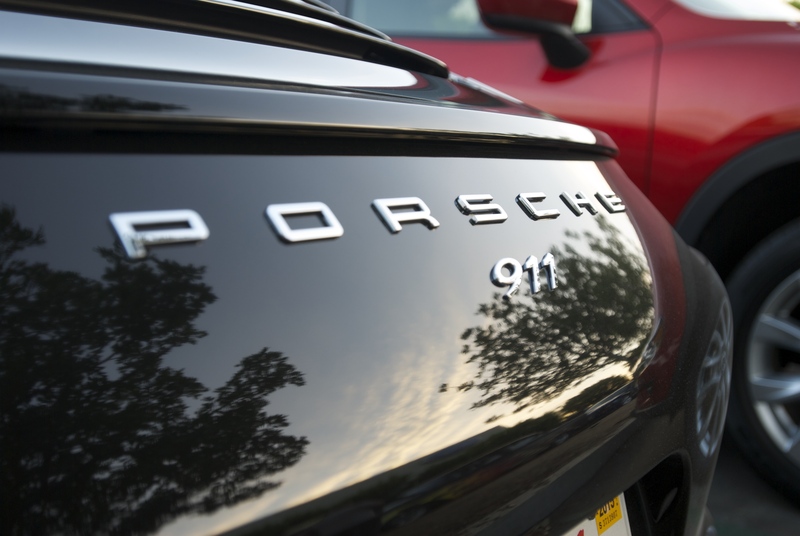 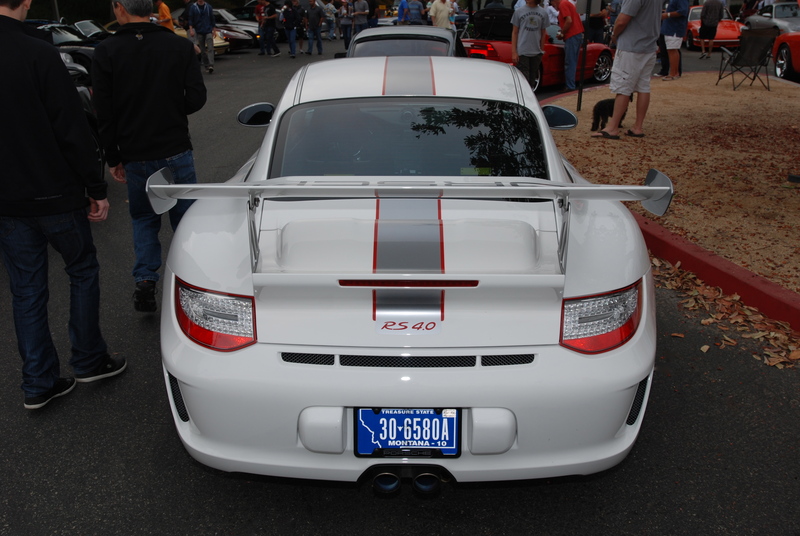 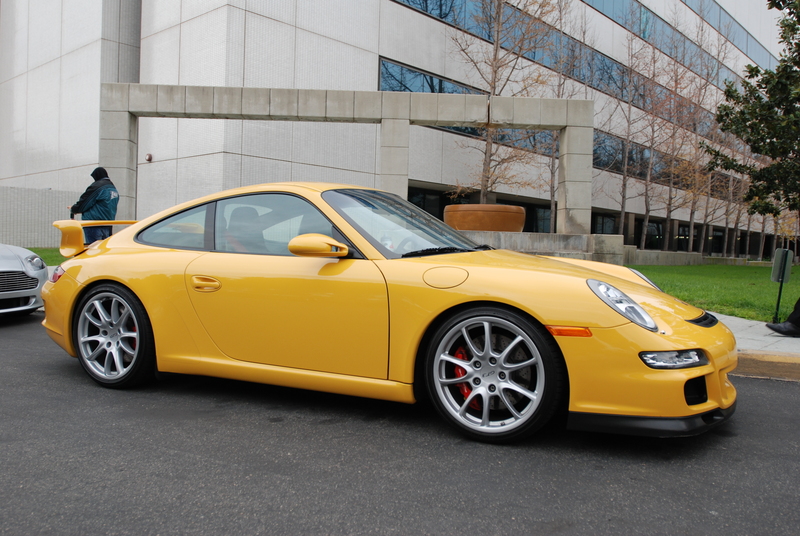 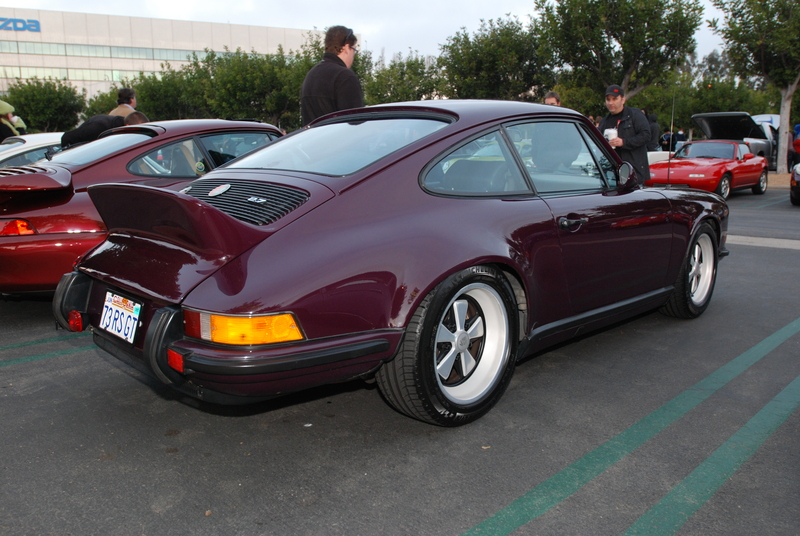 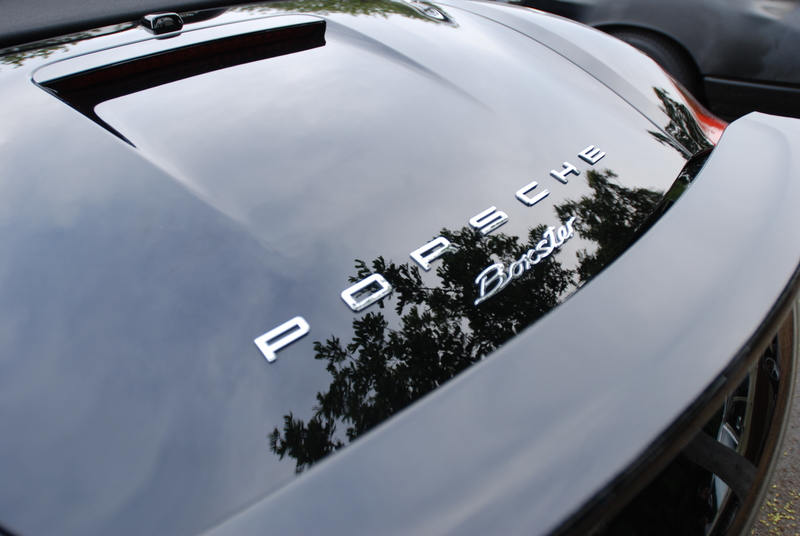 Another visible cue used for identifying a Type 991 Carrera 4S; the red, horizontal reflector strip, bridging the gap between the rear tail lights, and inset just below the rear deck lid. 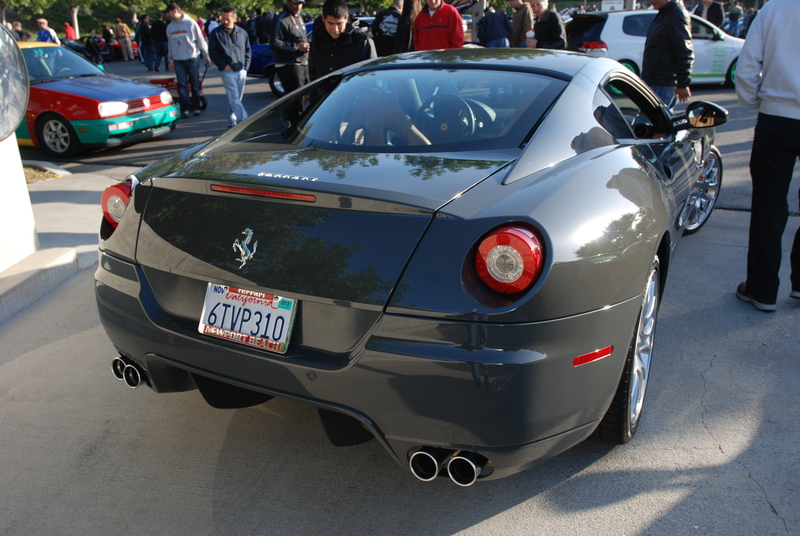 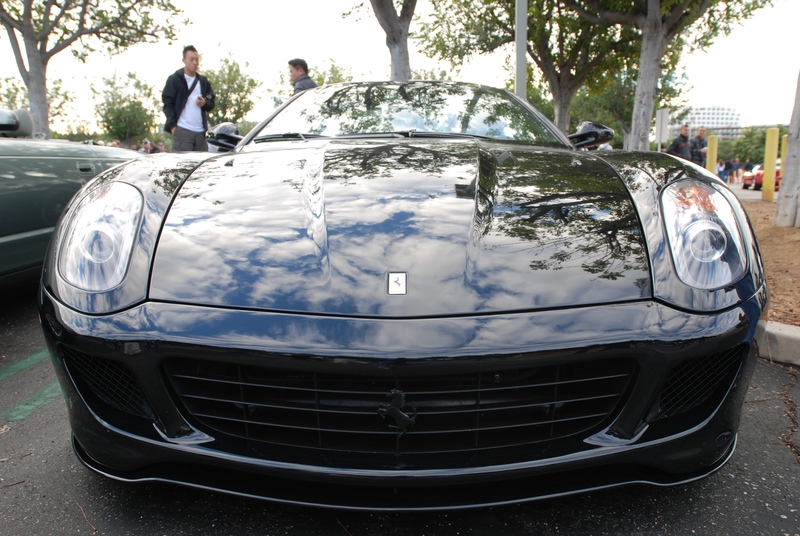 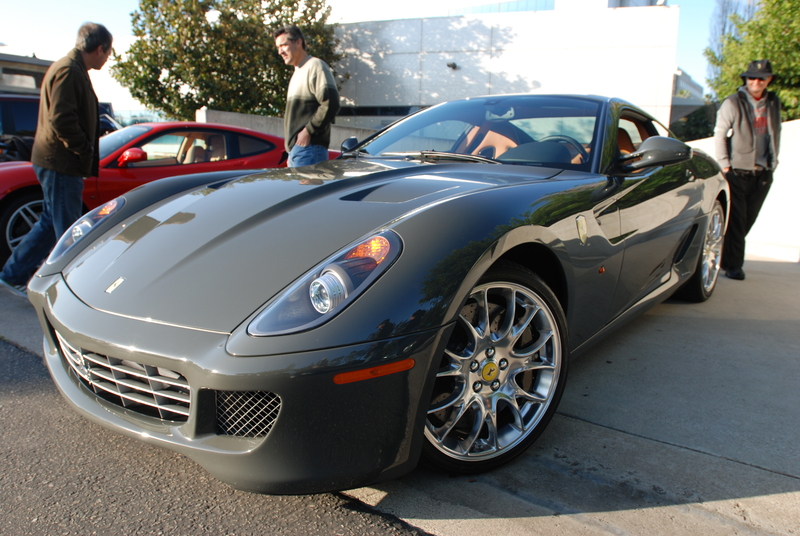 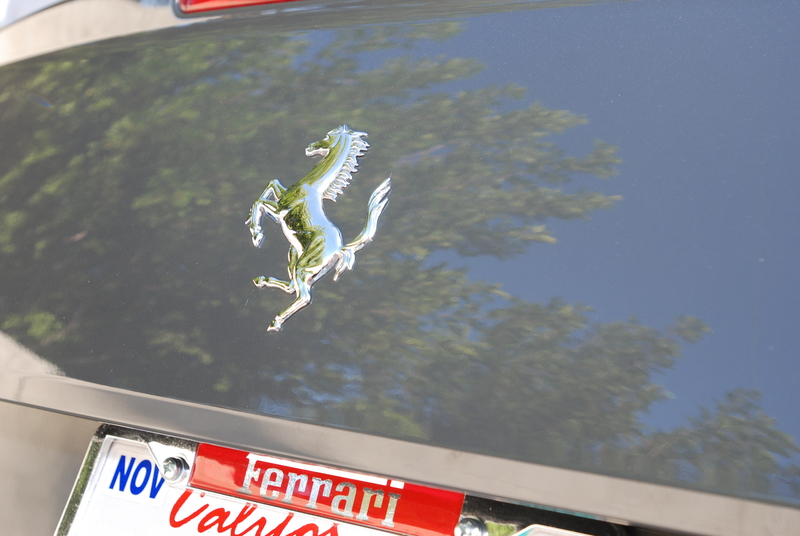 Making a rare appearance at cars&coffee was this black (Nero Pastello) Ferrari 599 as seen below. 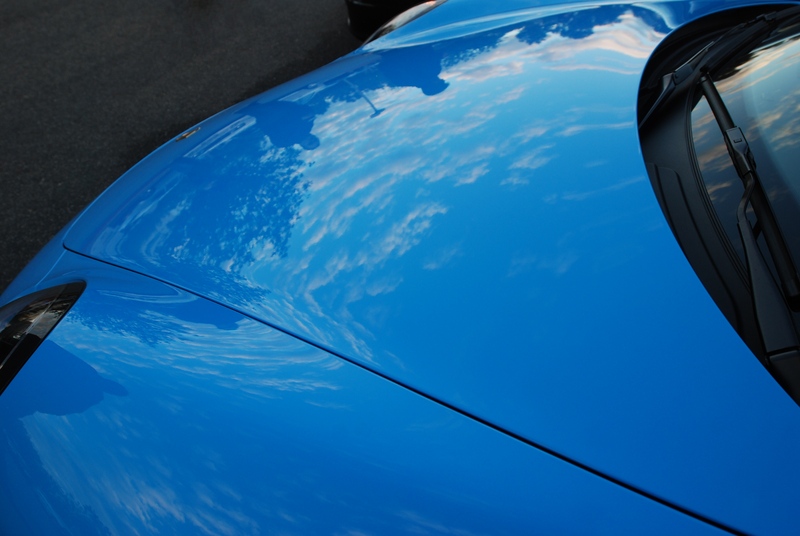 One could not ask for a better color on a 599, for showcasing the incredible reflections wrapping themselves across the striking contours of the bodywork. 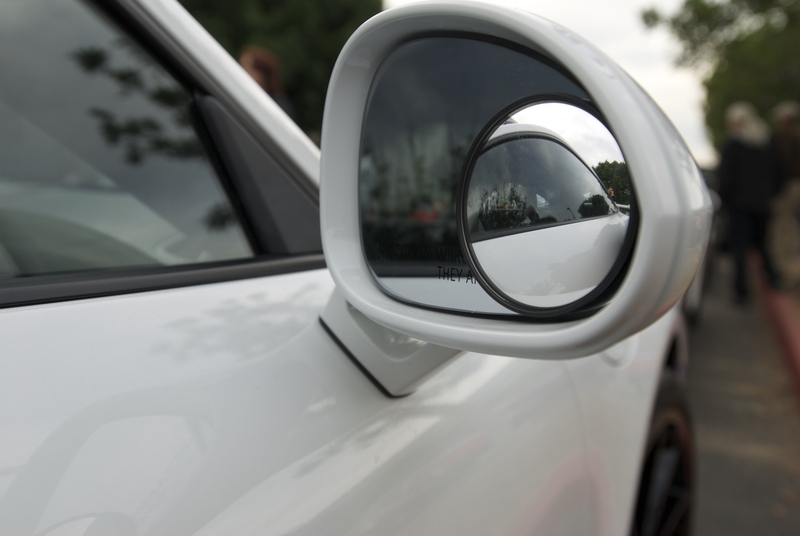 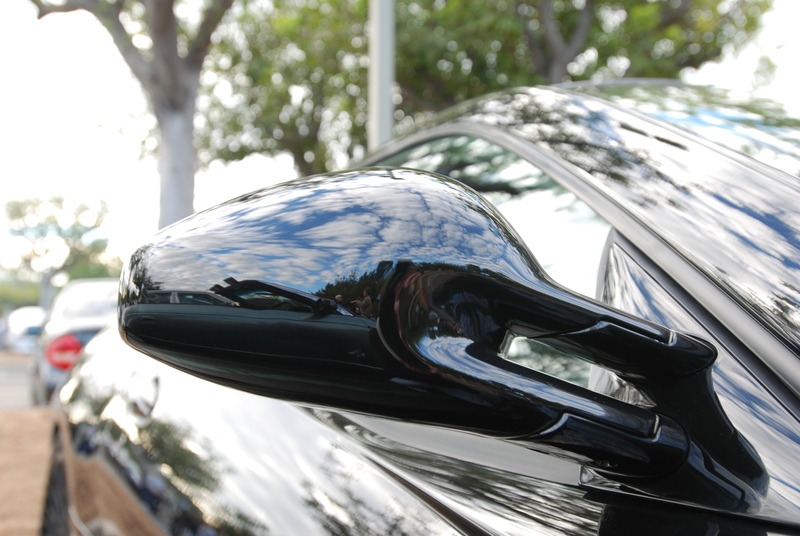 Even the side mirrors held surprises for anyone willing to stop and take the time to study the variety of details found across the Ferrari. 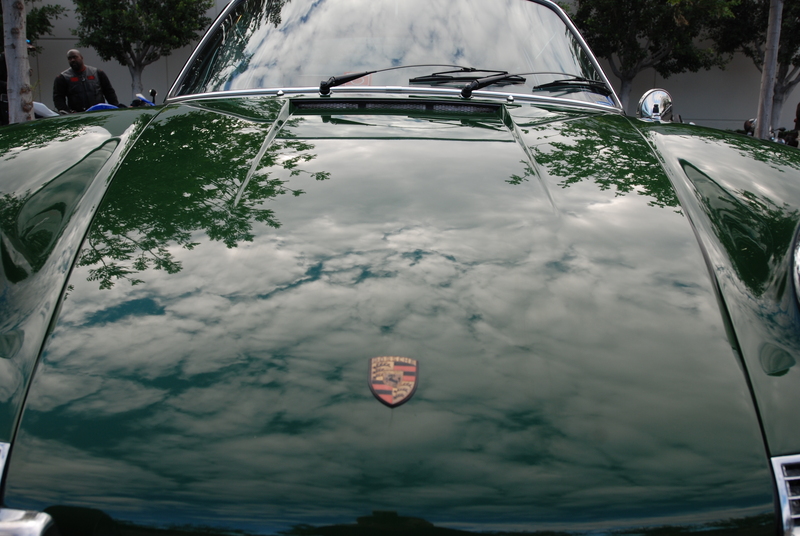 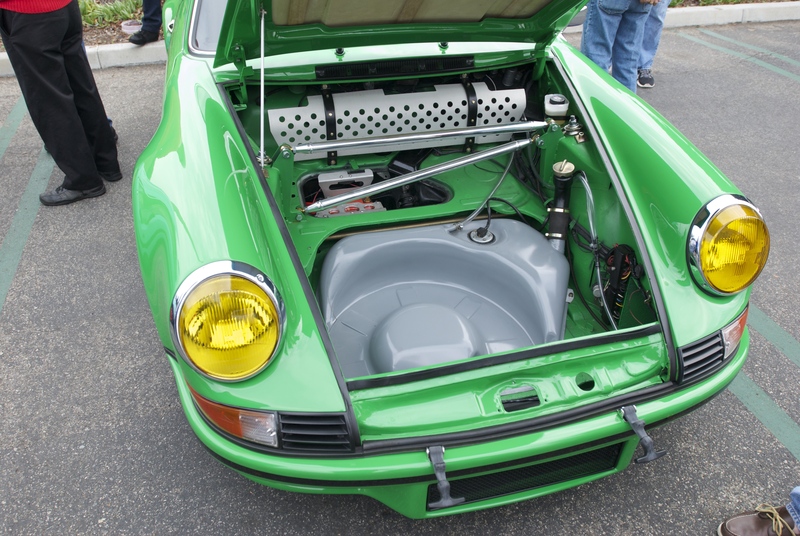 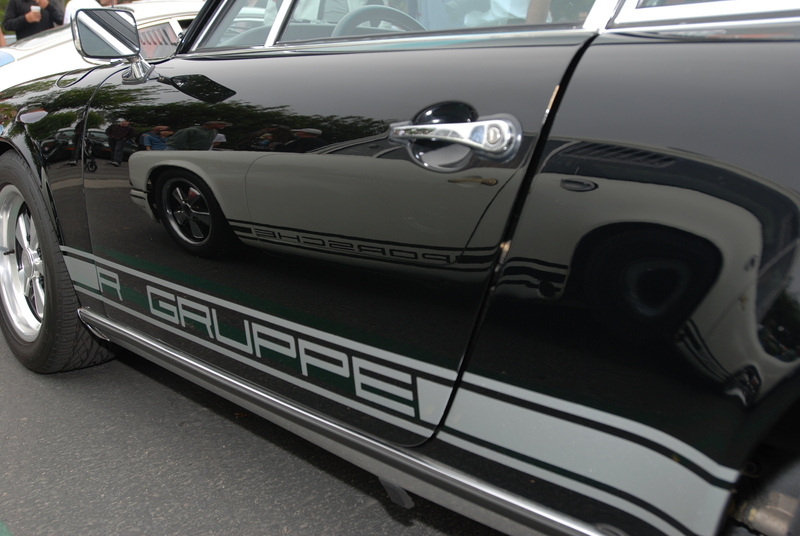 Returning to Porsche row, I came across another frequent visitor; this beautiful Irish Green 1968 Porsche 912, complete with reflections defining the contours of its front hood and fenders. 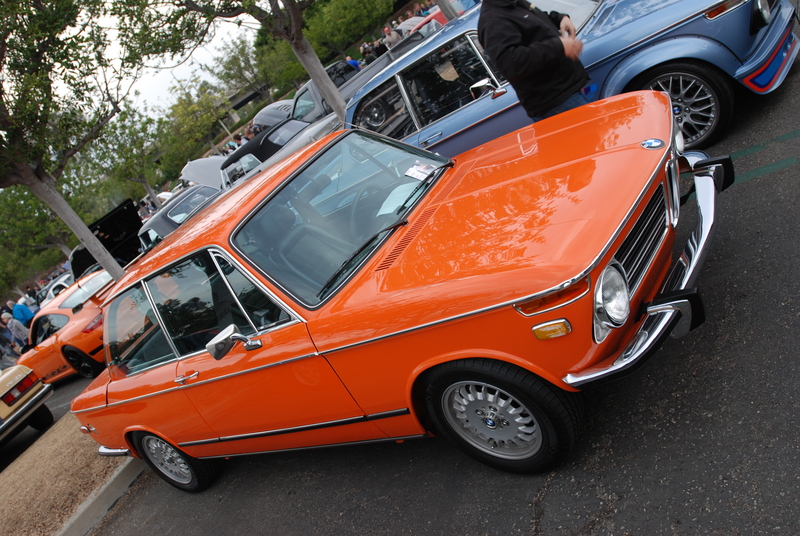 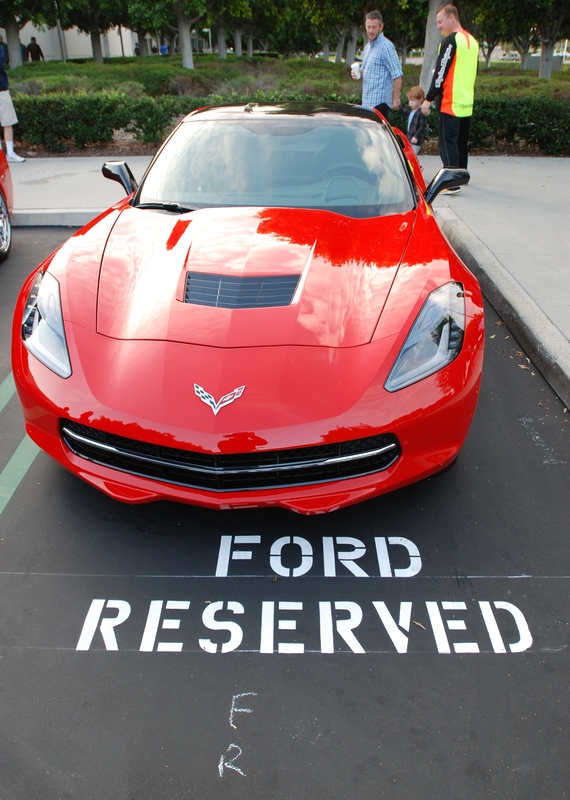 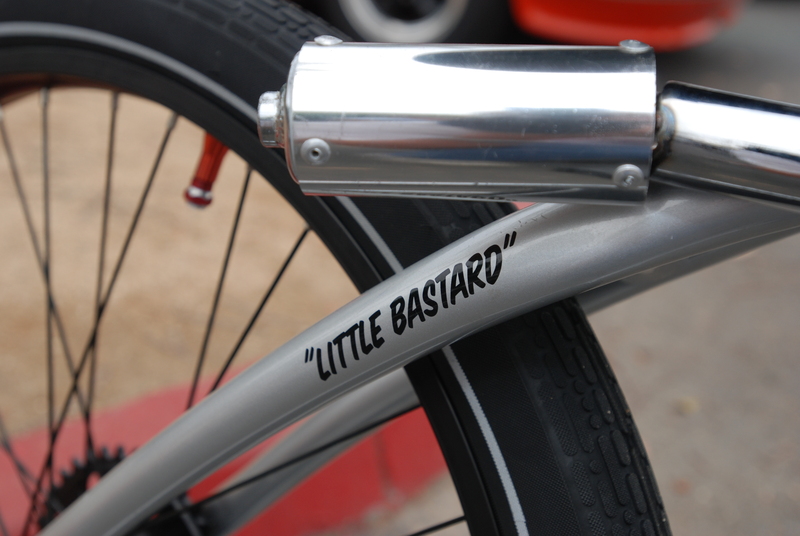 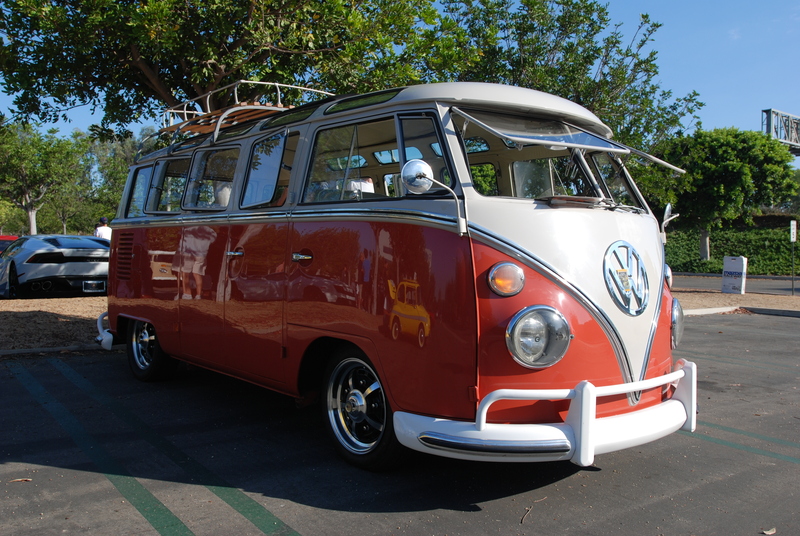 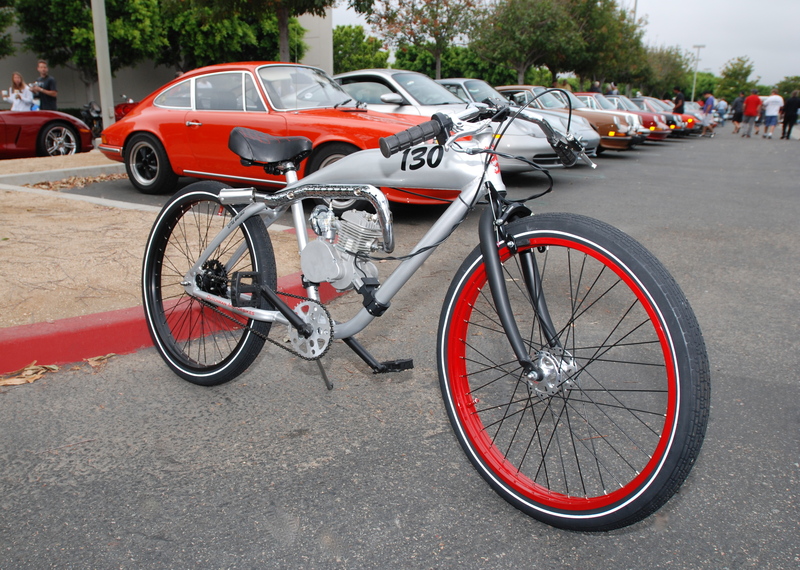 One of the late arrivals to the featured lot seen below. 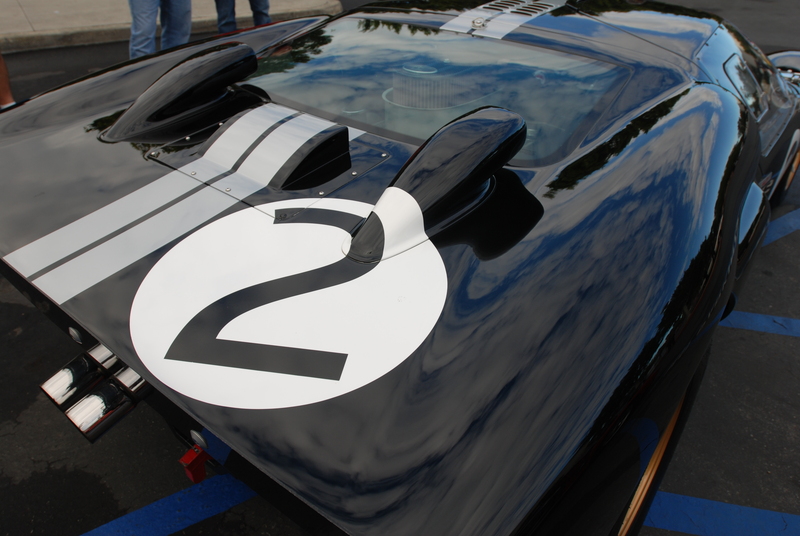 A black Ford GT 40 Mk II recreation, shining like a mirror, enhanced by the spectacular, form defining reflections. 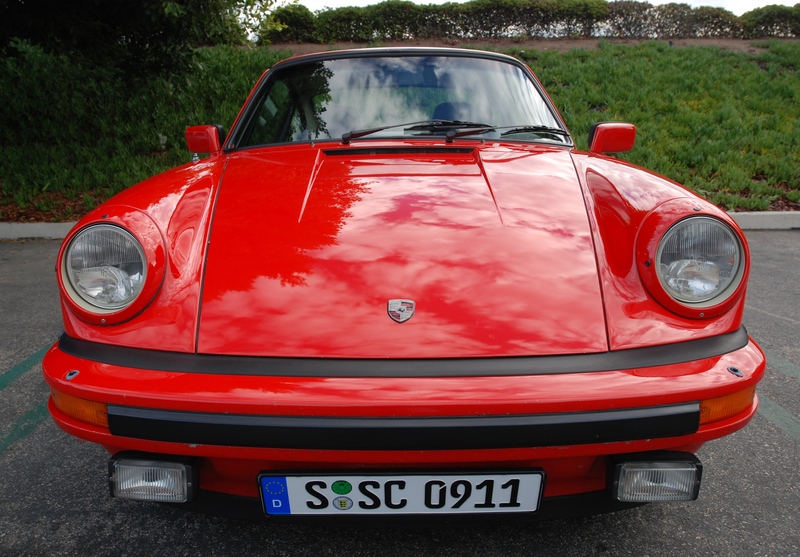 And last but not least, a beautifully maintained, India Red Porsche 911 SC, complete with its German license plate below. 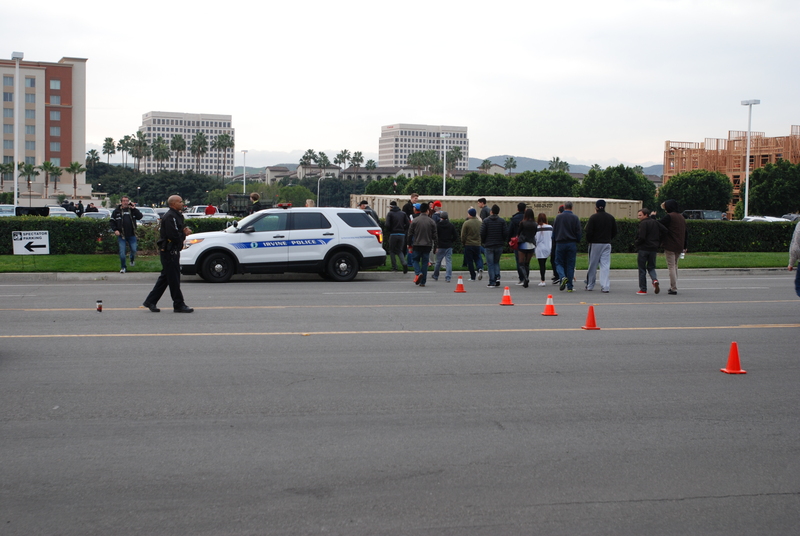 Come to think of it, I did see a large, jolly looking man in a red coat and white beard casually walking through the crowd that morning. 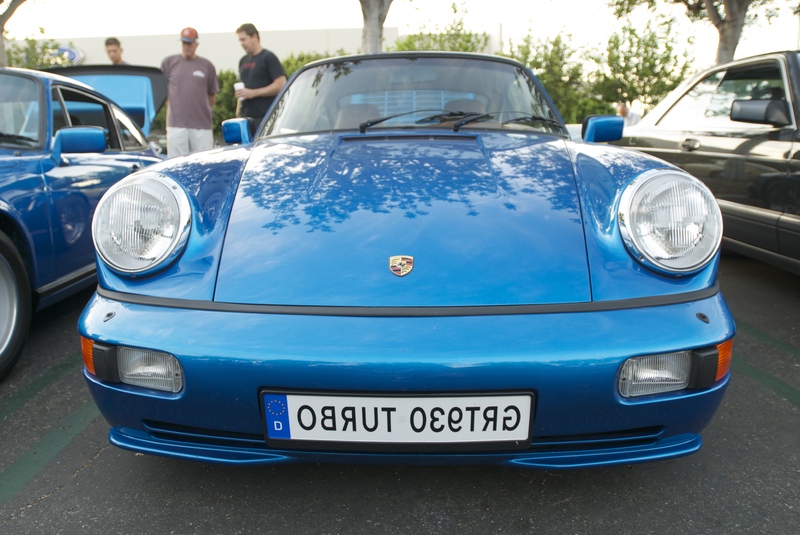 Could this license plate be a clue to his identity? 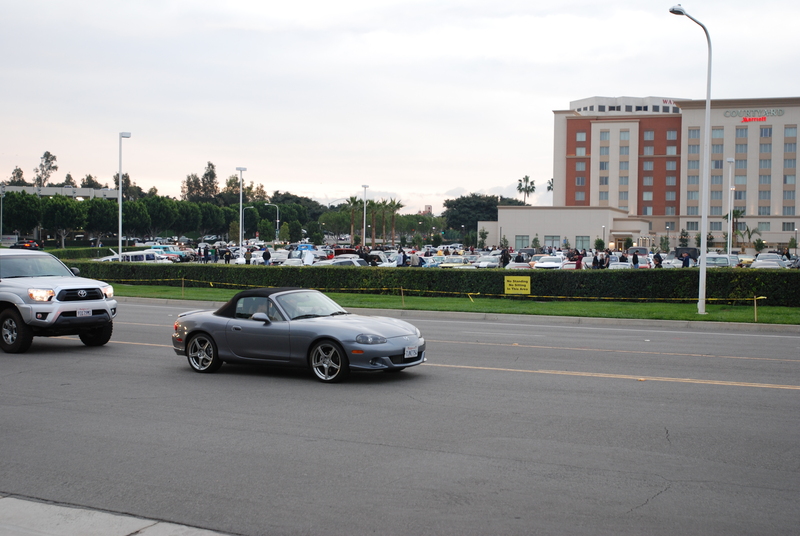 Lately, I’ve found myself taking a slightly different approach in photographing the multitude of vehicles present at each weeks Cars&Coffee / Irvine event. 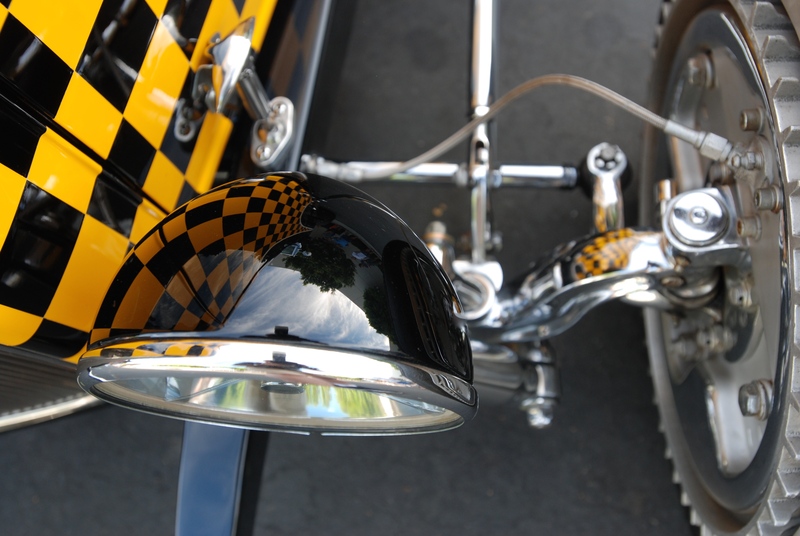 With the clear, sunny springtime weather, there has been an abundance of interesting lighting conditions to work with, as well as some amazing, highly polished, curvaceous and reflective vehicle surfaces to study. 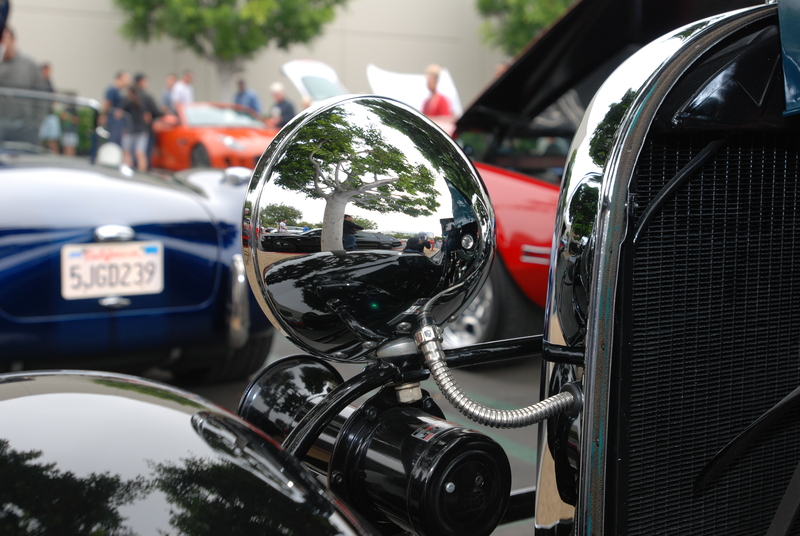 I’m frequently stopped by vehicle owners or passerbys and asked “what are you looking at” or “what are you shooting”? 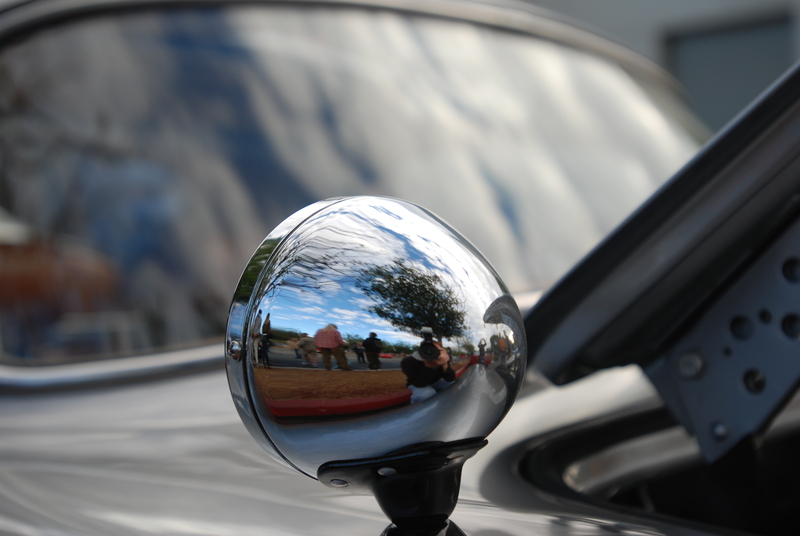 When I show them my captured imagery, the common response is “how did you see that” or” I’ve never would have noticed that”. 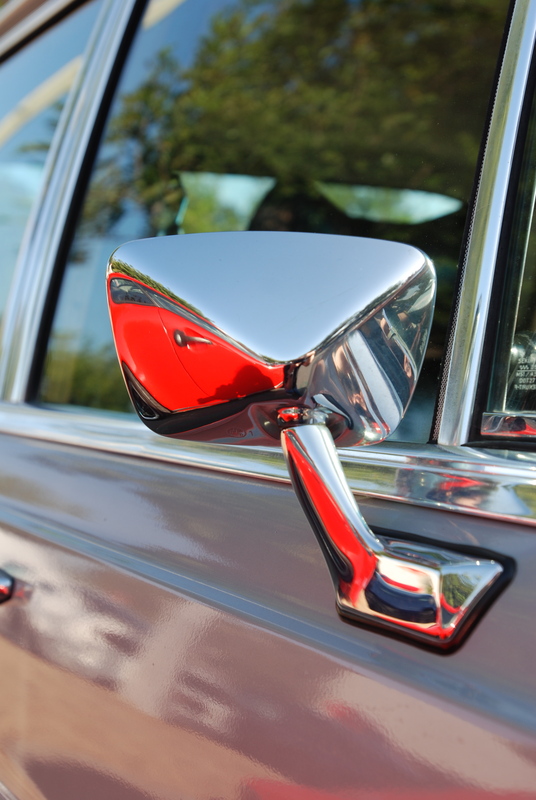 My response is that it’s just a function of how we look at objects in general, and that when you slow down and take your time to really study an object, the end result can often be very surprising and rewarding. 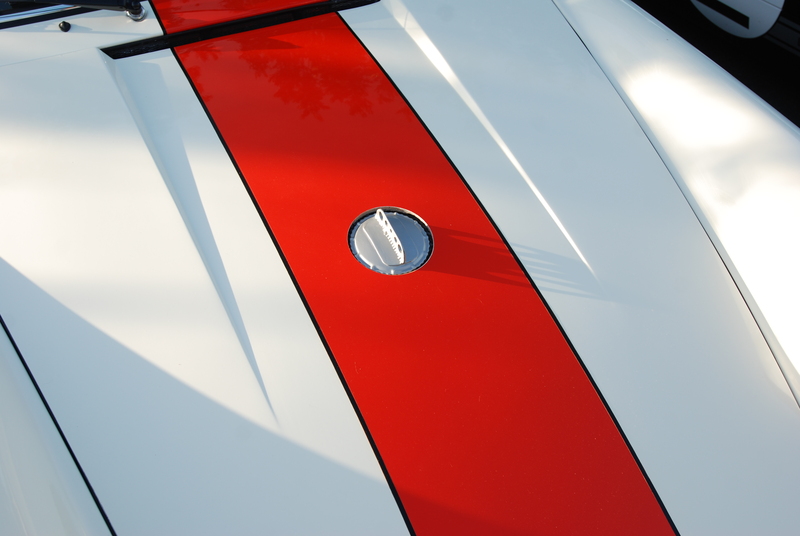 And now with summer rapidly approaching, there have been a number of winter automotive projects finally seeing the light of day, making their debut under warm, sunny skies. 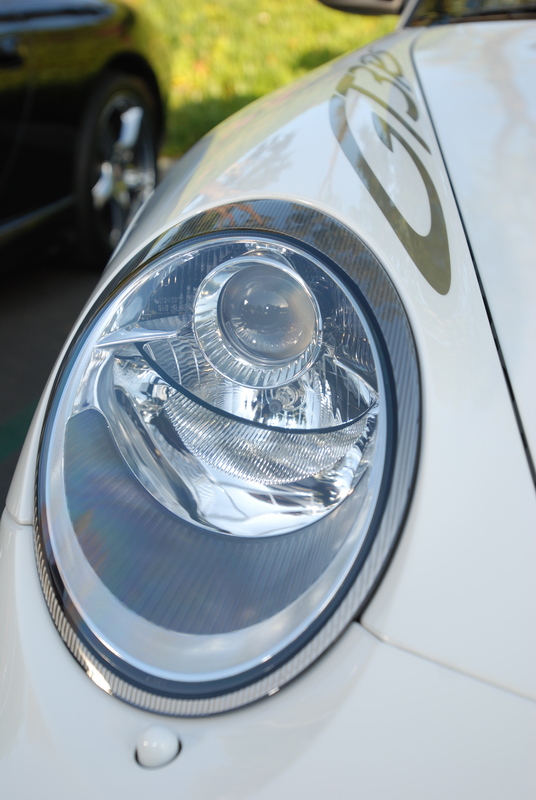 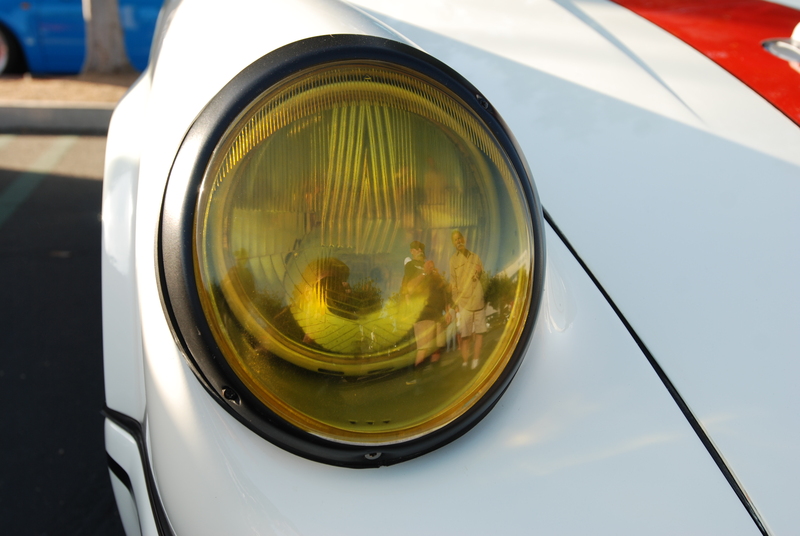 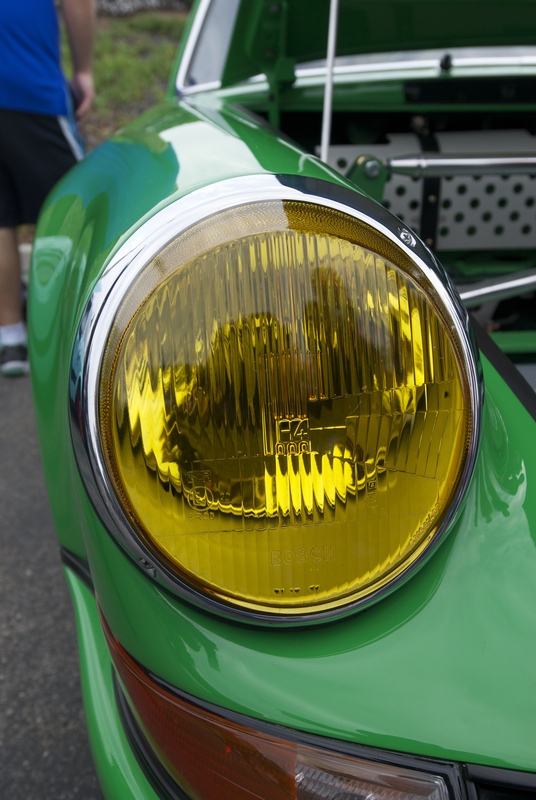 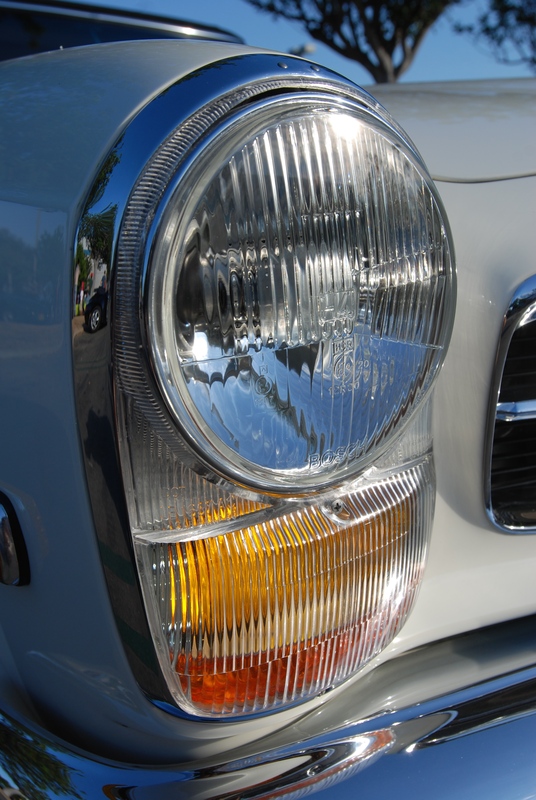 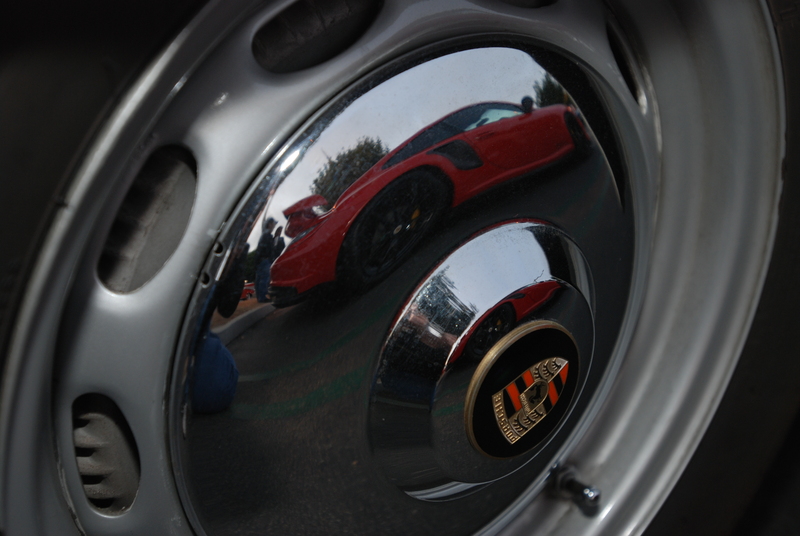 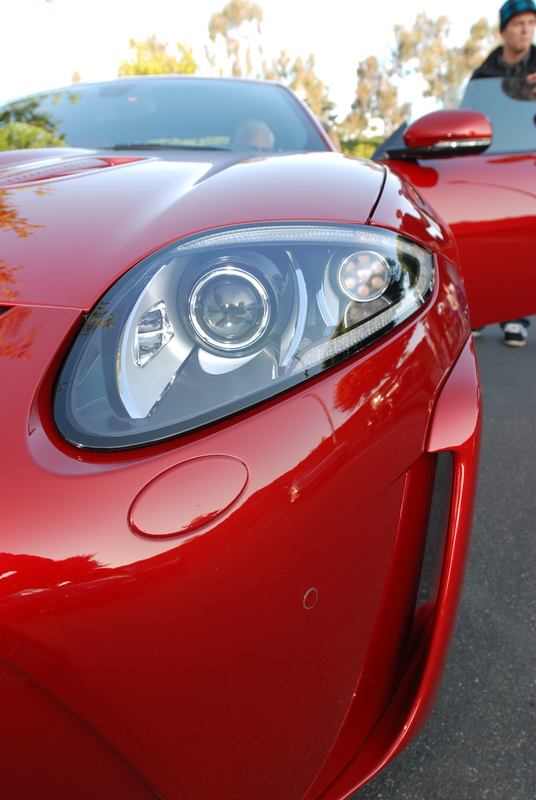 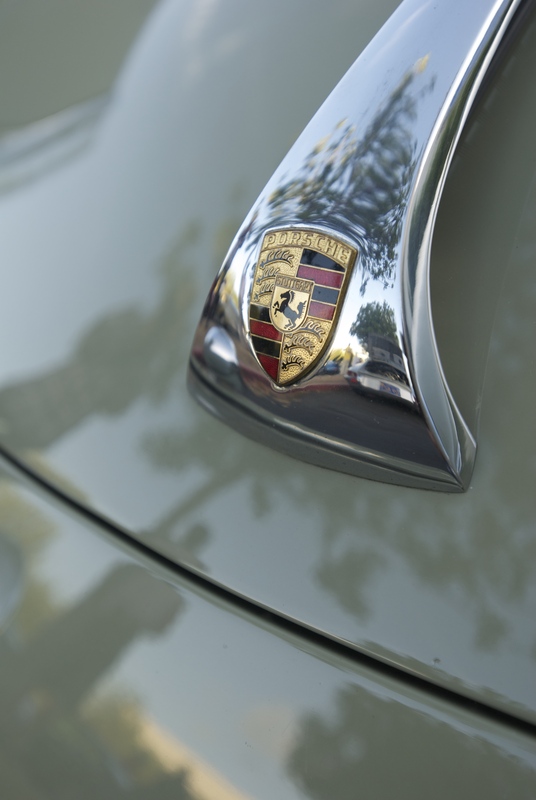 Even shooting a close – up of the amber-colored euro lens covering the Cibie biode headlight internals, revealed an unexpected surprise; the captured reflection of the owner and a fellow Porsche 911 owner discussing the merits of these new headlights. 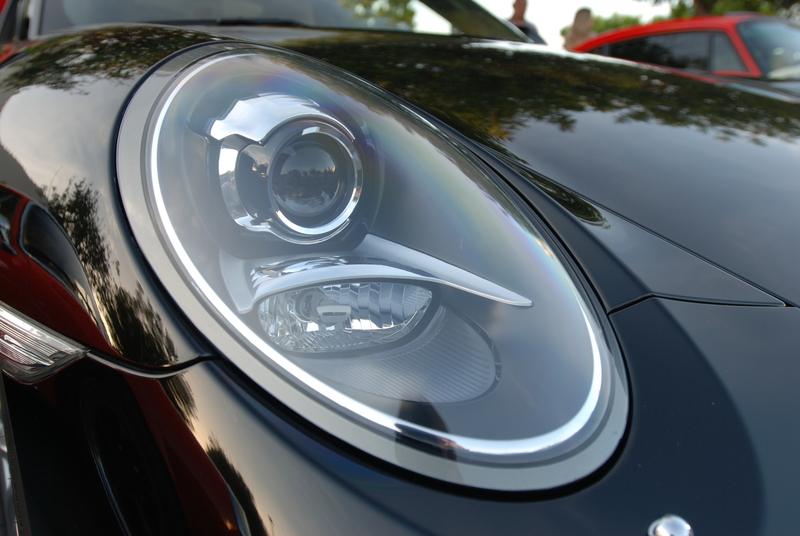 One of my mornings reflective studies, using a black 2013 Porsche type 991, 911 Carrera S coupe as the subject, showcasing the latest in headlight technology and the by-product of a flawless paint finish. 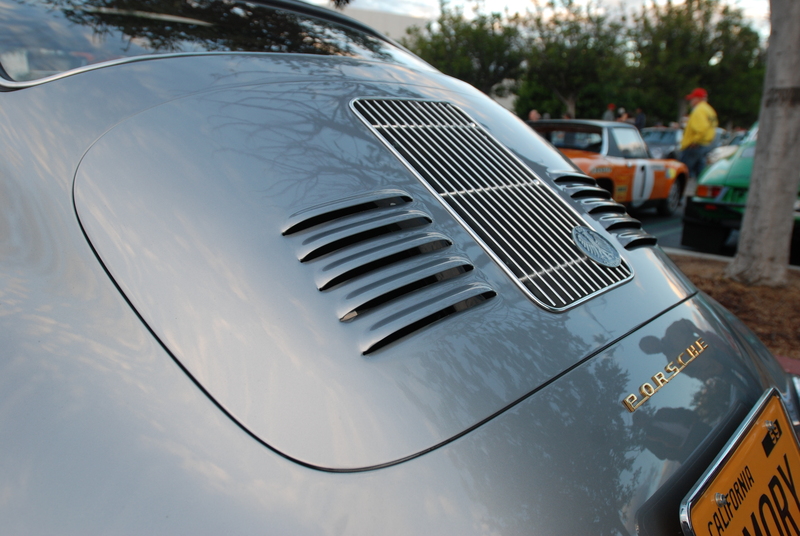 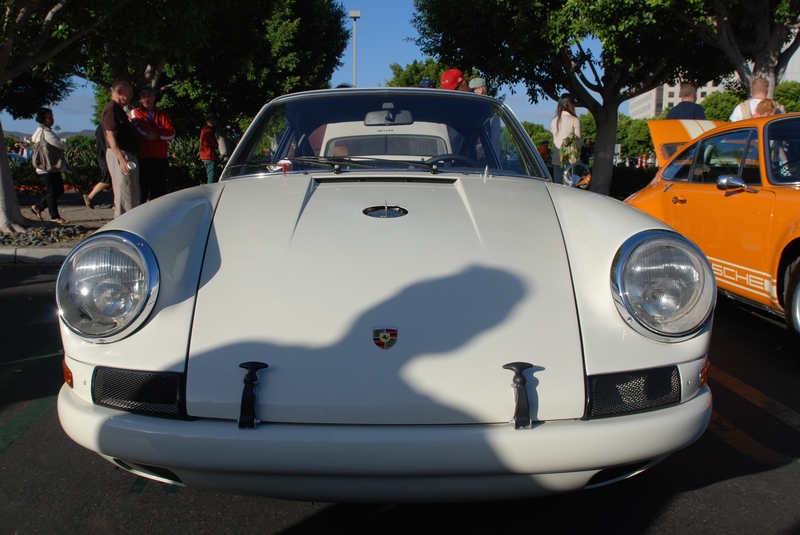 Another graphic display of how shadow, light and foliage effects, when combined can visually enhance the profile and contours as those found on an early 70’s Porsche 911 front hood and fenders (as seen below). 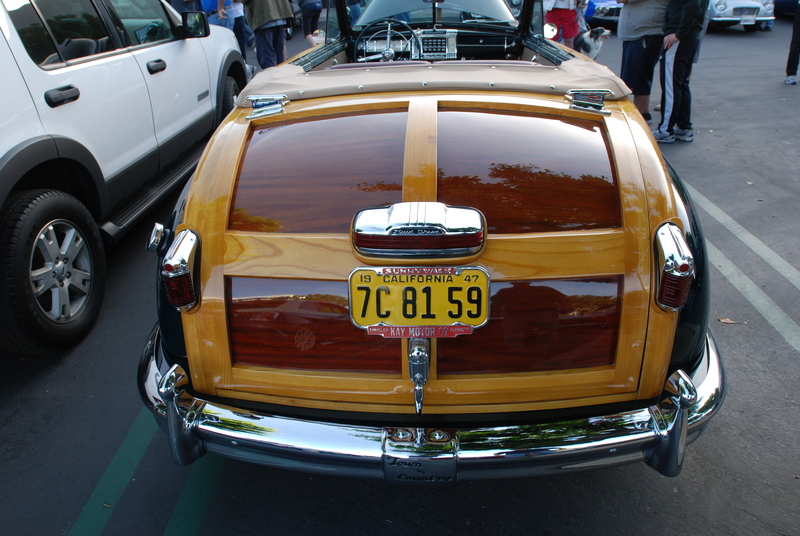 A beautifully restored, vintage Chrysler Town & Country convertible, complete with wood cladding on its sides and trunk area as shown. 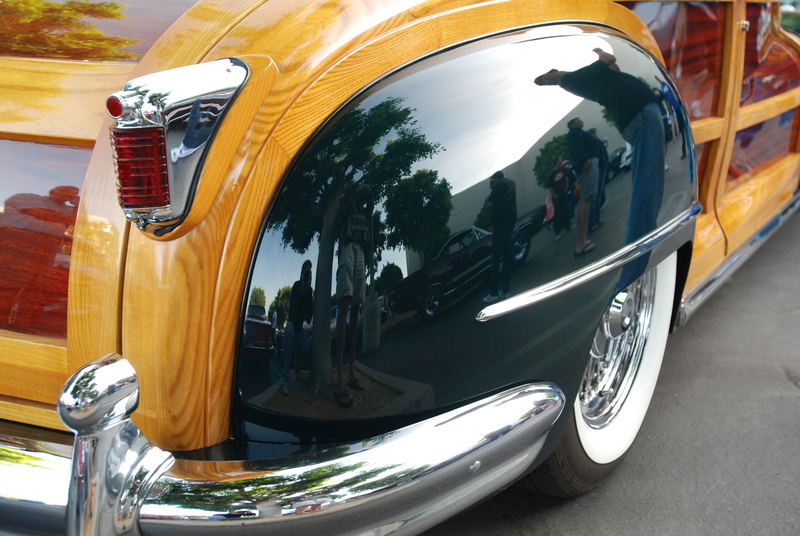 Even the woodwork was finished and polished to a high level matching that of the paint job. 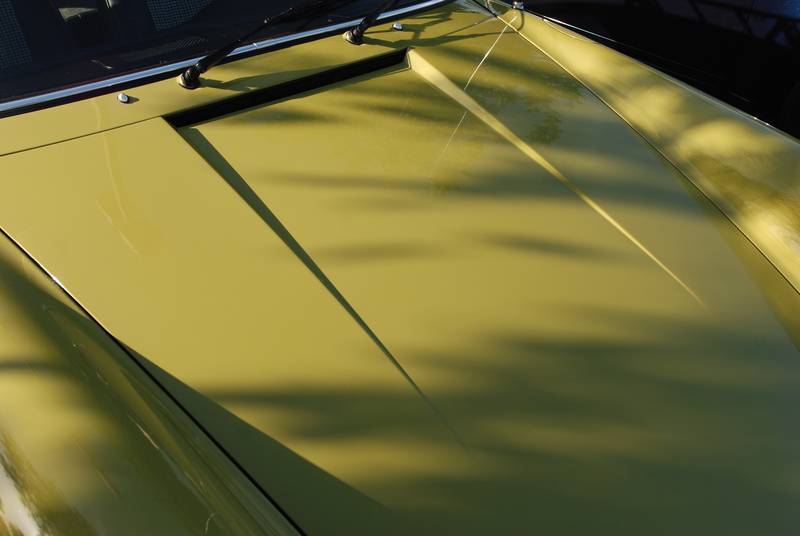 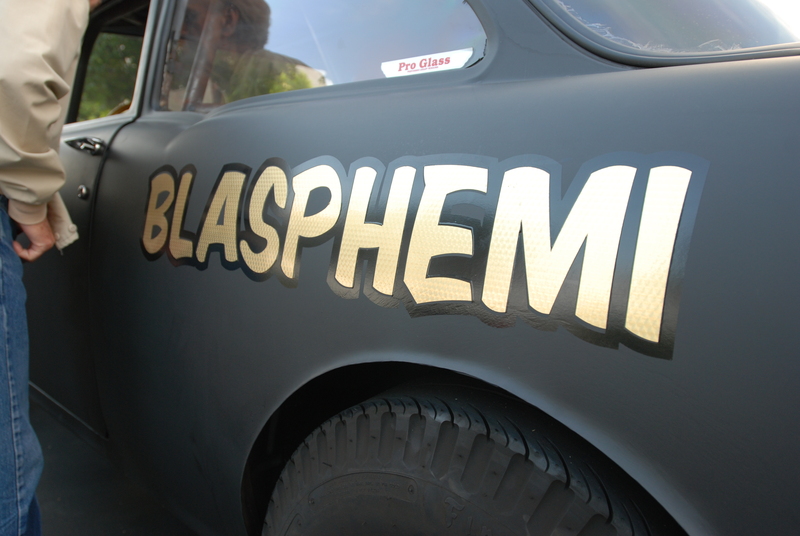 And looking closer, these reflective properties were carried over to the vehicles rear fender, which offered up a clue to its surroundings. 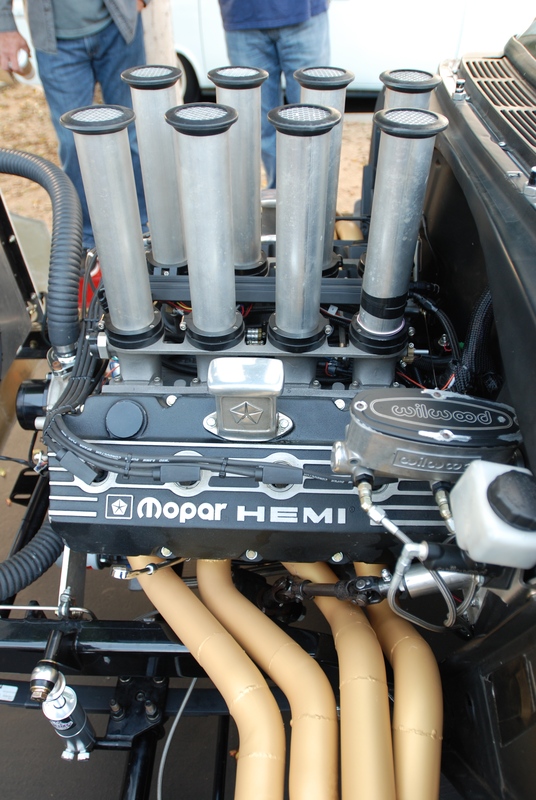 Up front was another surprise, hiding beneath the opened hood; an immaculate Dodge Viper V-10 motor, transplanted into the engine bay and appearing as if it had been original to this model, as delivered by Chrysler. 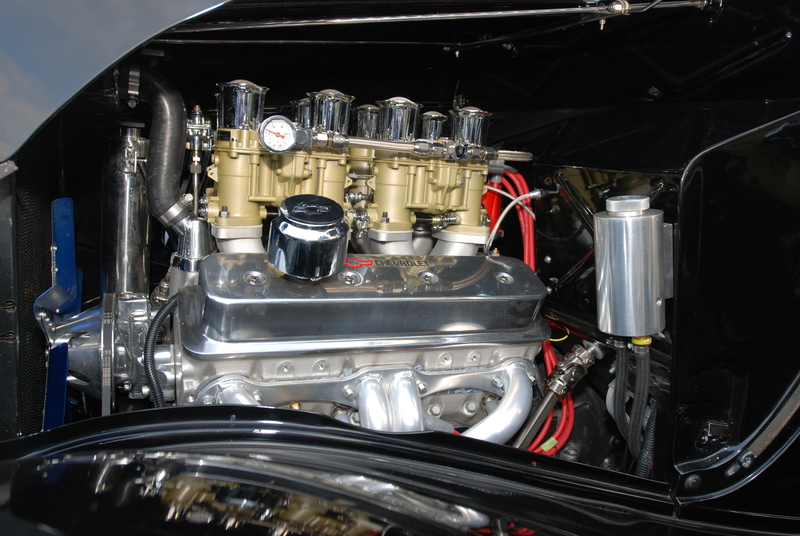 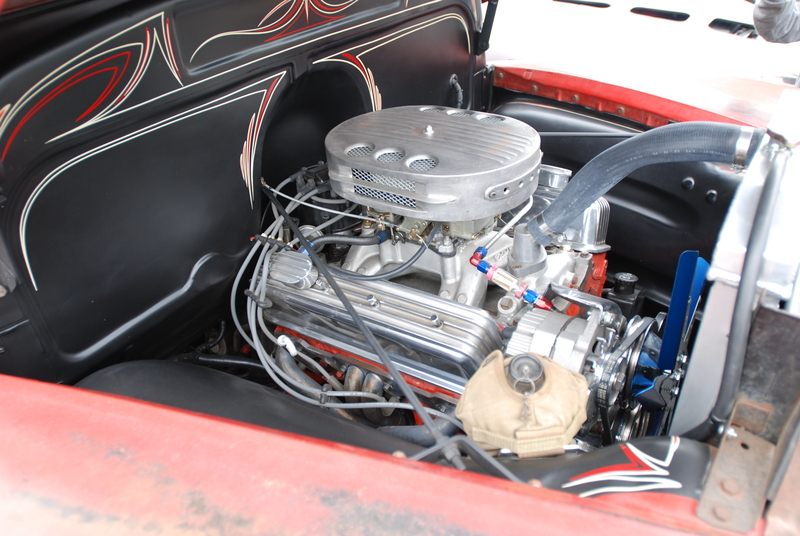 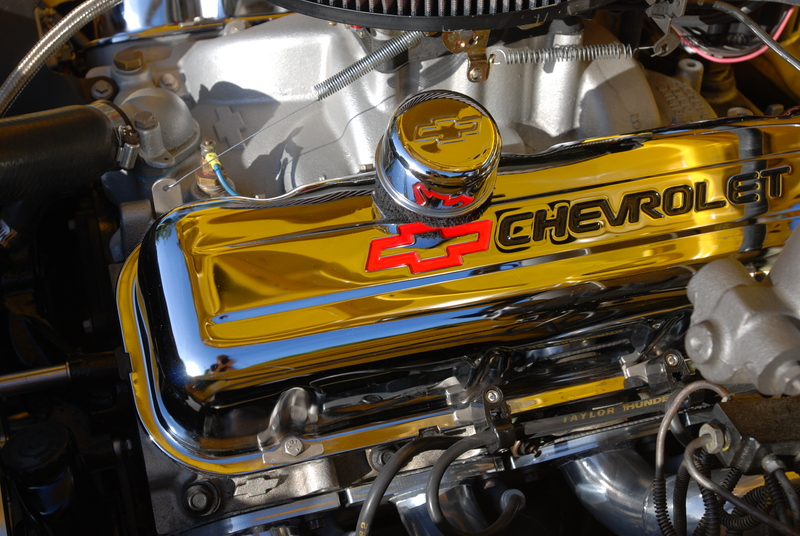 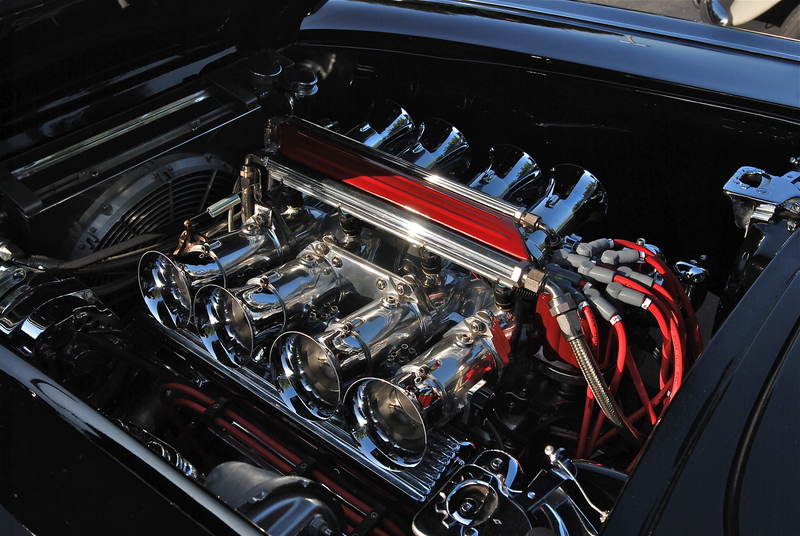 and a close – up shot, revealing some very cool reflections captured in the chrome valve cover and breather. 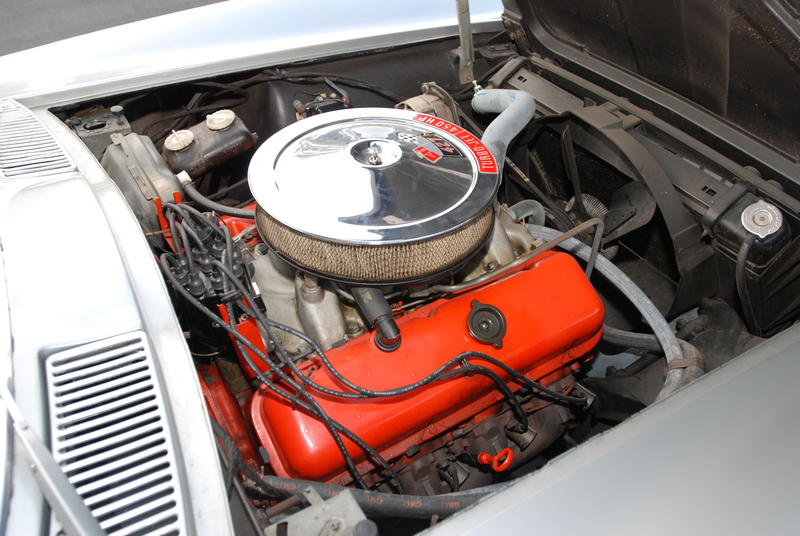 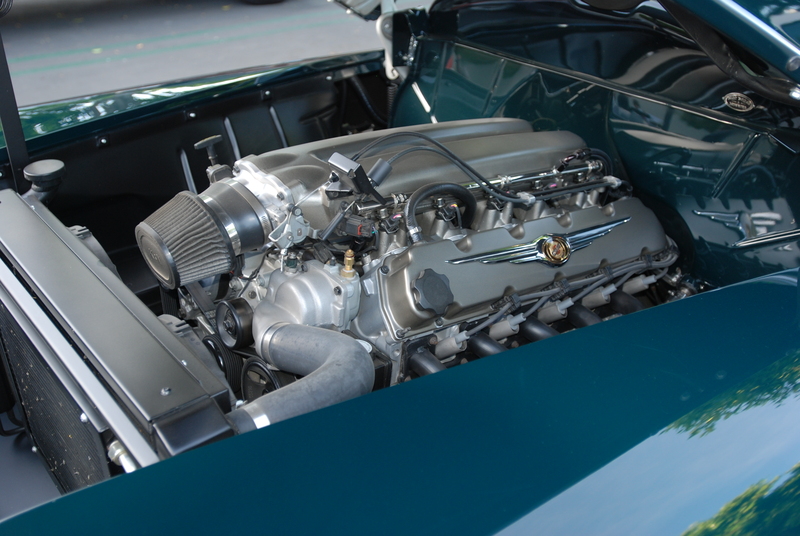 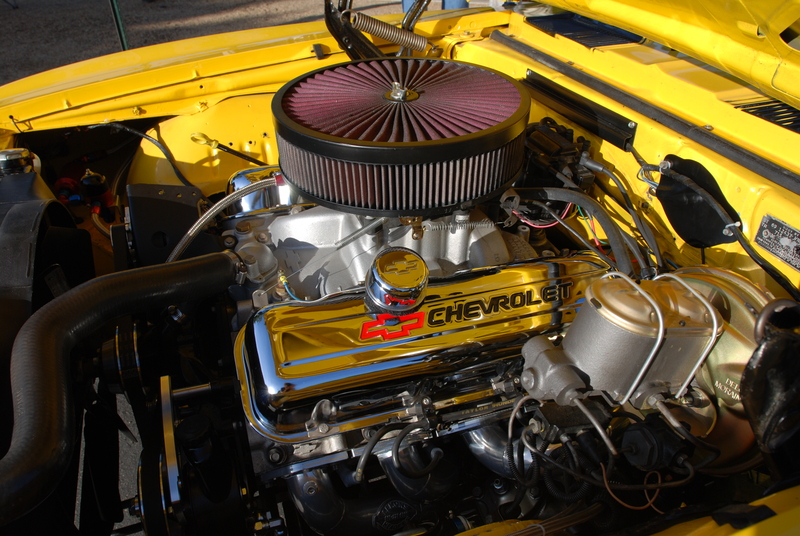 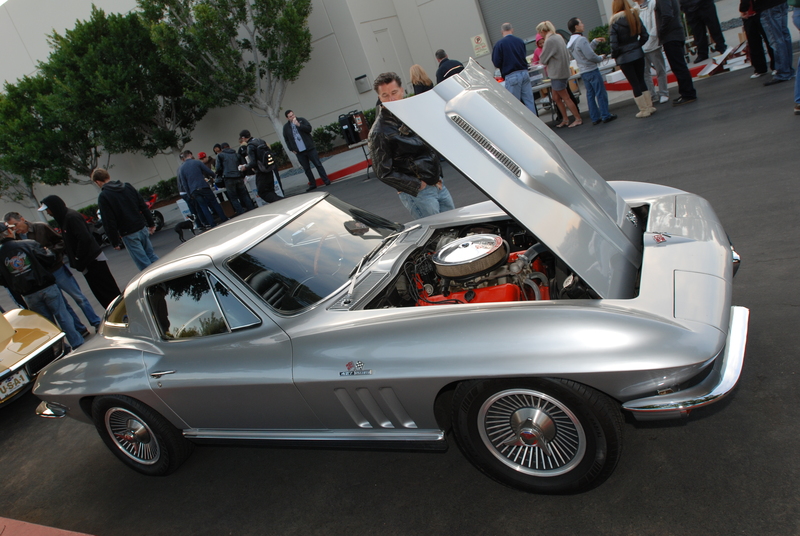 Nothing screams hot rod like highly polished chrome injectors and brightly colored accents, in this case the go fast accessories found within the engine compartment on this black 1962 Corvette (below). 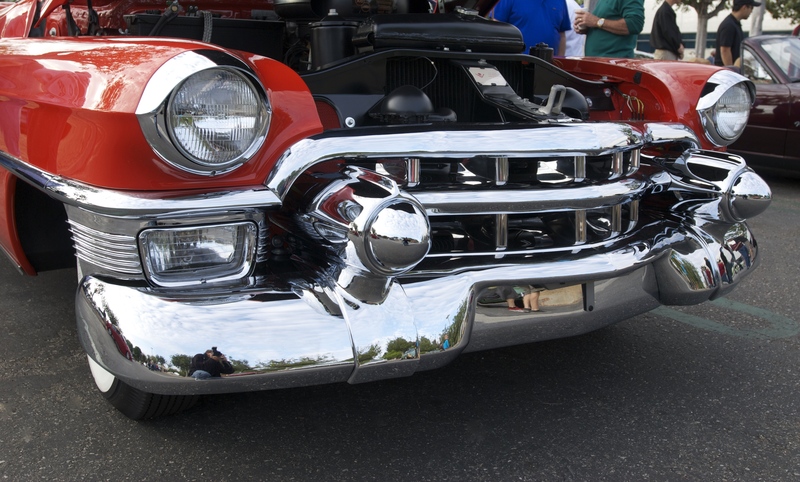 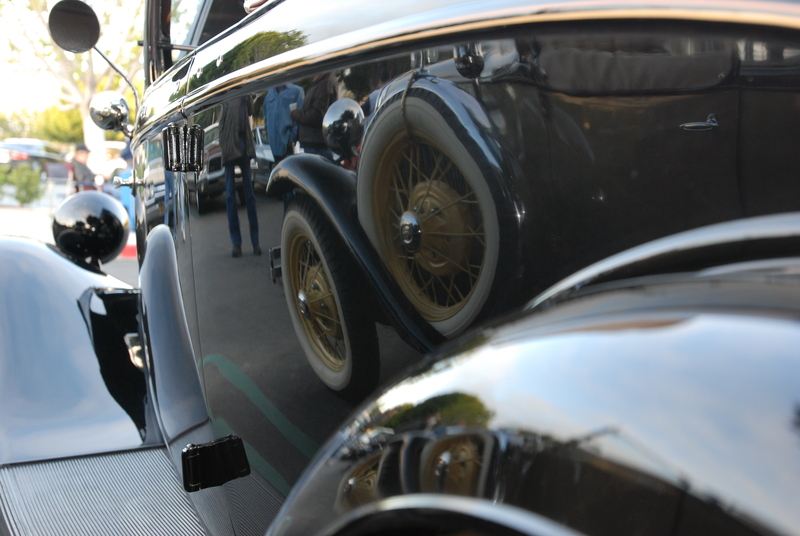 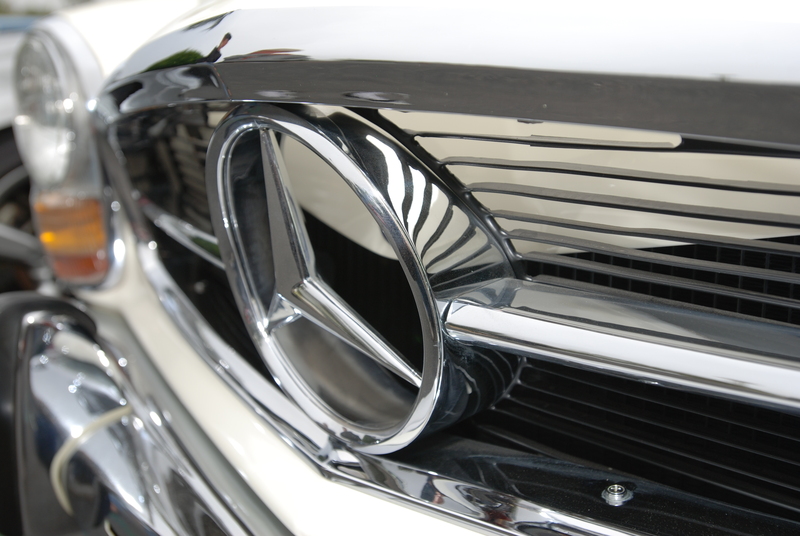 including some equally impressive grill and trim reflections. 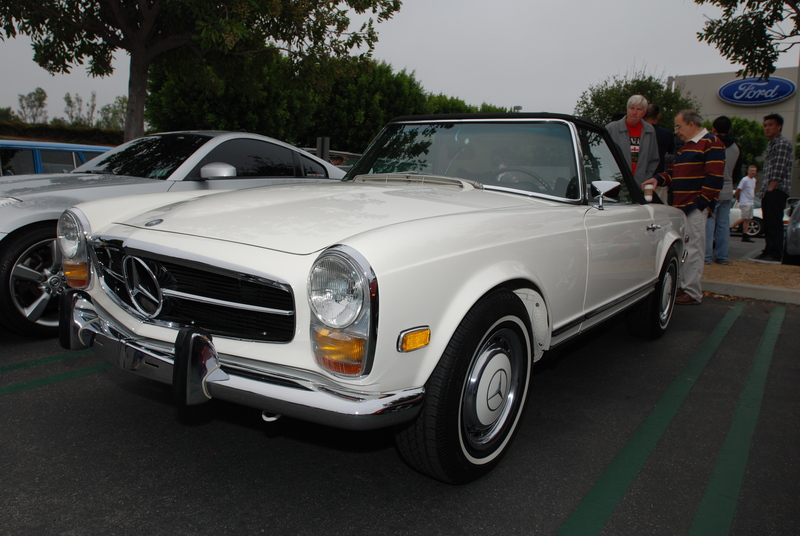 And a full shot of the beautifully restored 280SL, the source of hidden detail. 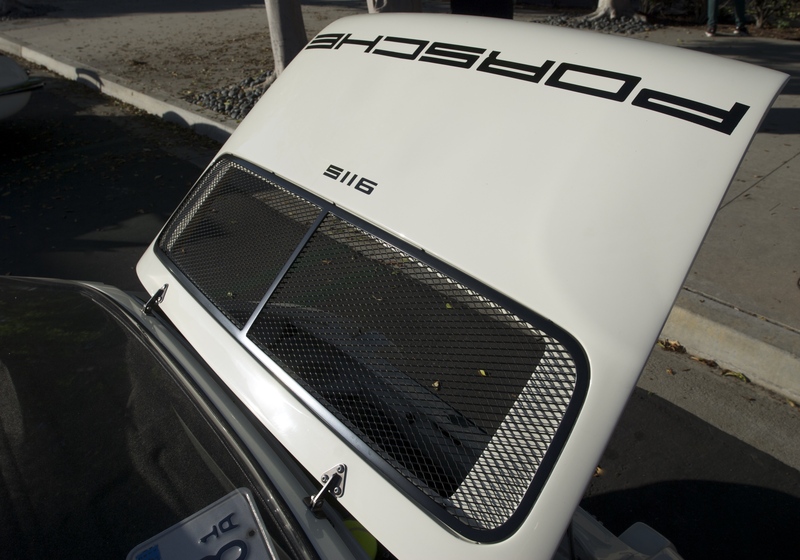 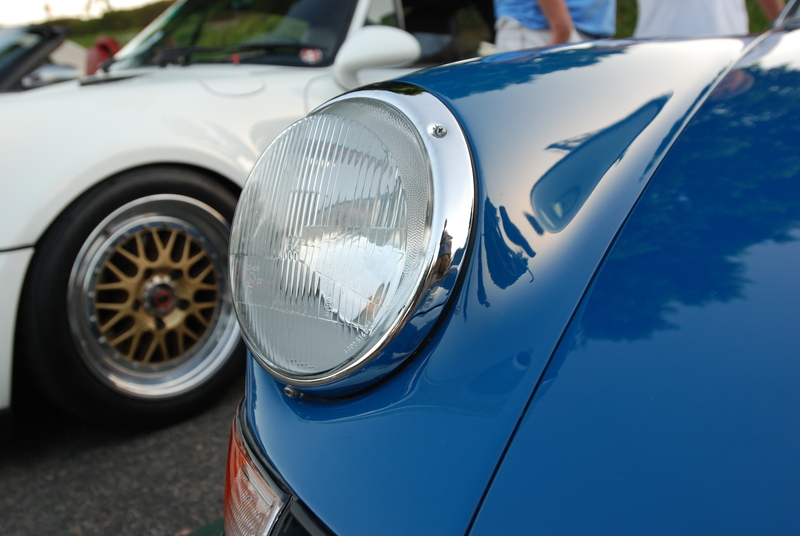 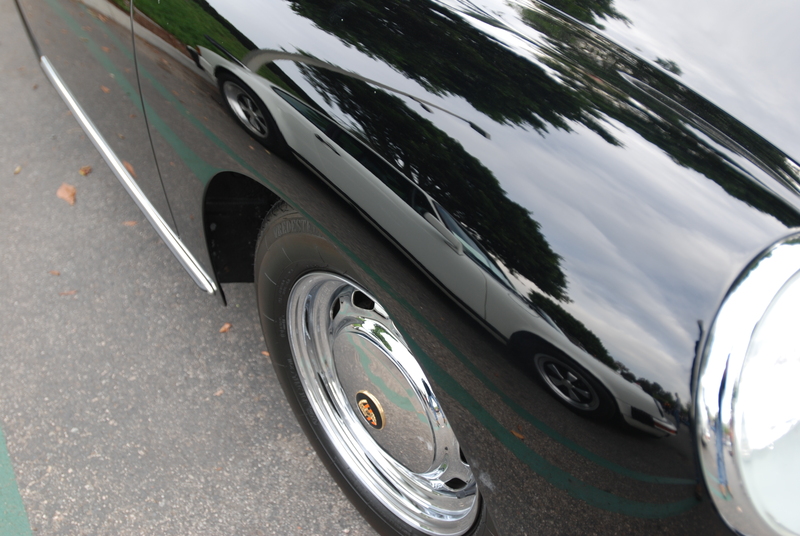 and an upside reflection, as seen in the hood of a 1987 black Porsche 930 turbo. 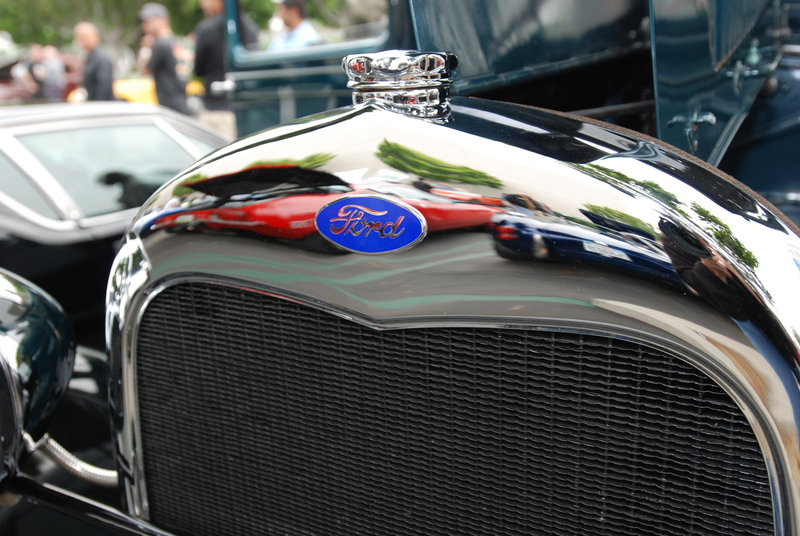 and its classic, chrome plated Ford radiator /grill surround. 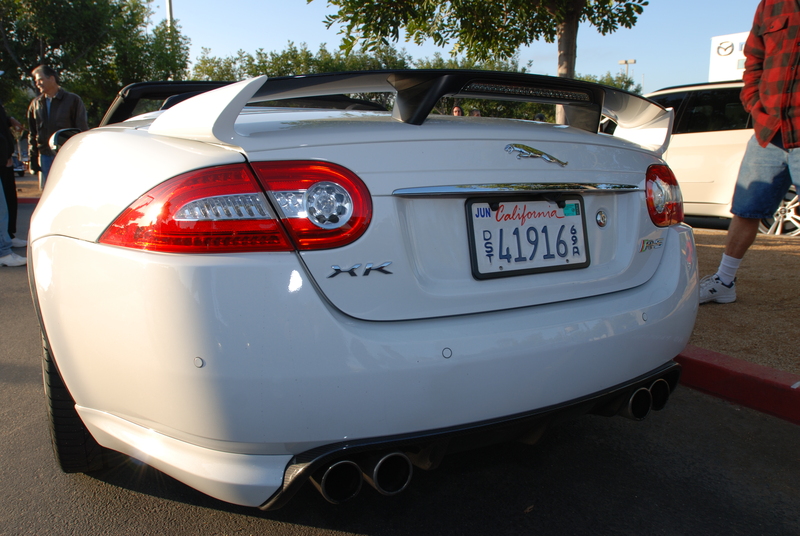 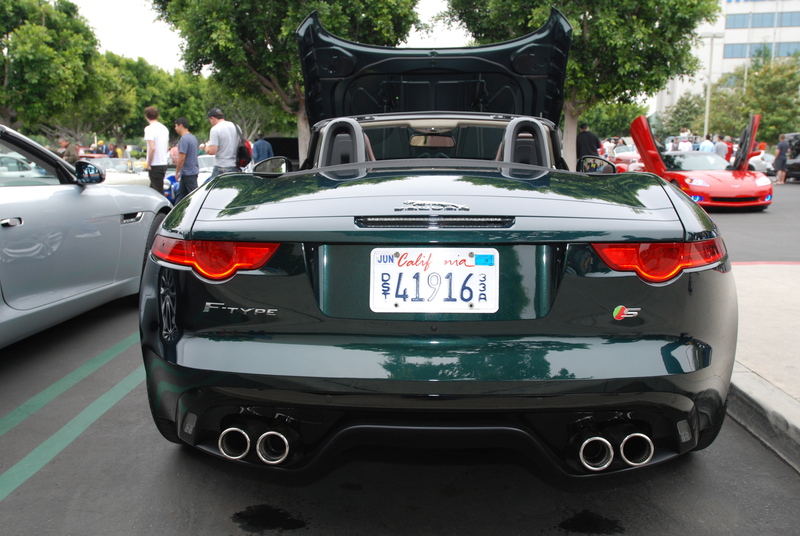 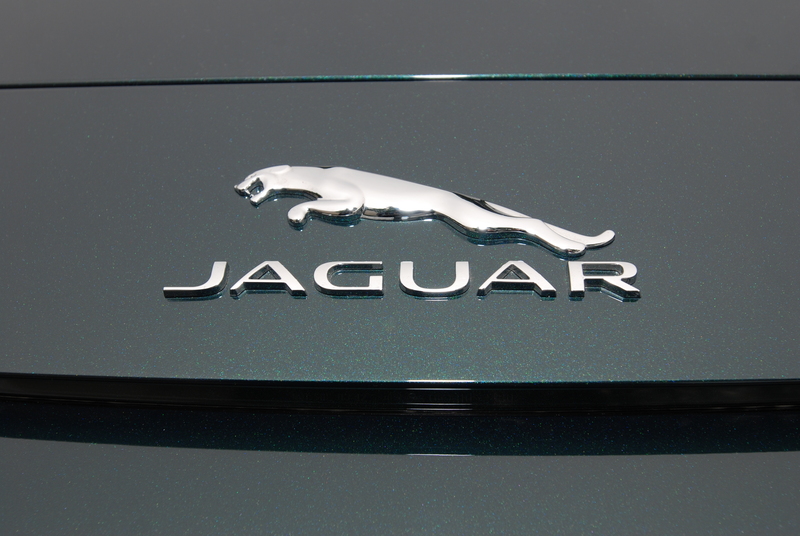 as displayed on the back of this brand new, dark green metallic 2014 Jaguar F-type V8 S Roadster. 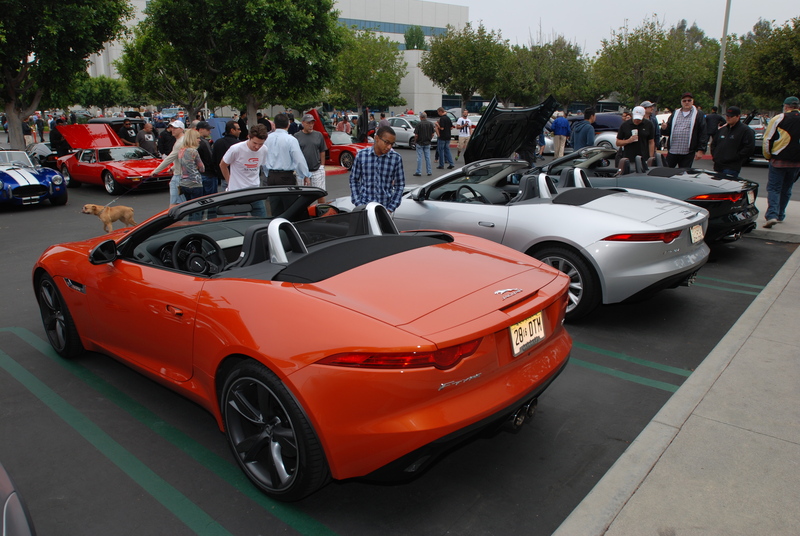 A trio of the brand new 2014 F-Type models on display, courtesy of Jaguar. 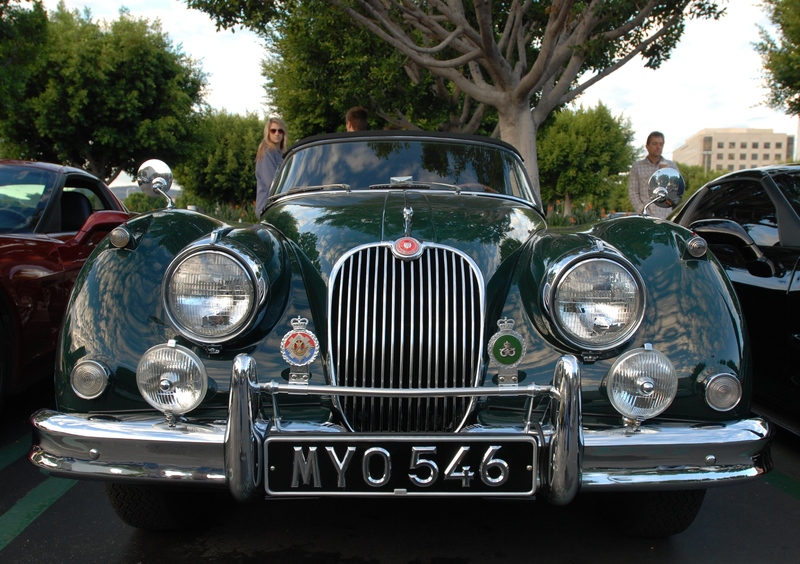 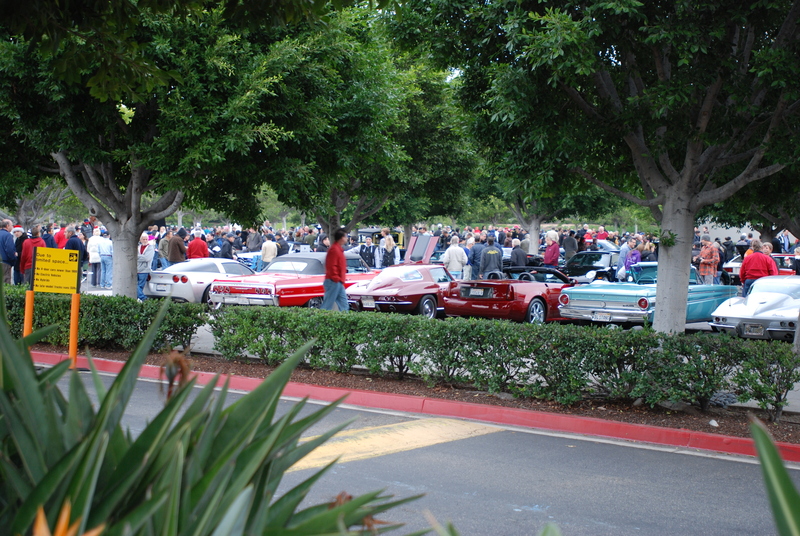 Shiny, happy cars, and hordes of happy people. 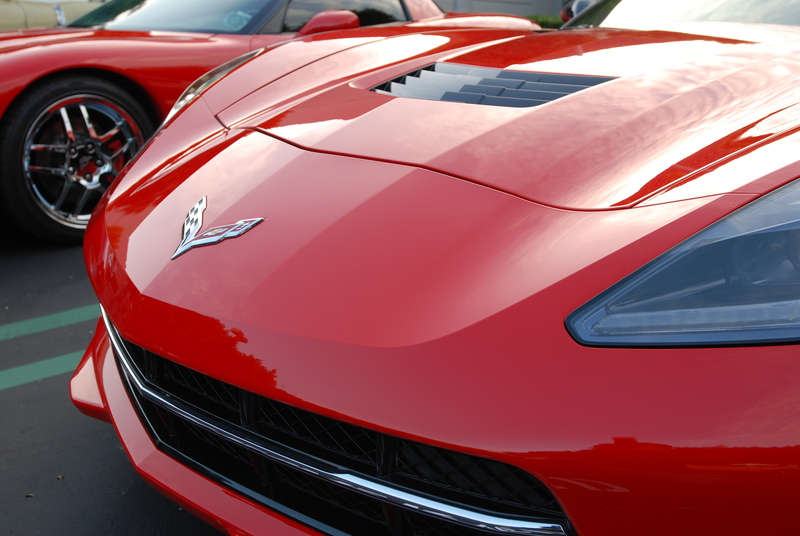 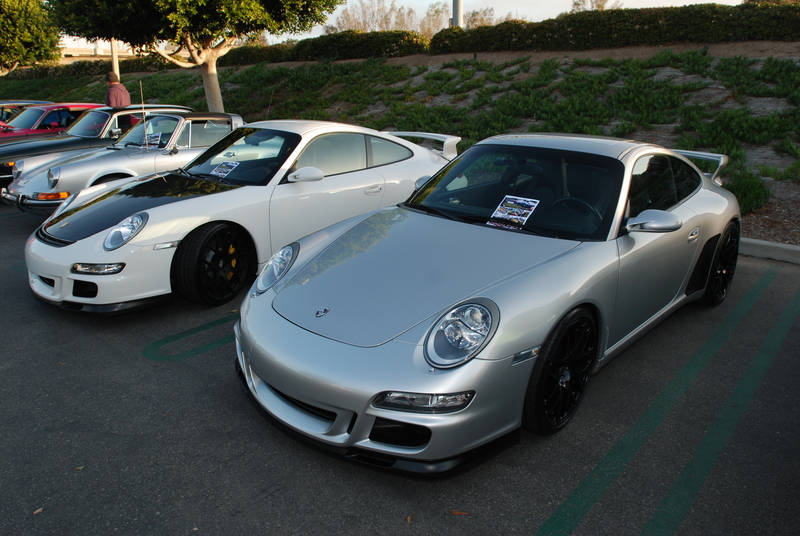 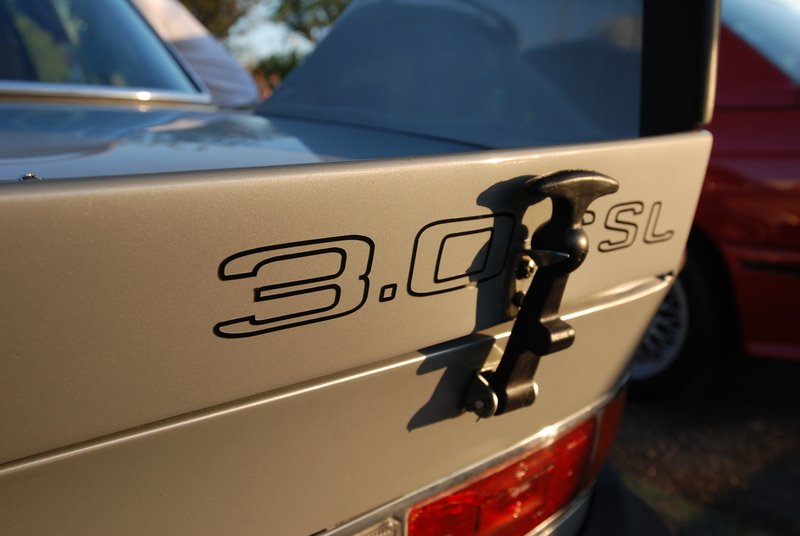 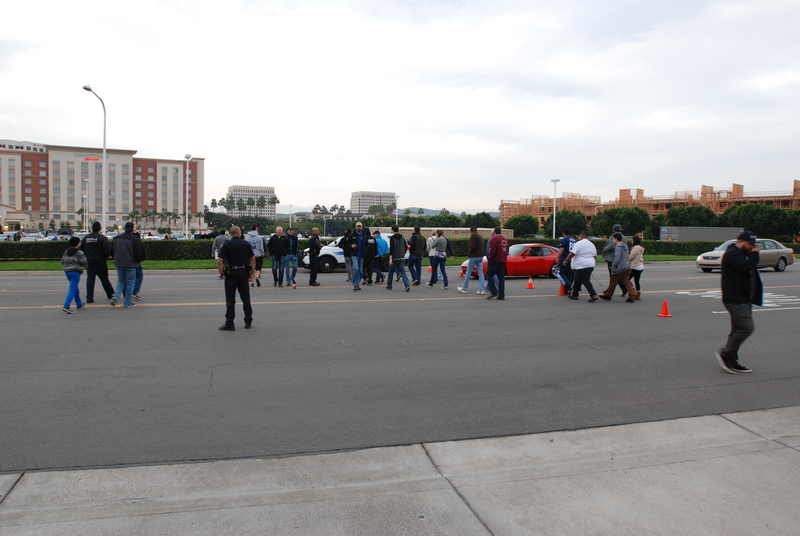 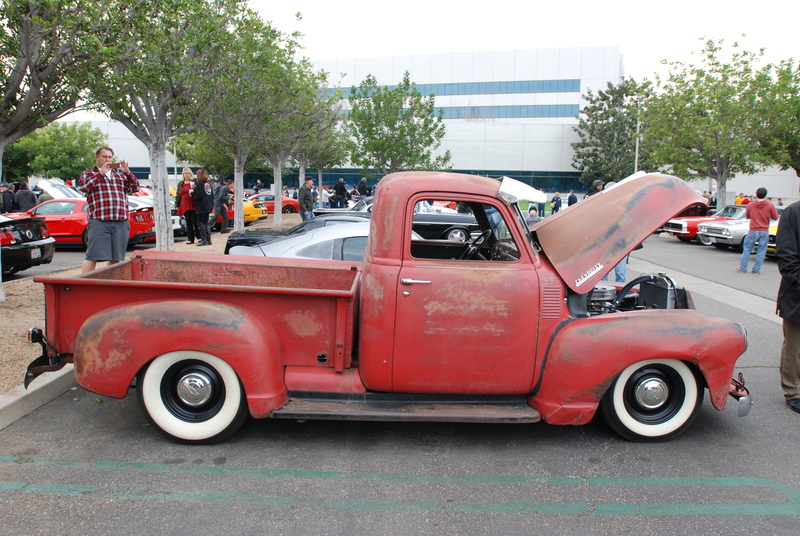 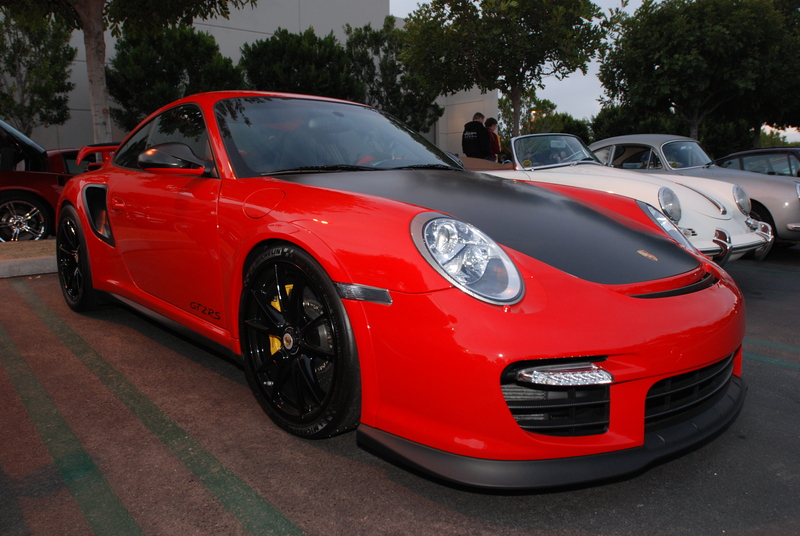 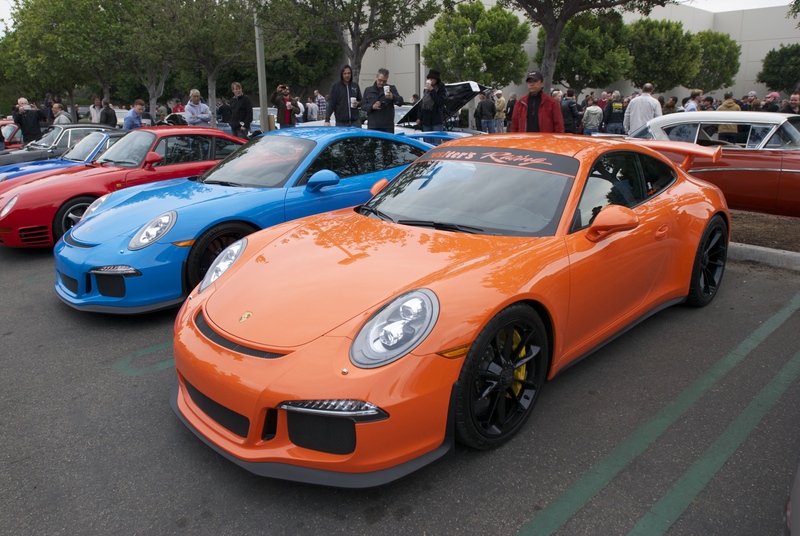 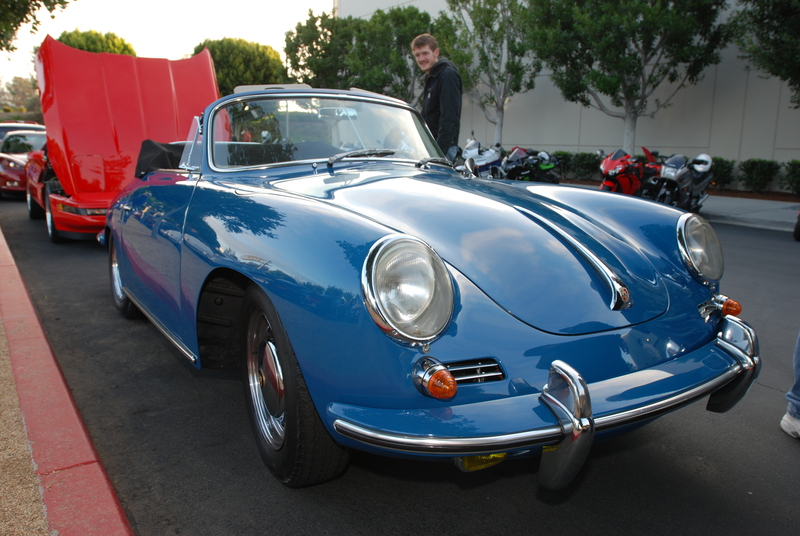 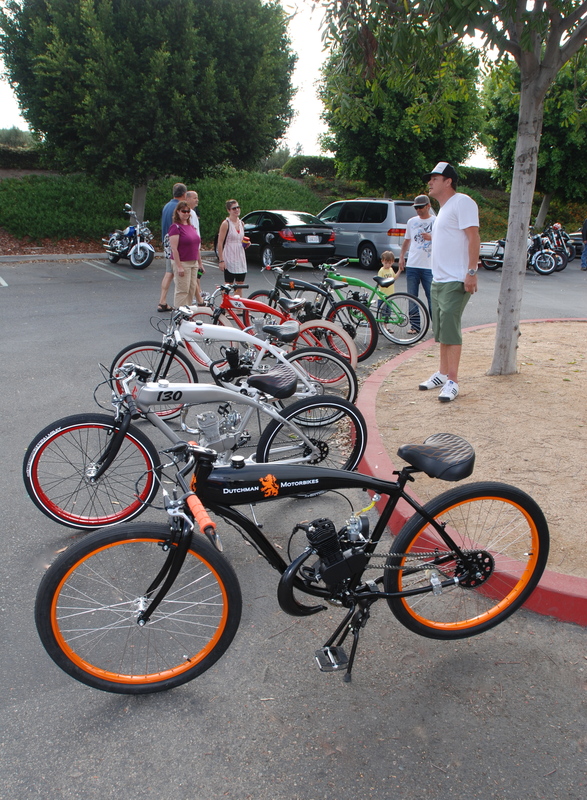 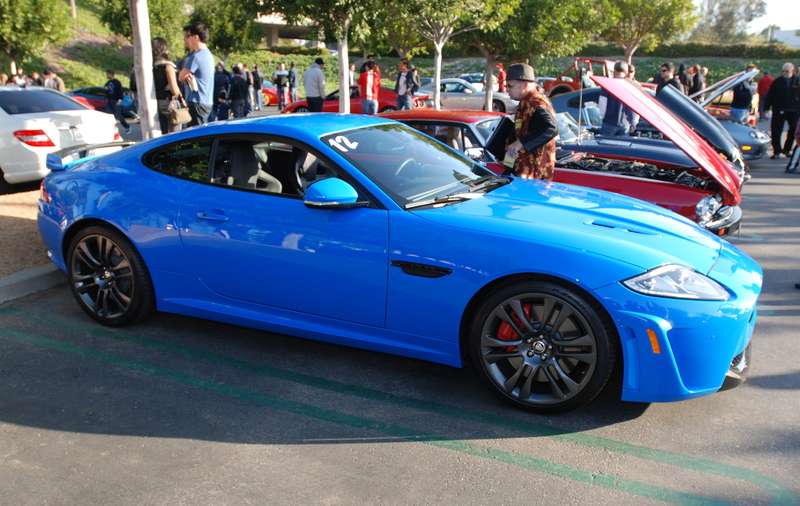 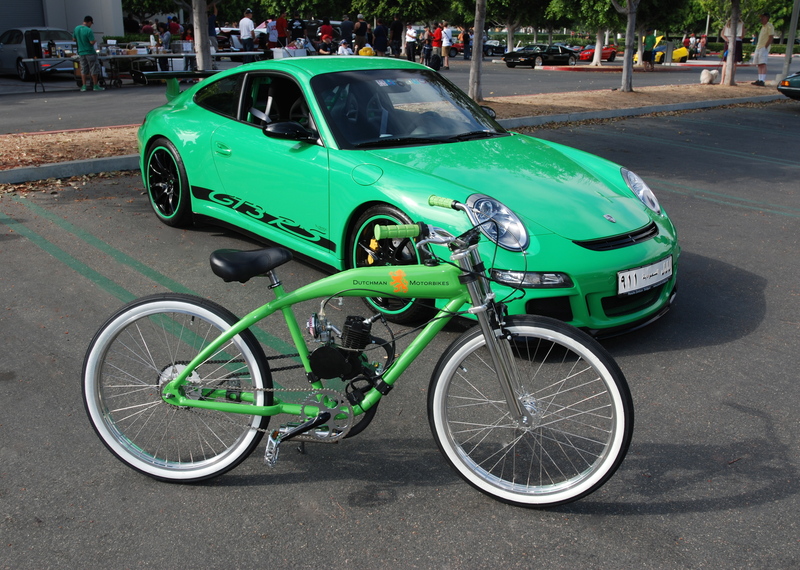 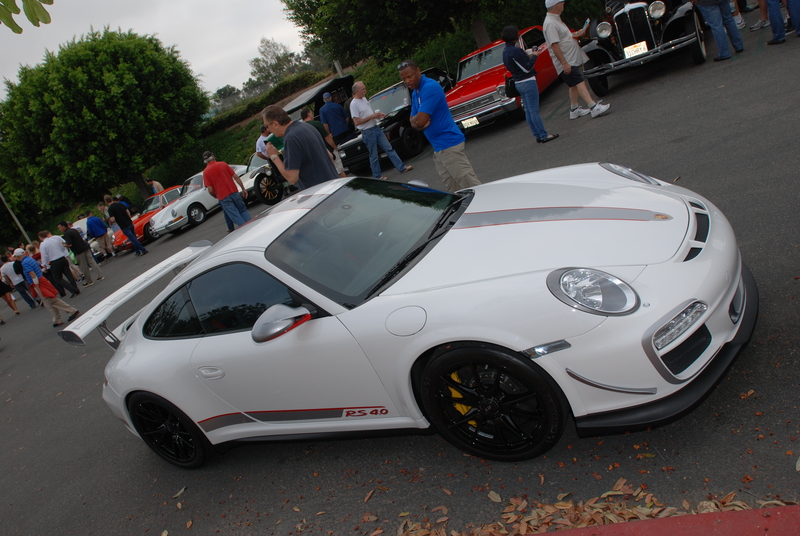 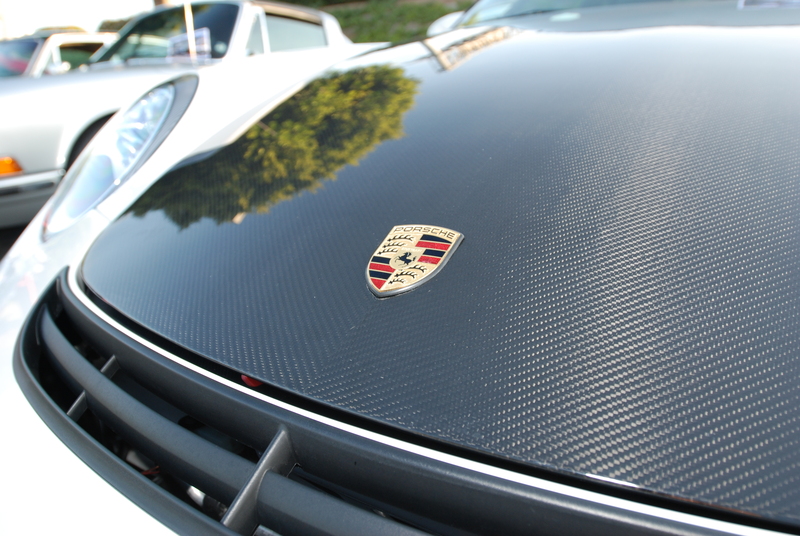 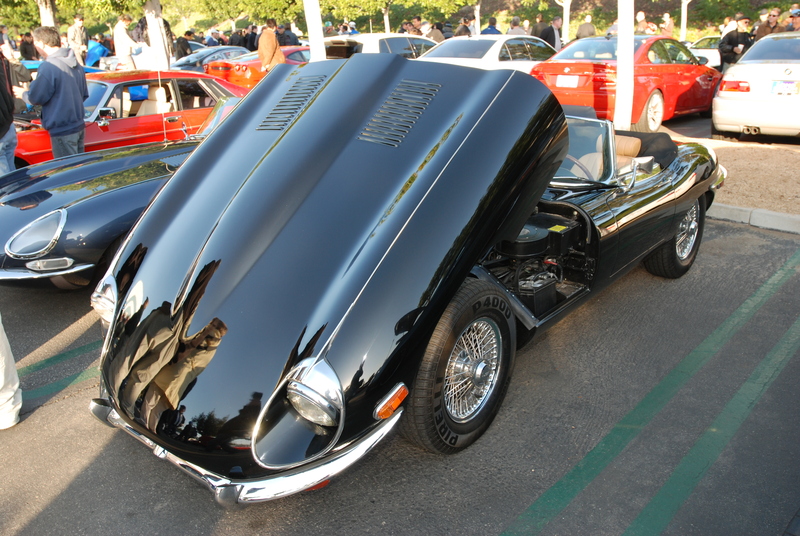 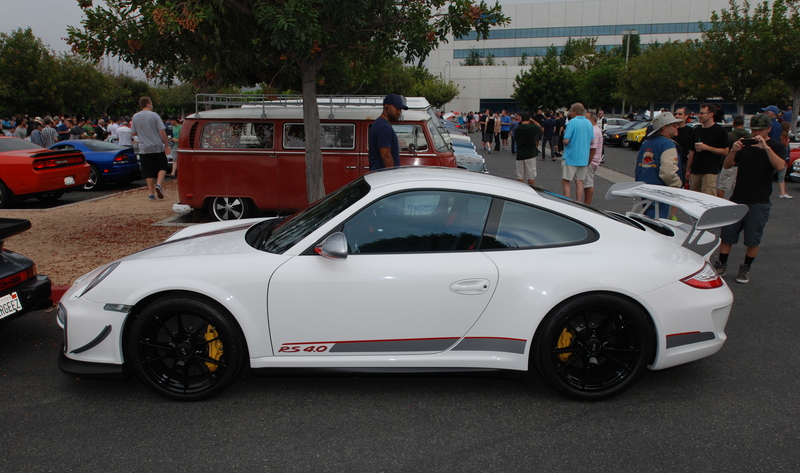 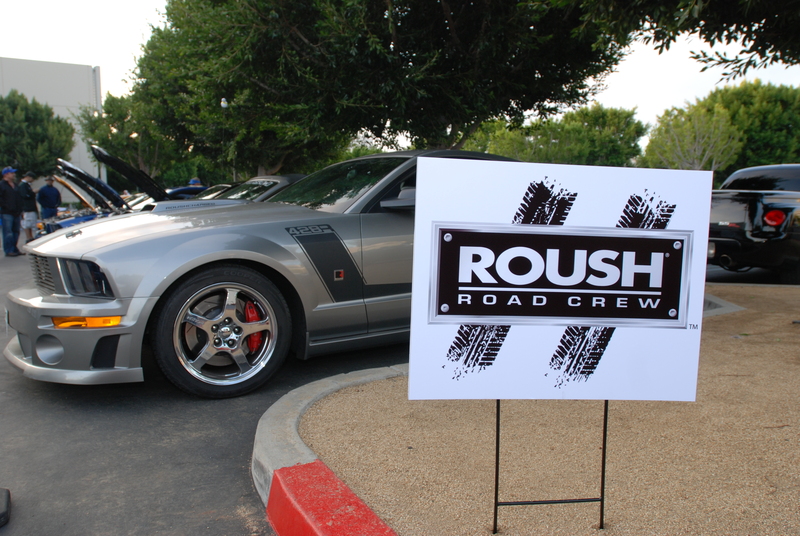 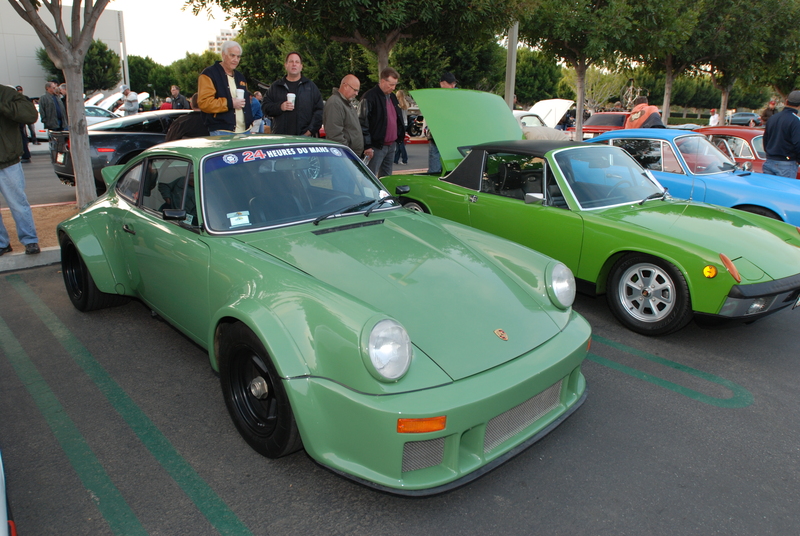 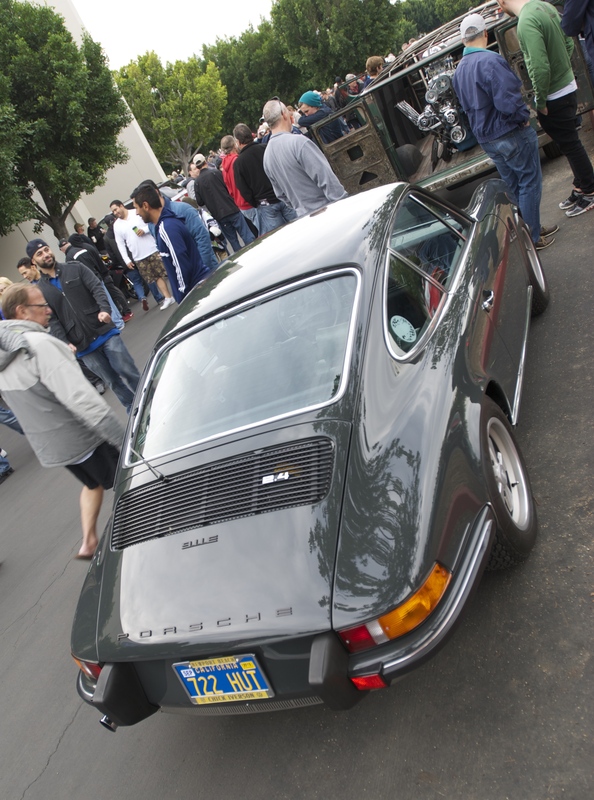 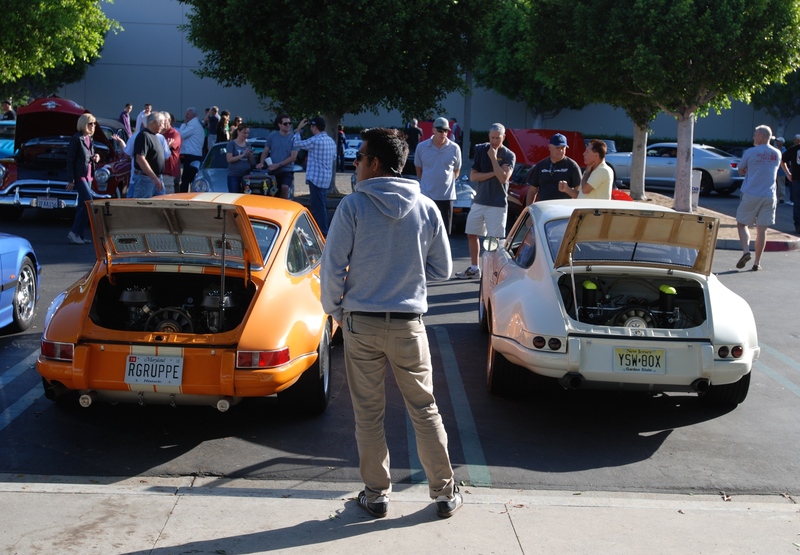 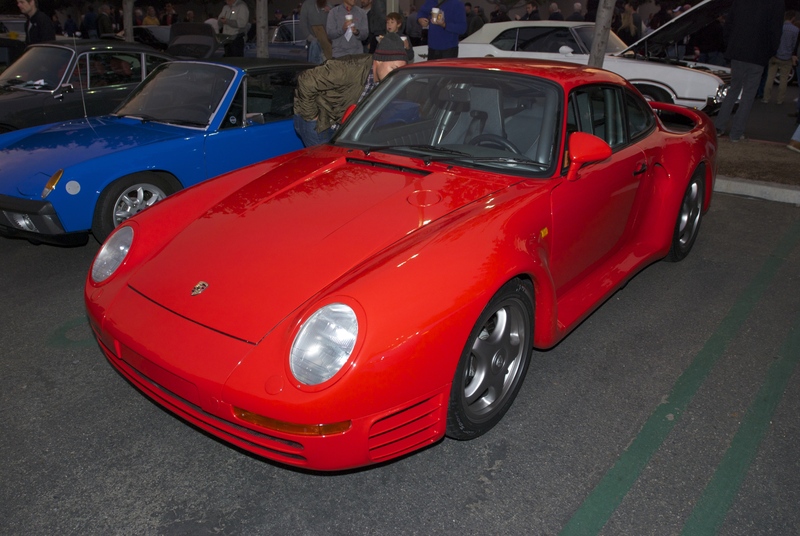 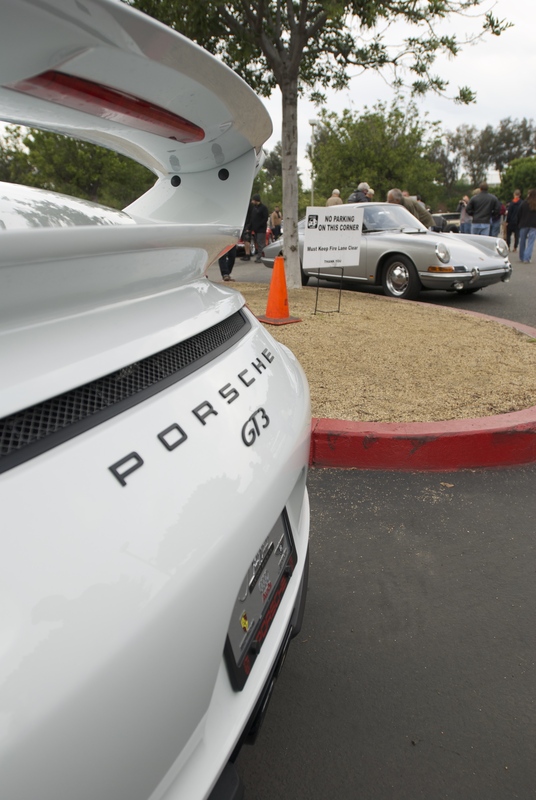 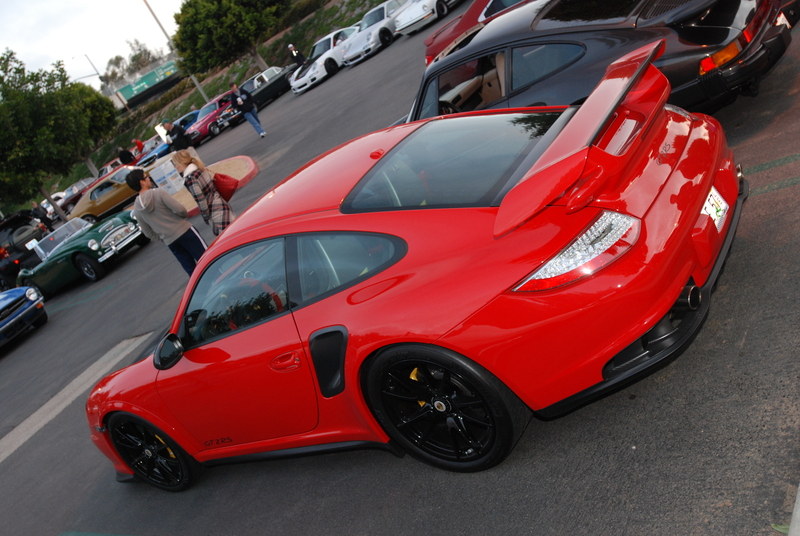 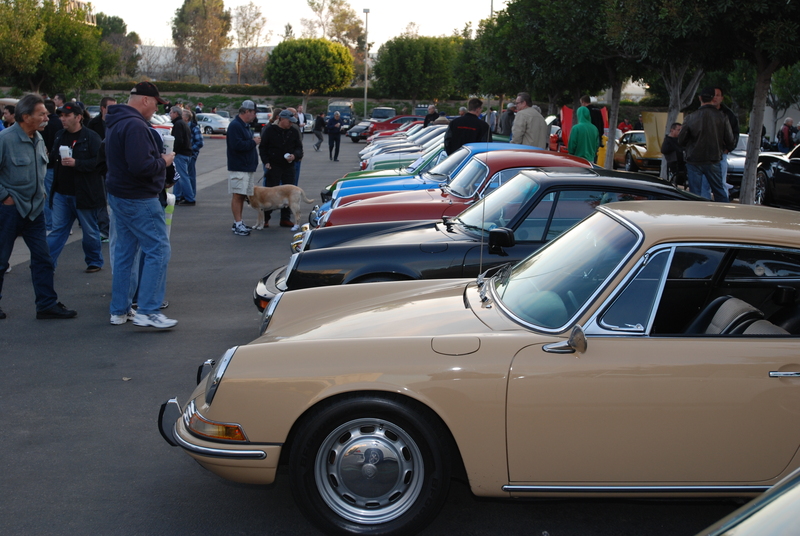 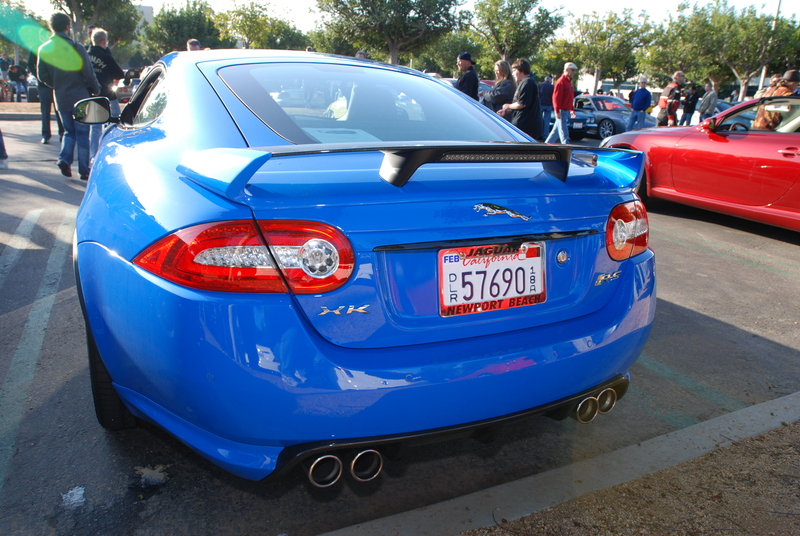 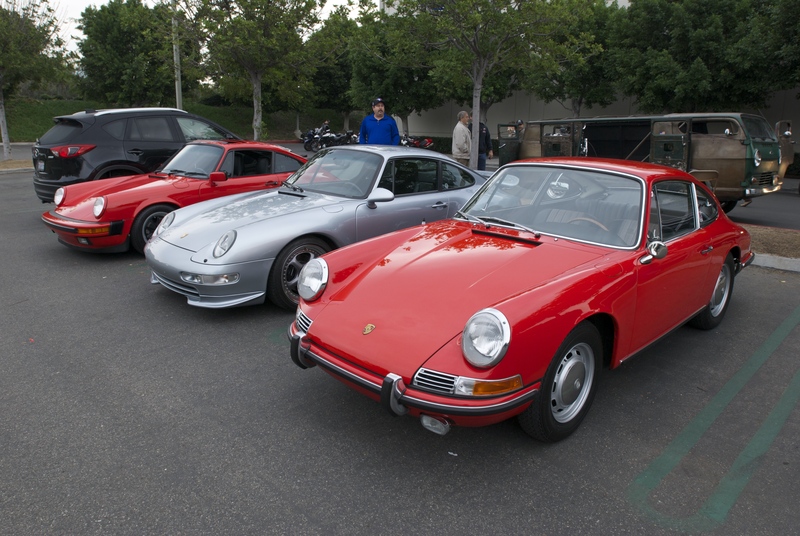 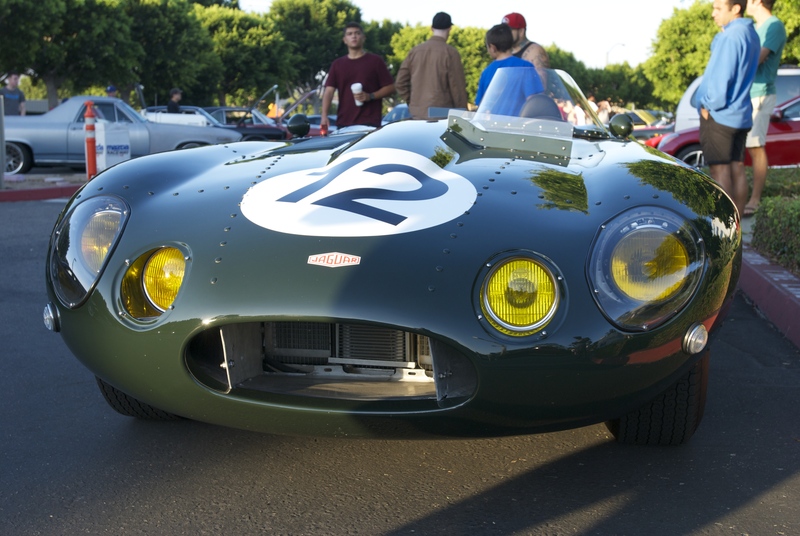 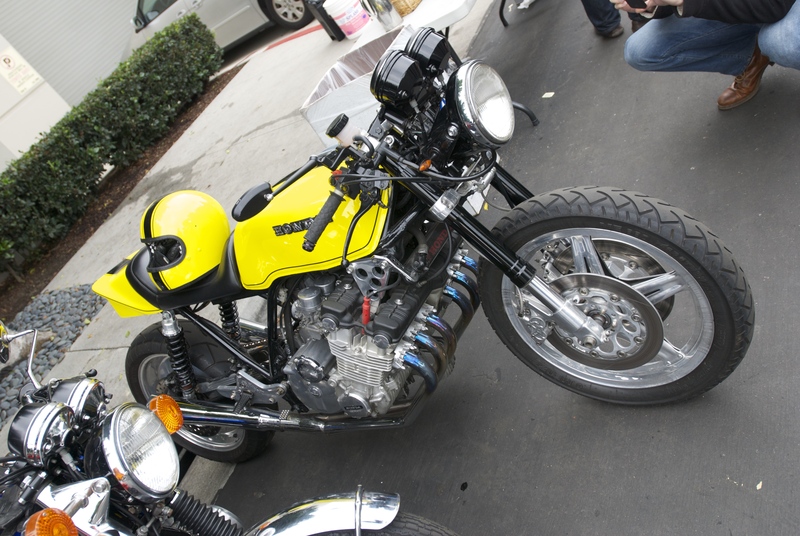 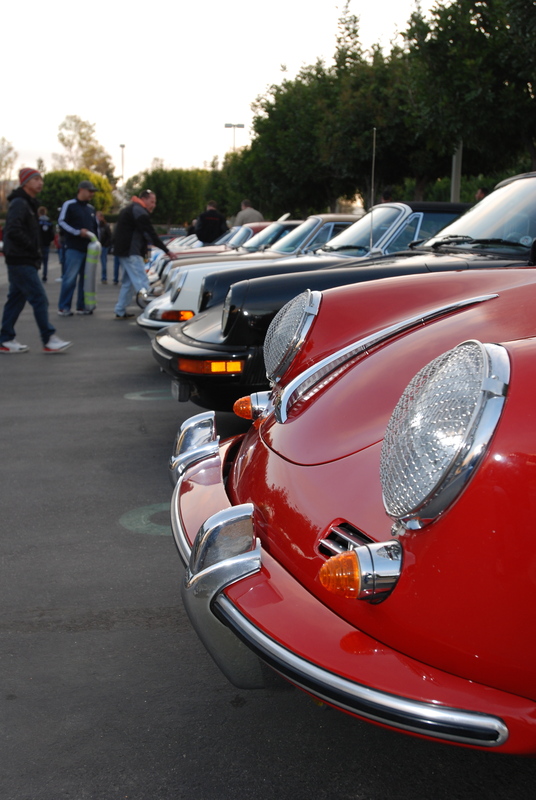 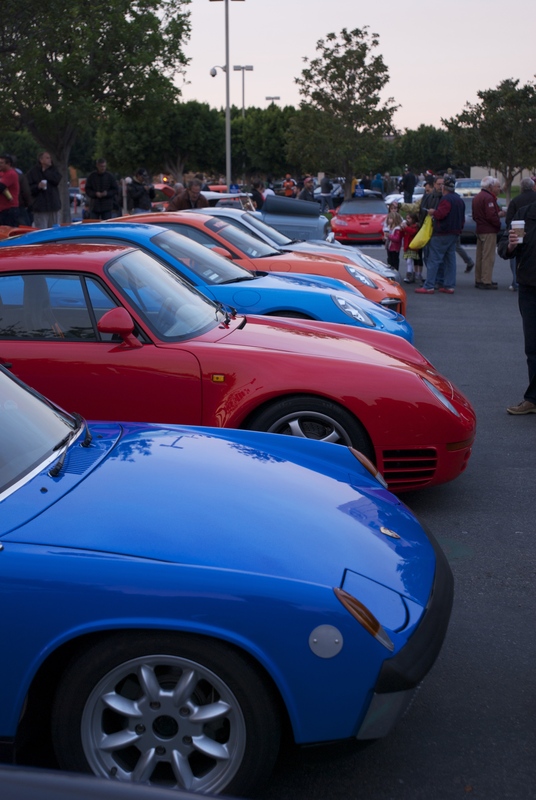 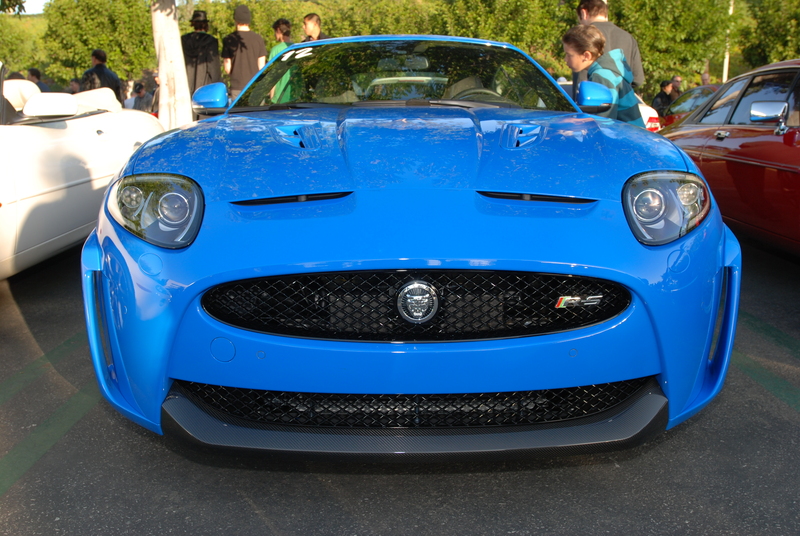 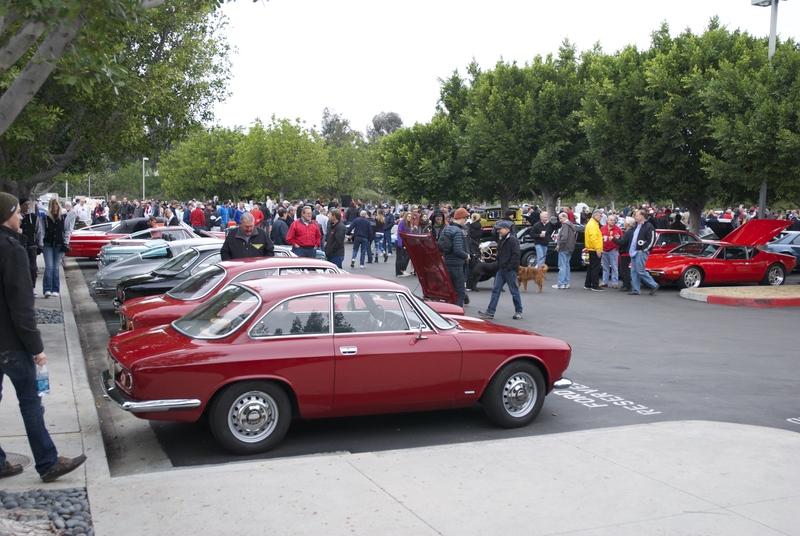 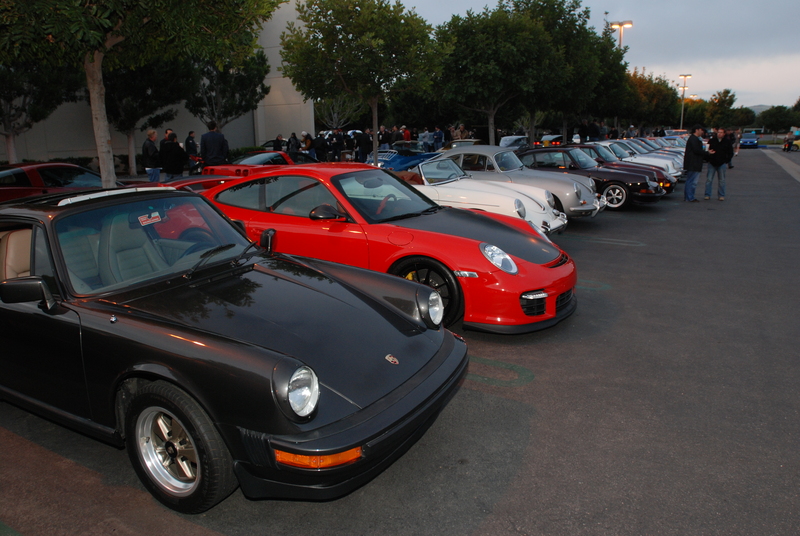 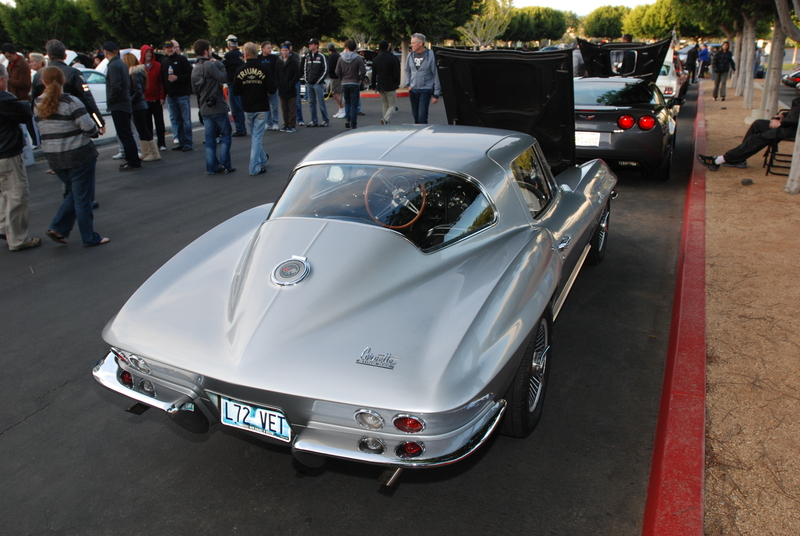 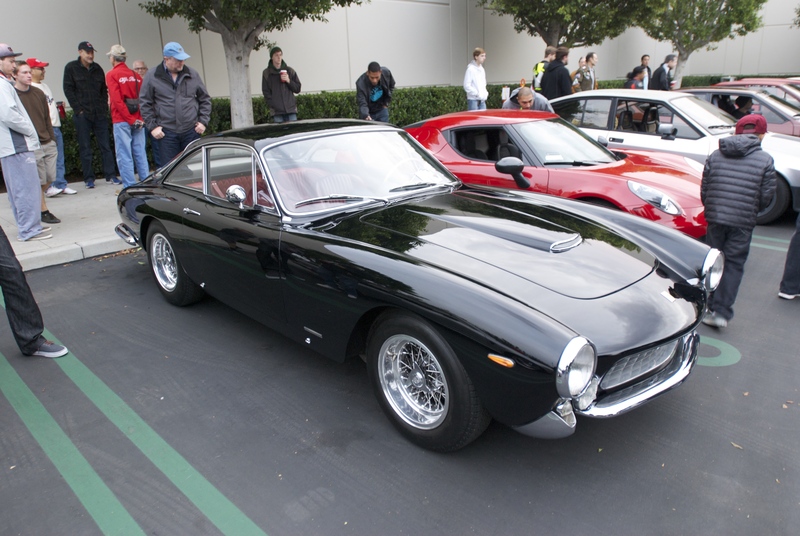 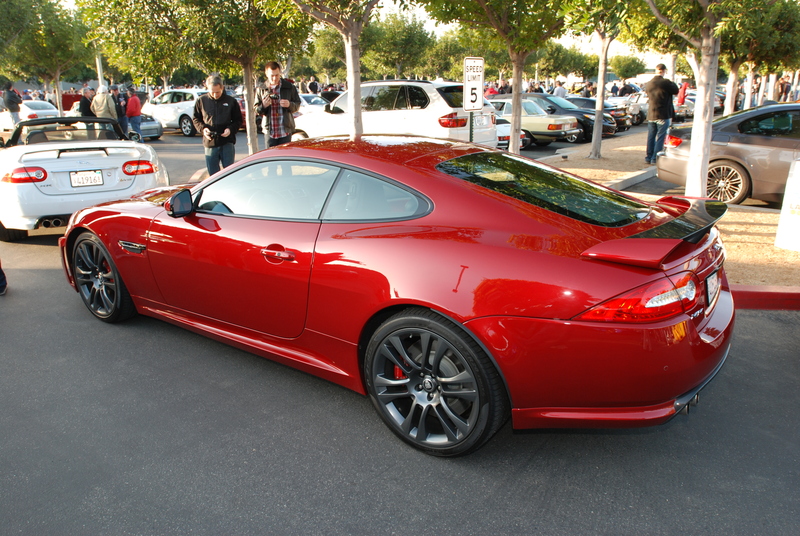 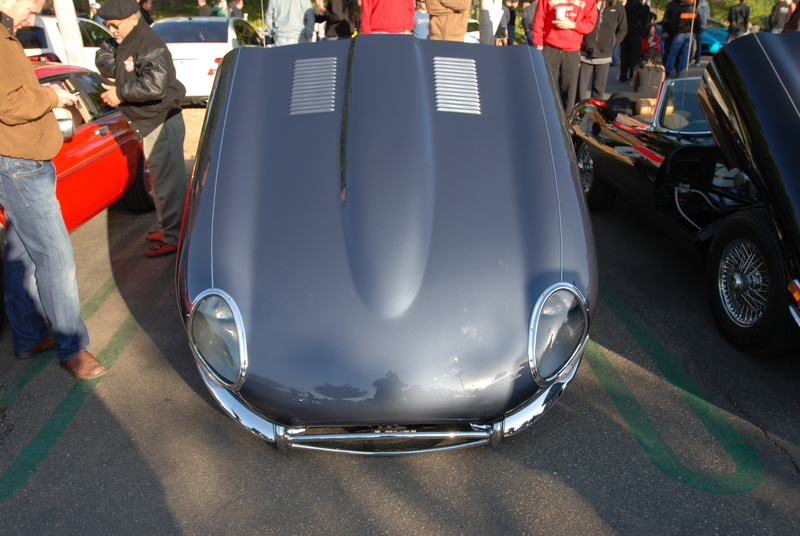 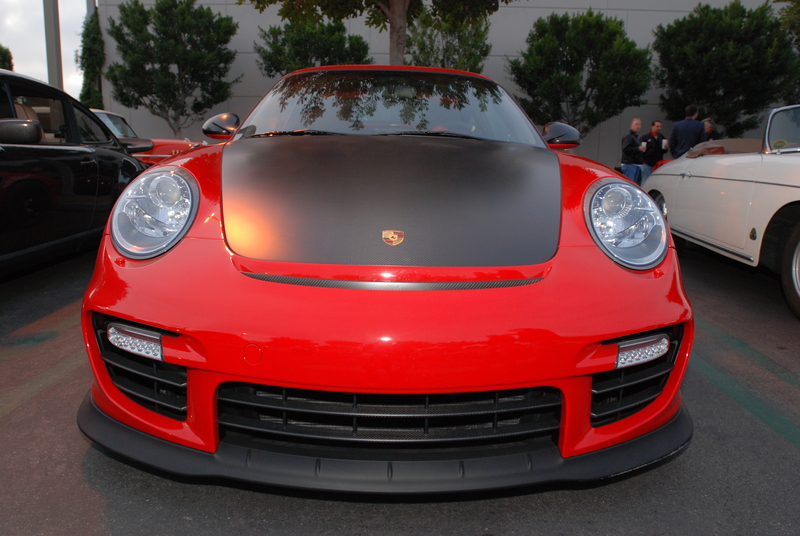 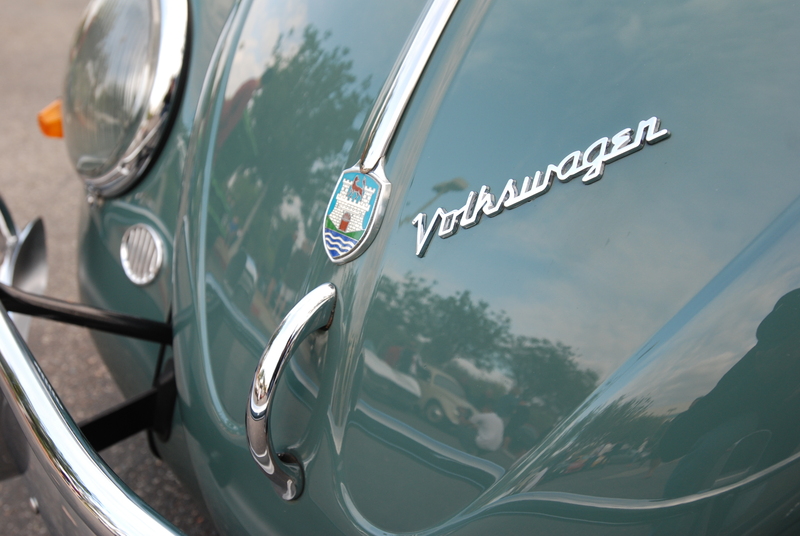 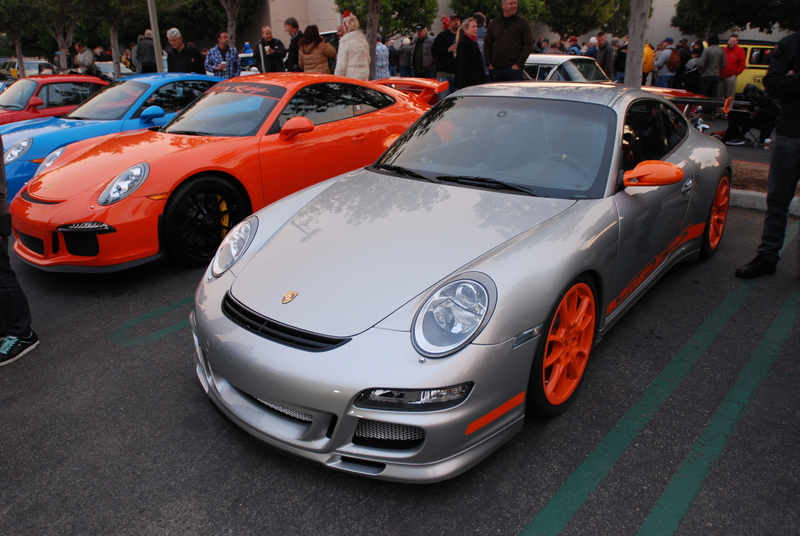 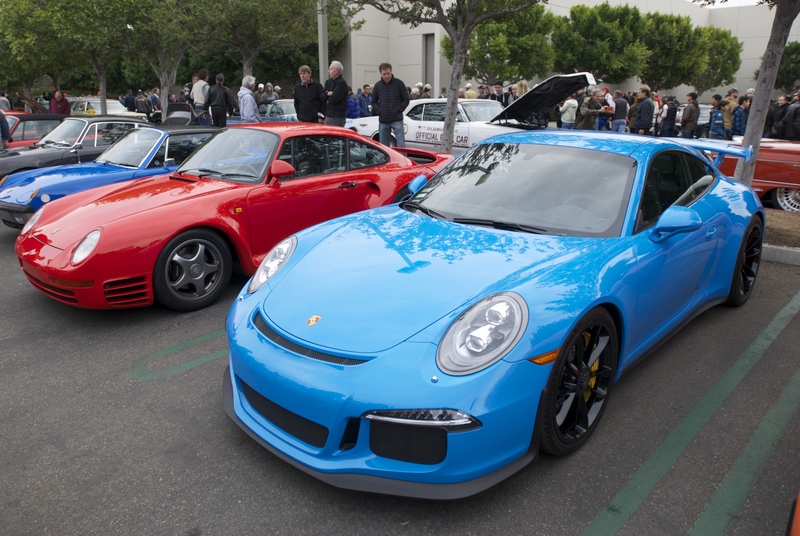 That’s the atmosphere experienced each and every week at Cars&Coffee, and this past Saturday was no exception. 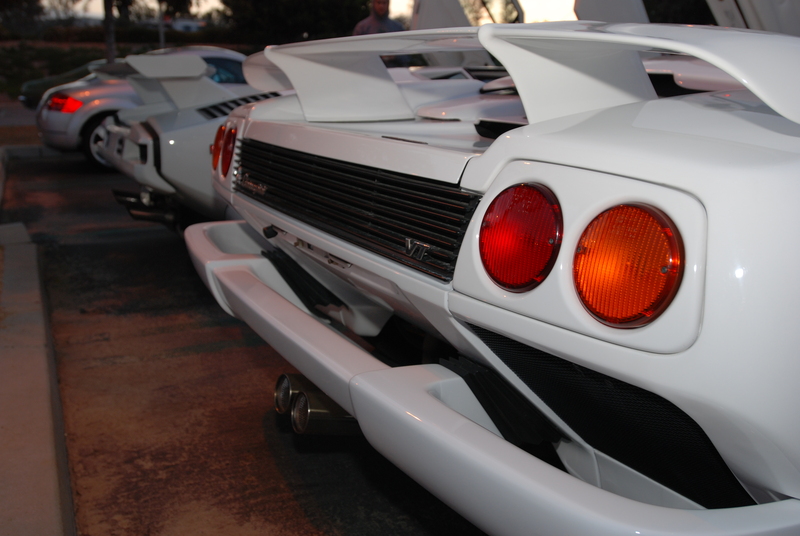 Under the cover of darkness, two white on white Lamborghini’s rumbled in, circled the lot and parked side by side. 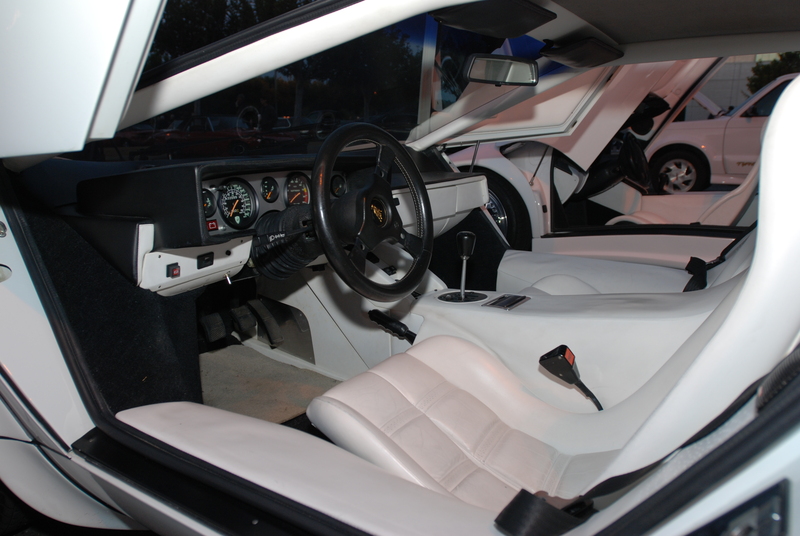 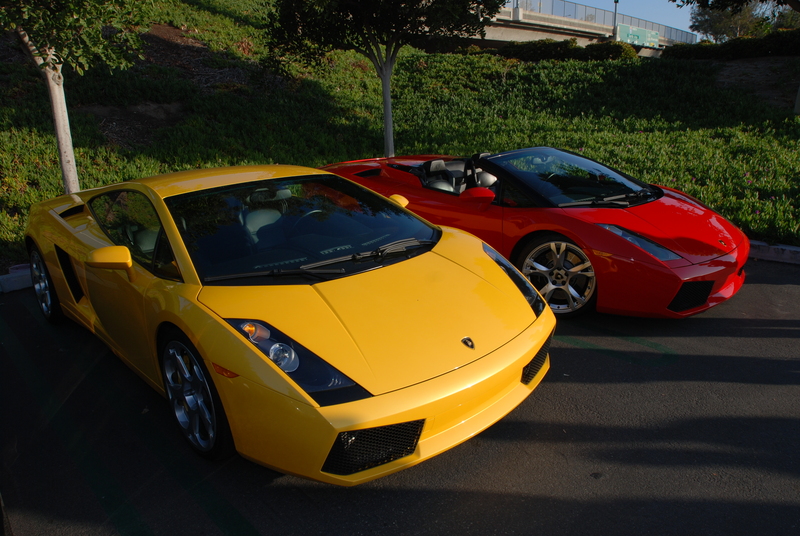 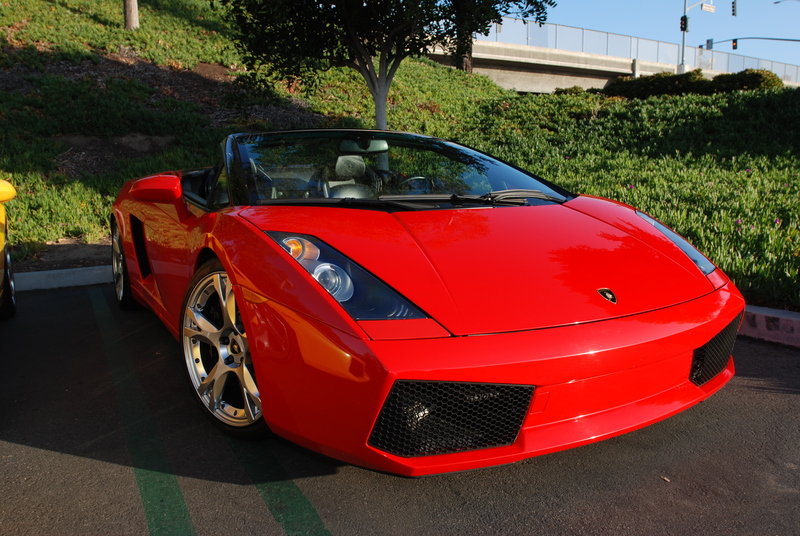 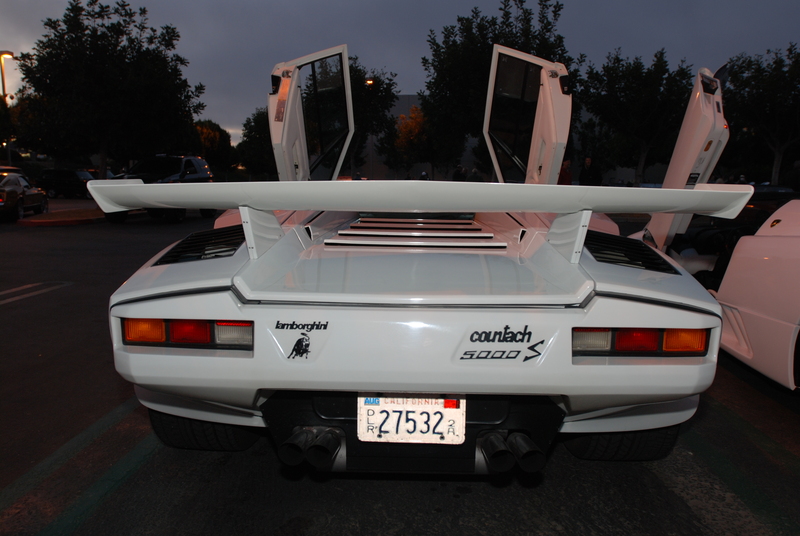 One was an early Countach 5000 S, and the second, a Diablo VT Roadster. 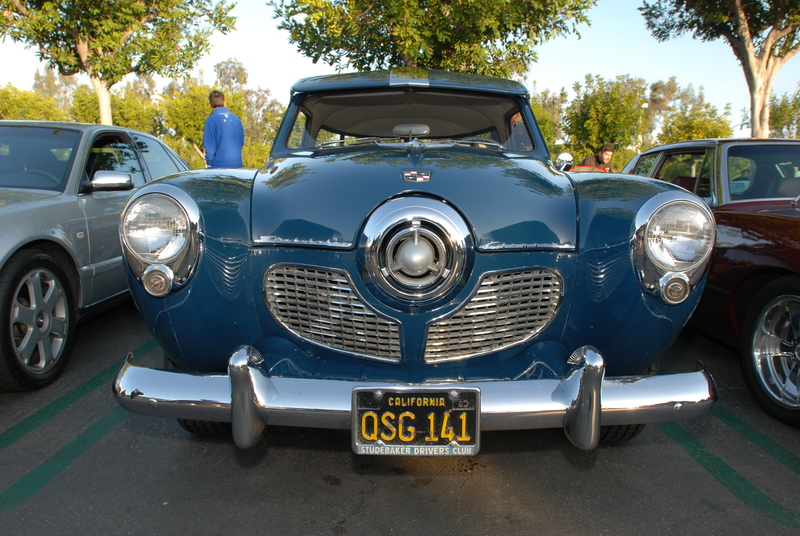 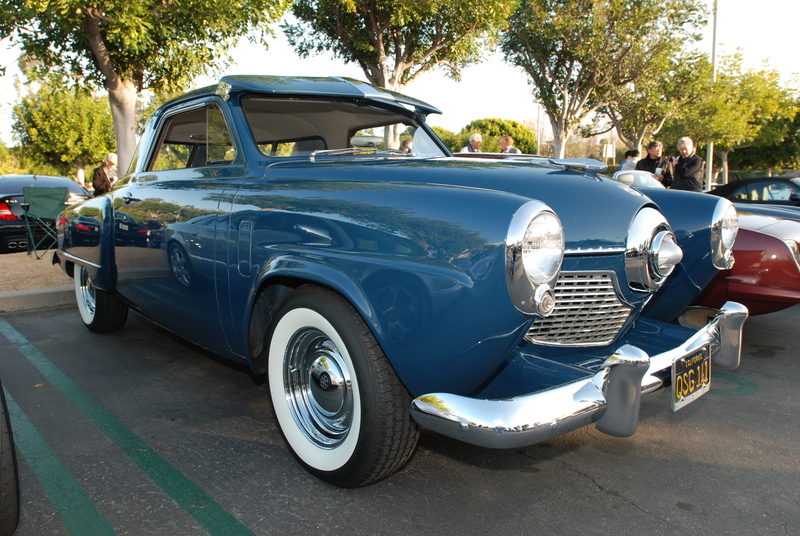 Perhaps a P-38 lightning influenced front end?